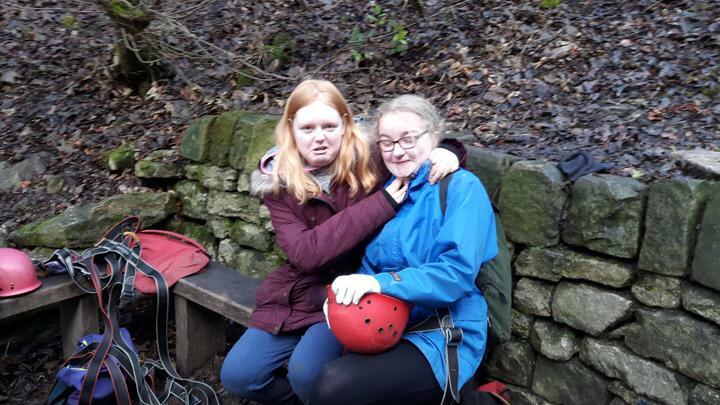 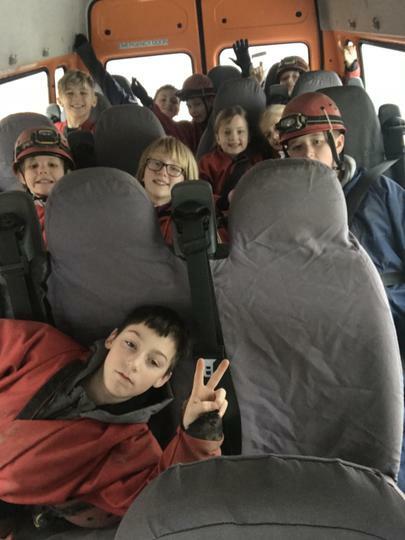 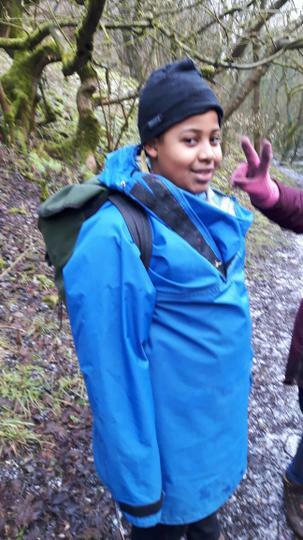 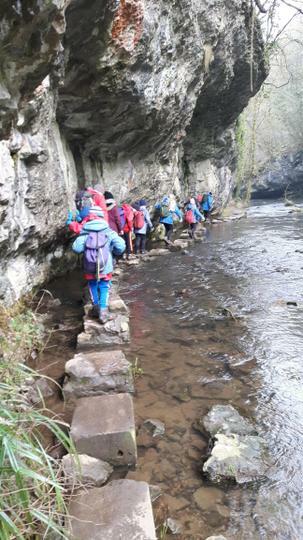 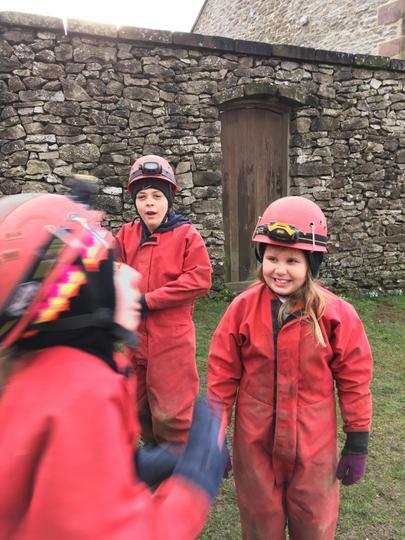 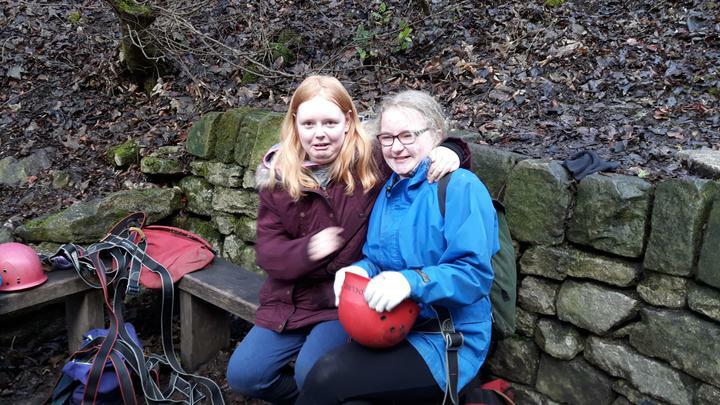 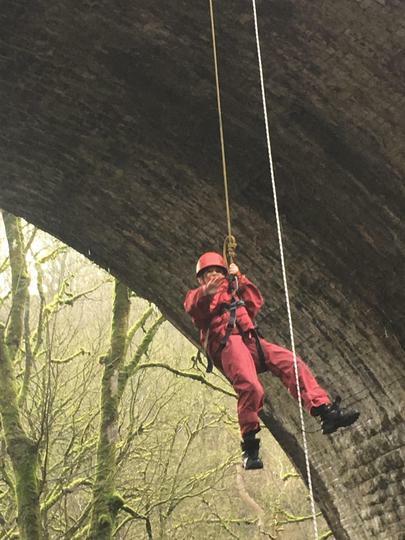 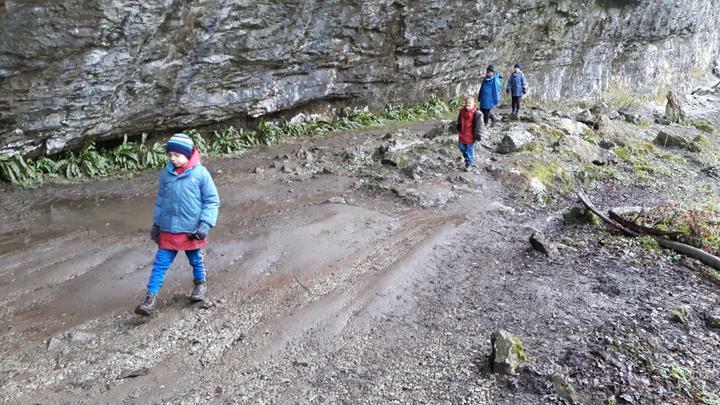 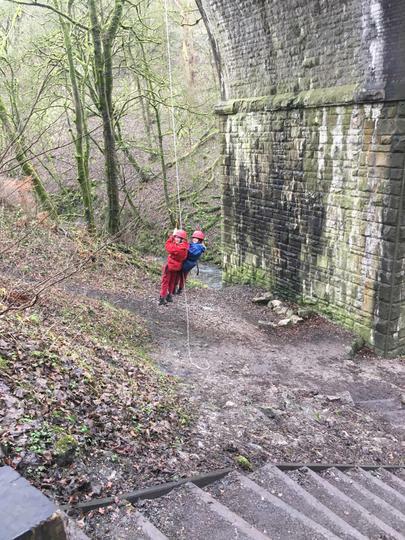 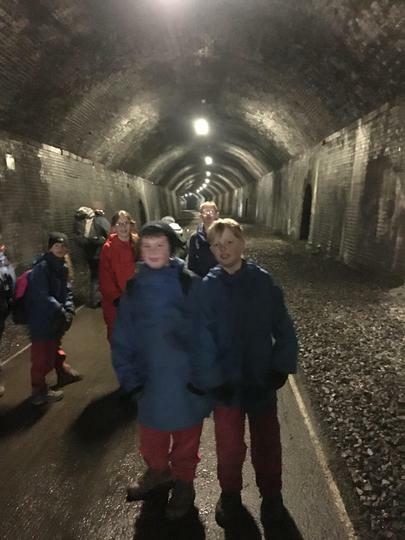 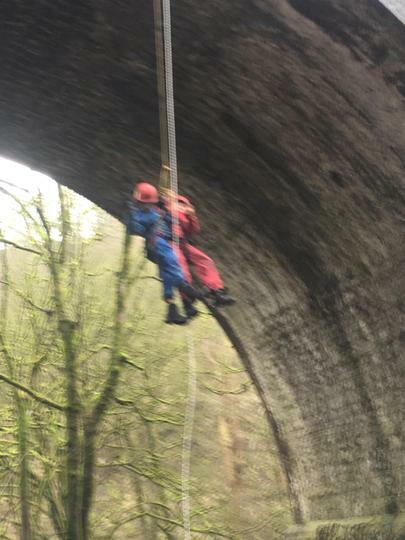 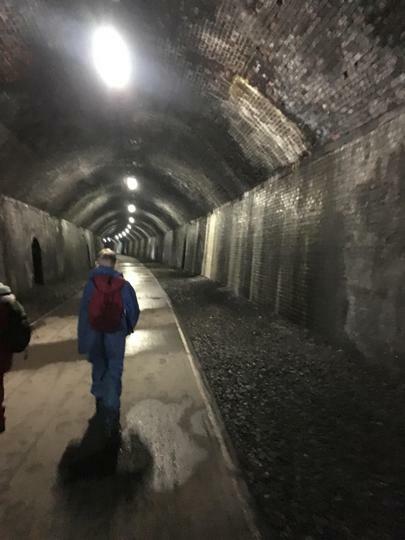 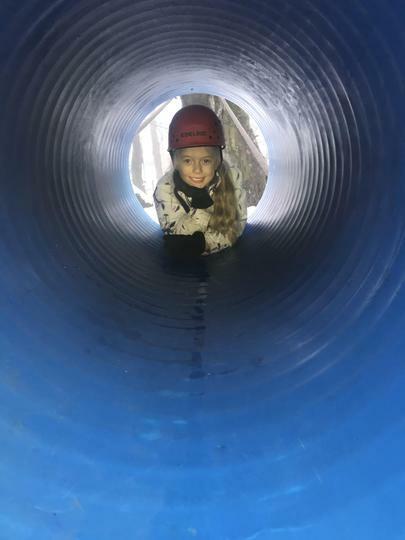 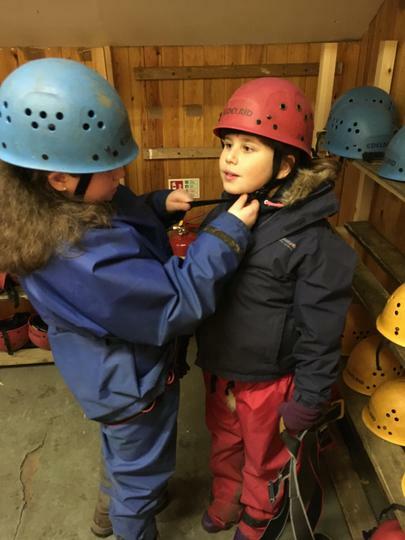 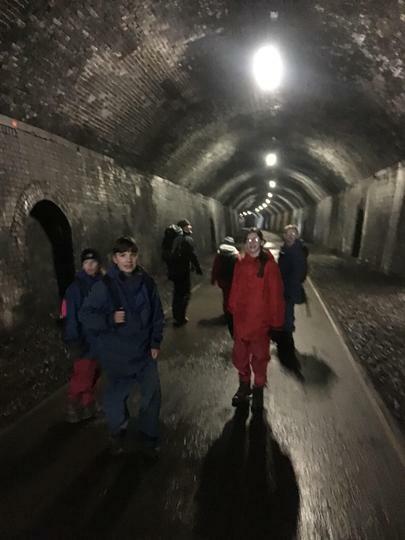 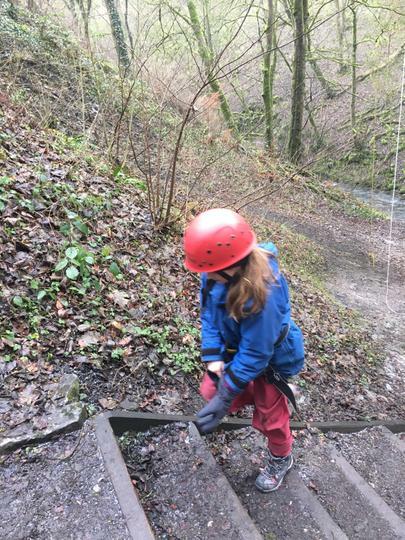 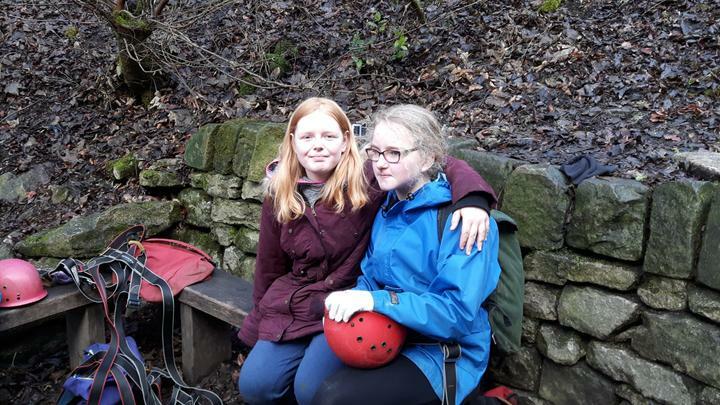 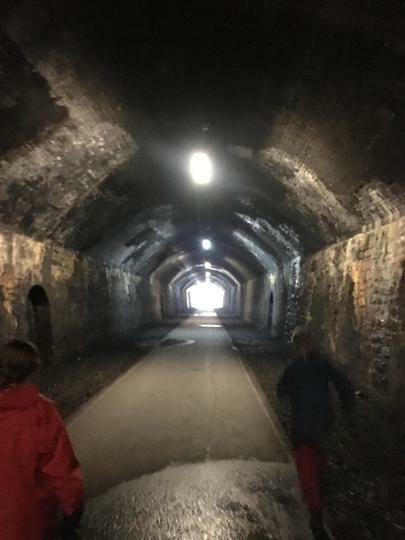 Group B- today we have been caving, despite several children being nervous, we did fantastic and completed all the challenges, travelling right round the cave! 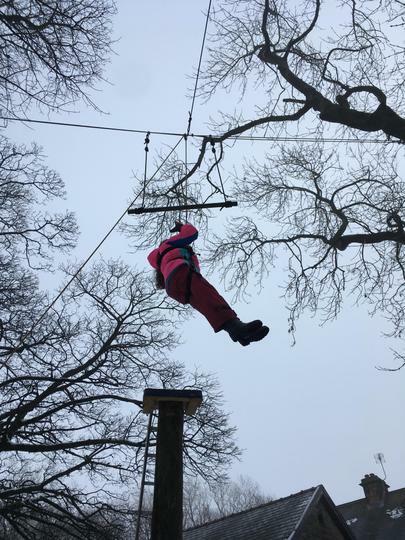 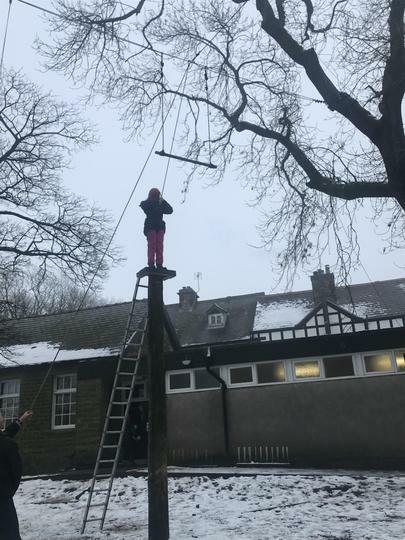 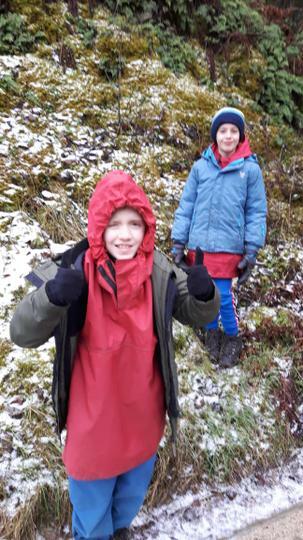 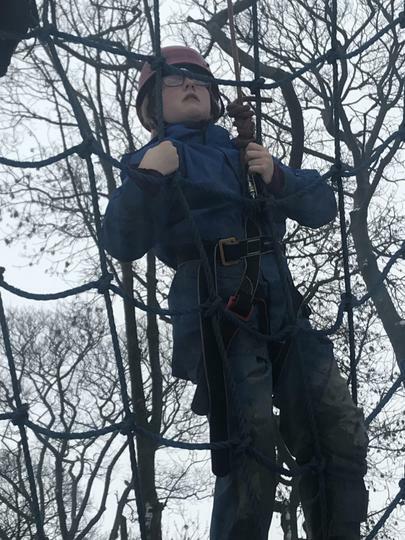 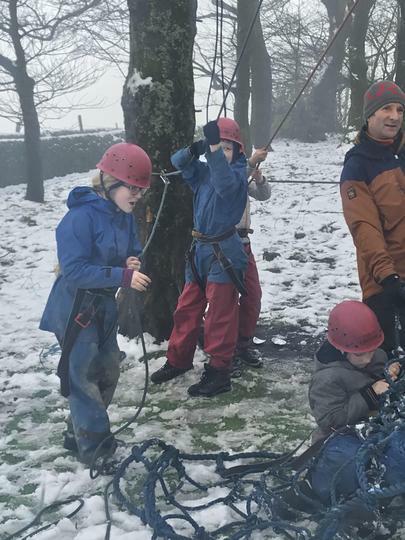 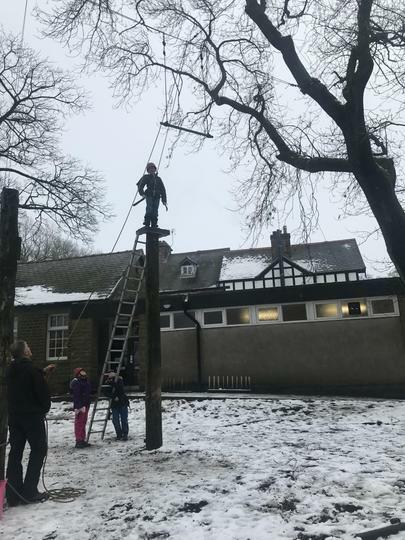 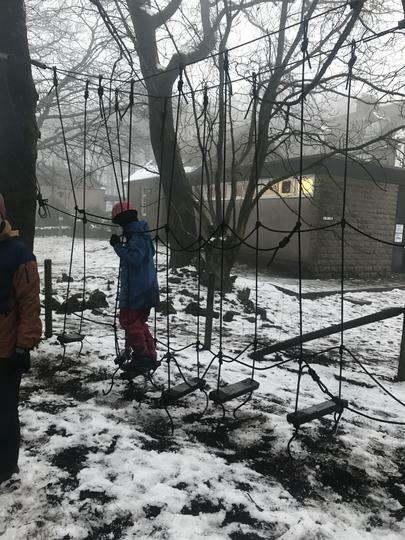 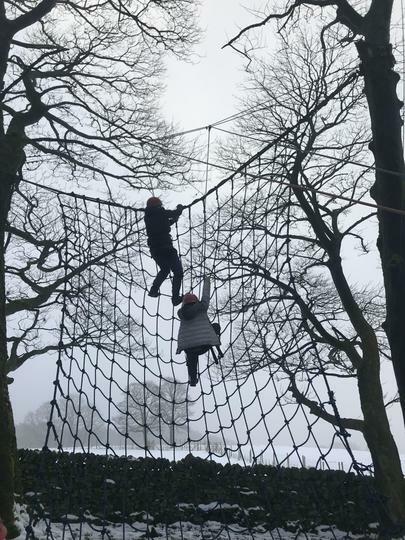 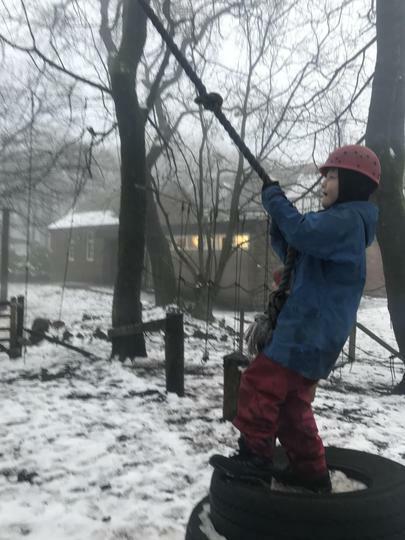 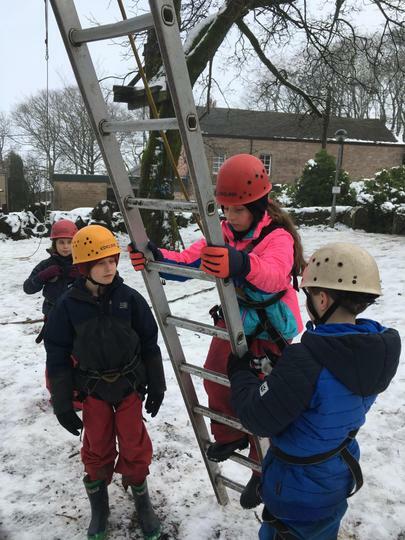 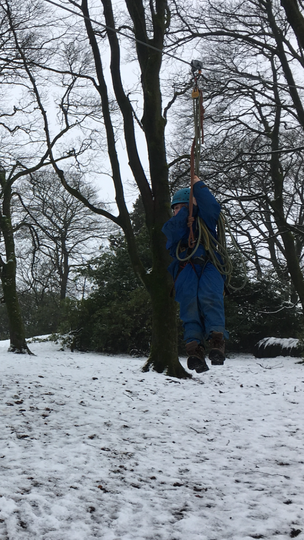 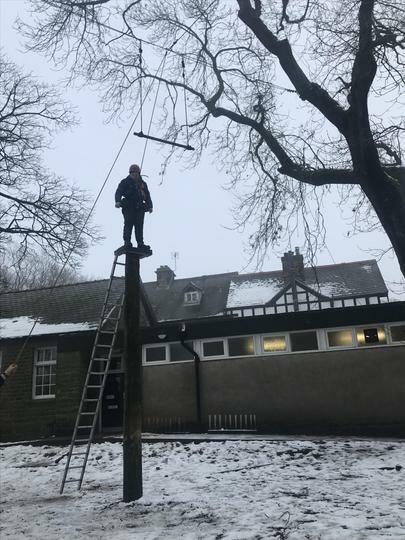 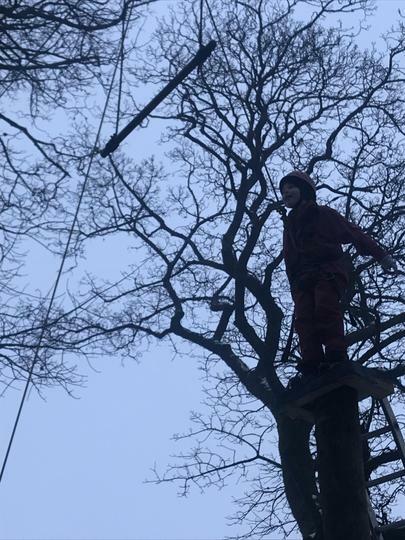 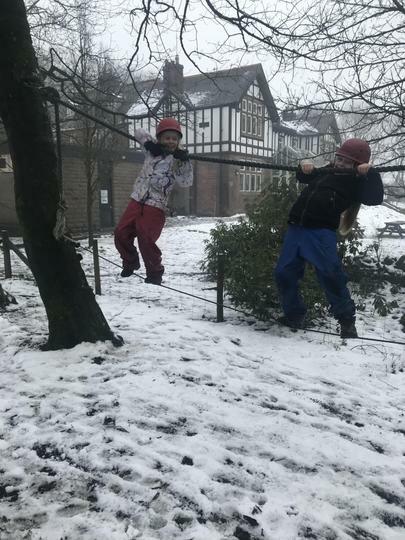 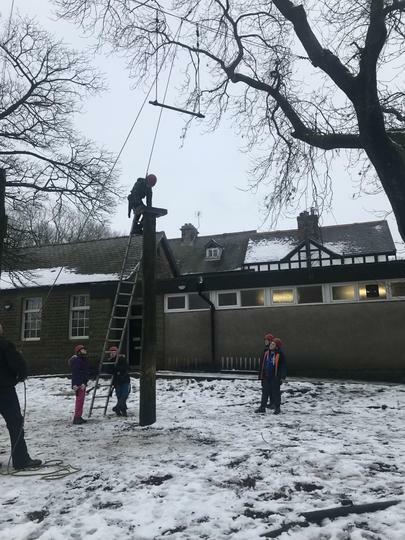 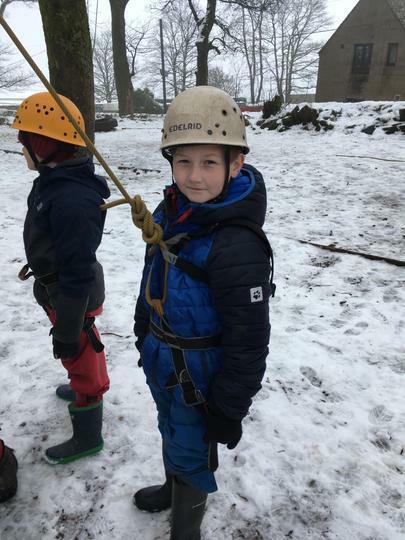 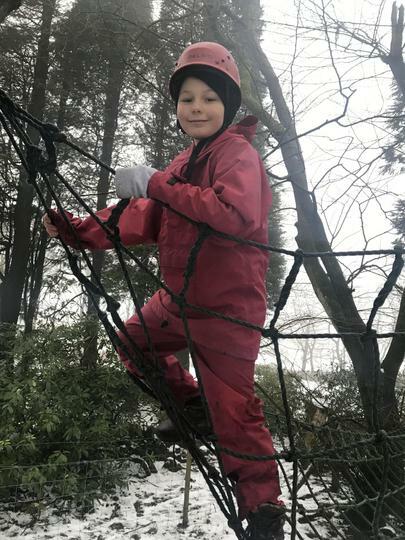 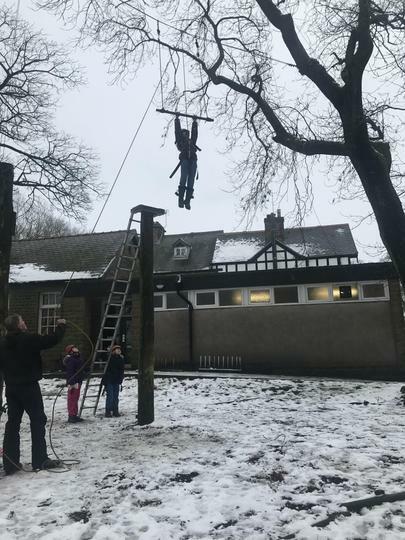 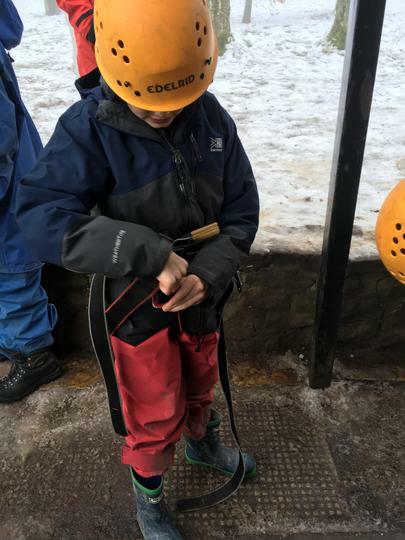 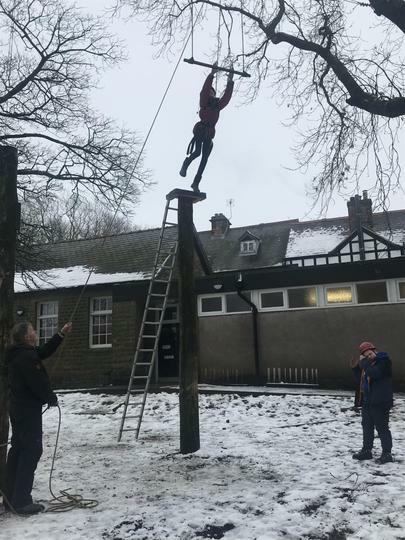 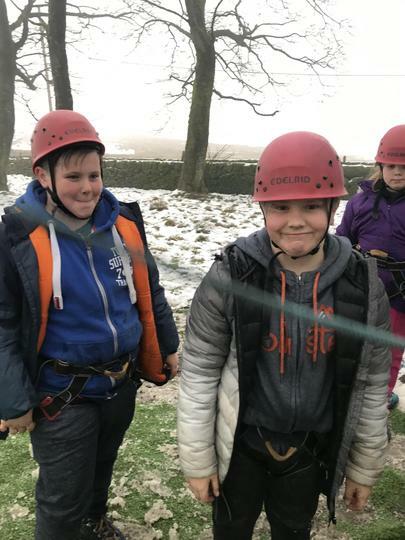 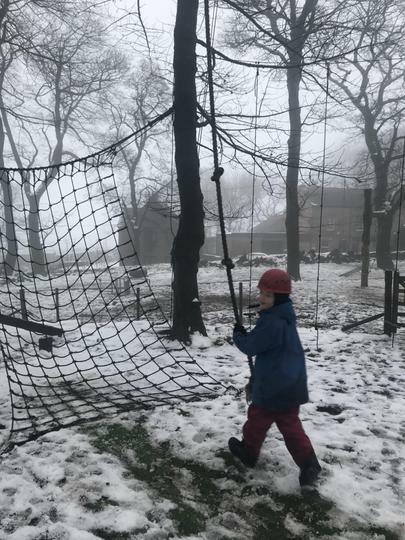 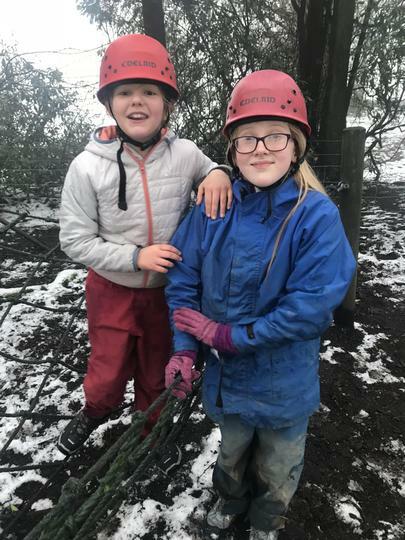 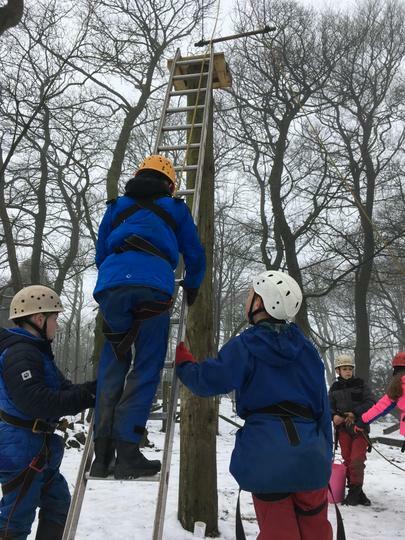 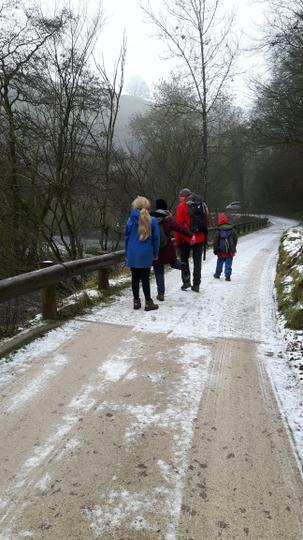 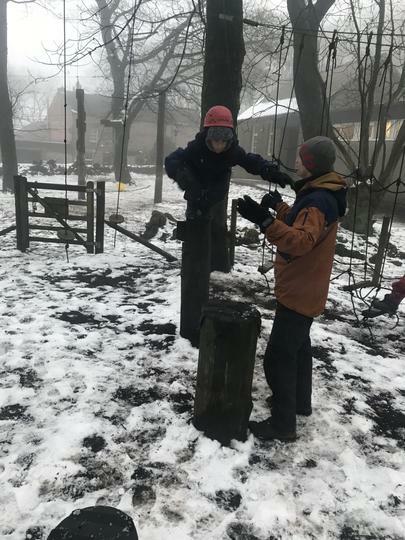 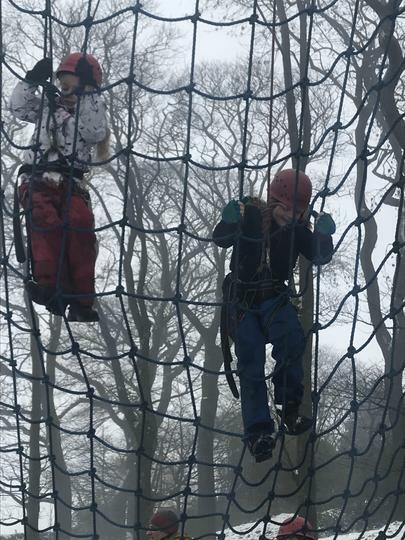 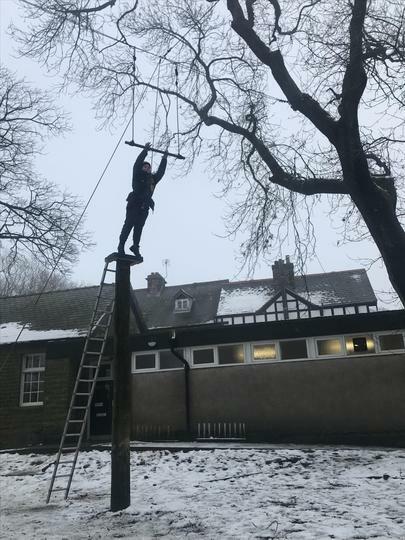 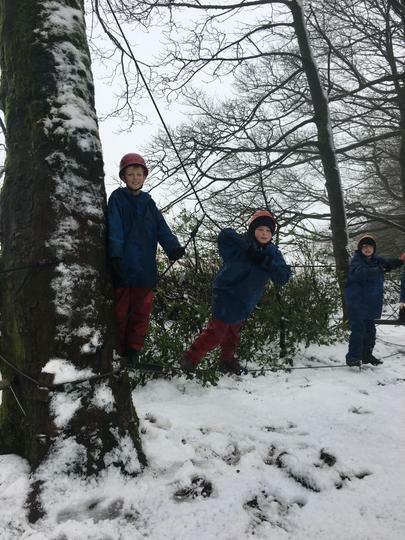 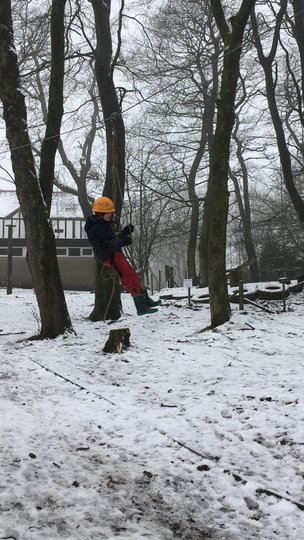 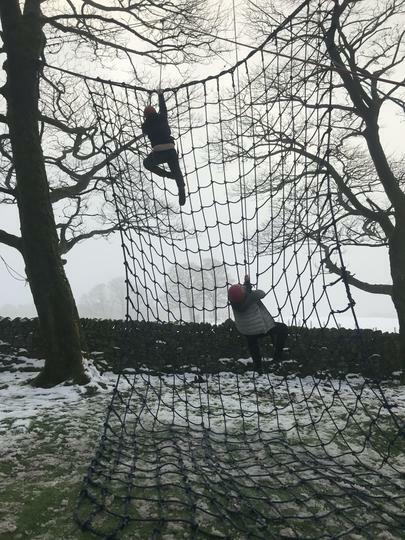 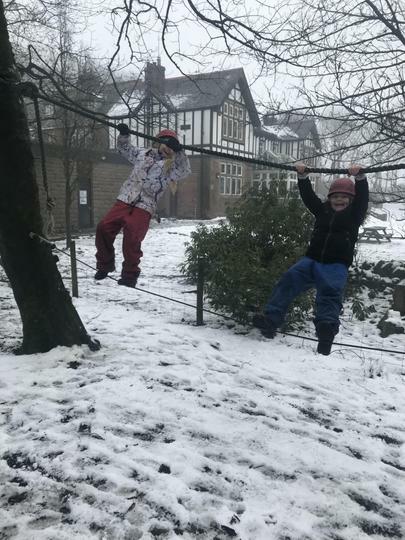 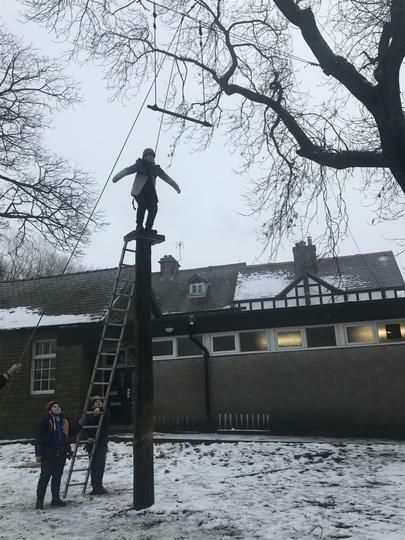 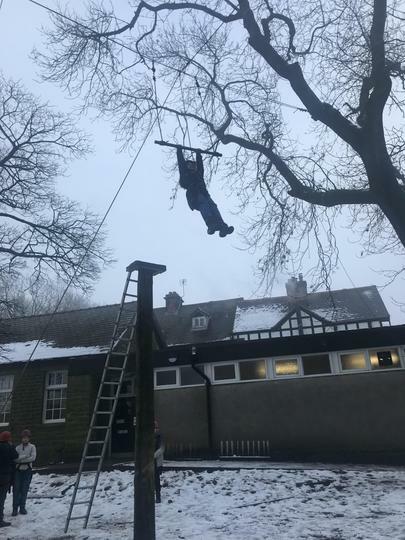 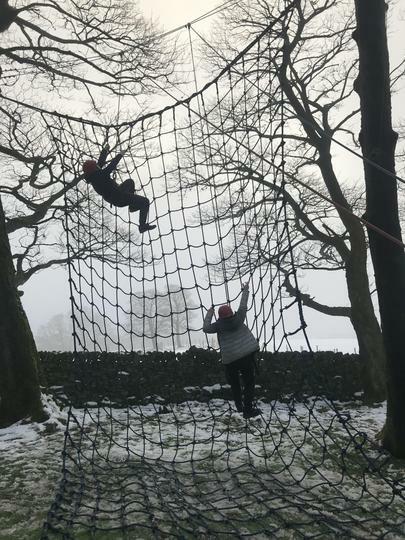 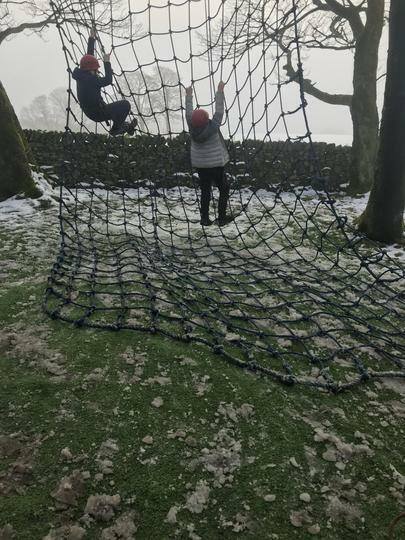 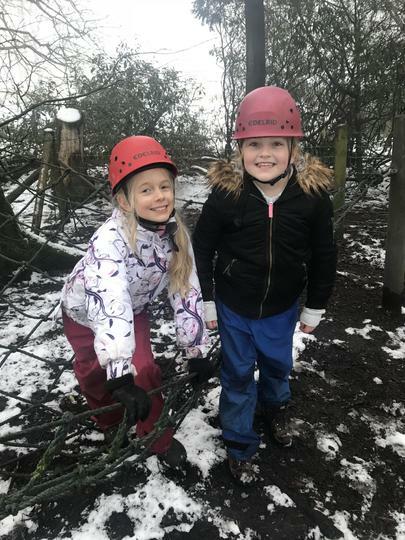 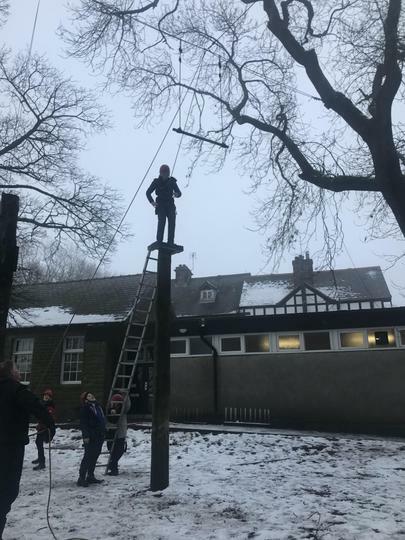 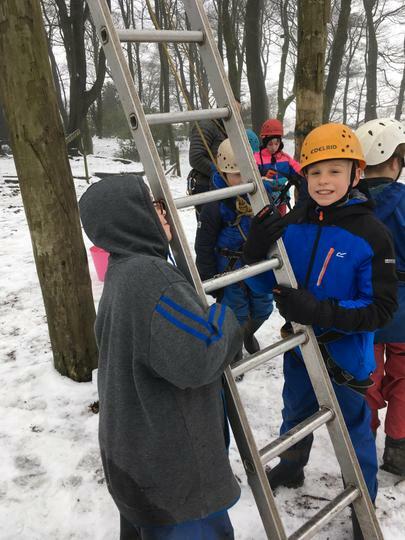 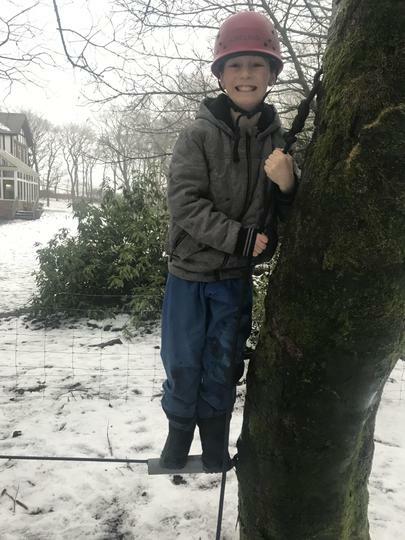 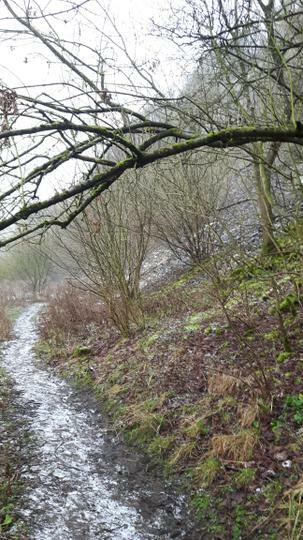 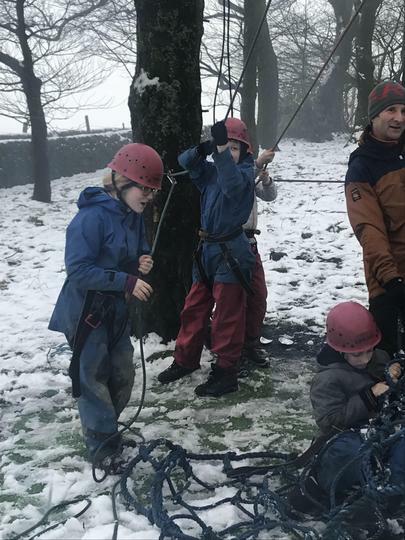 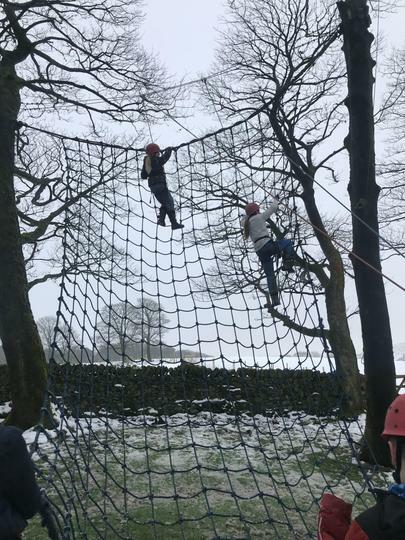 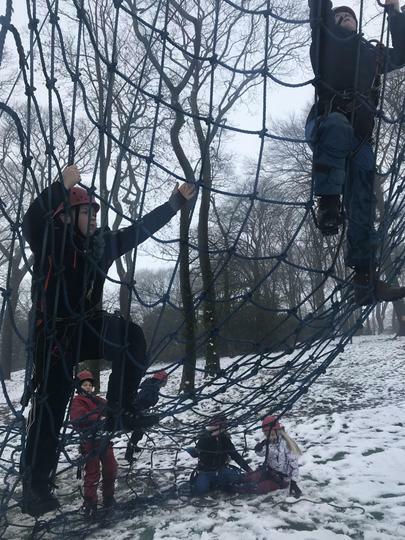 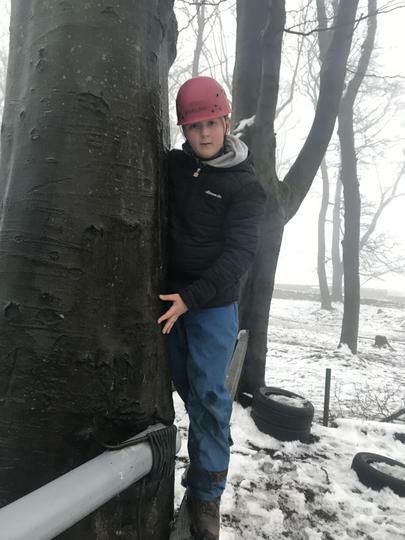 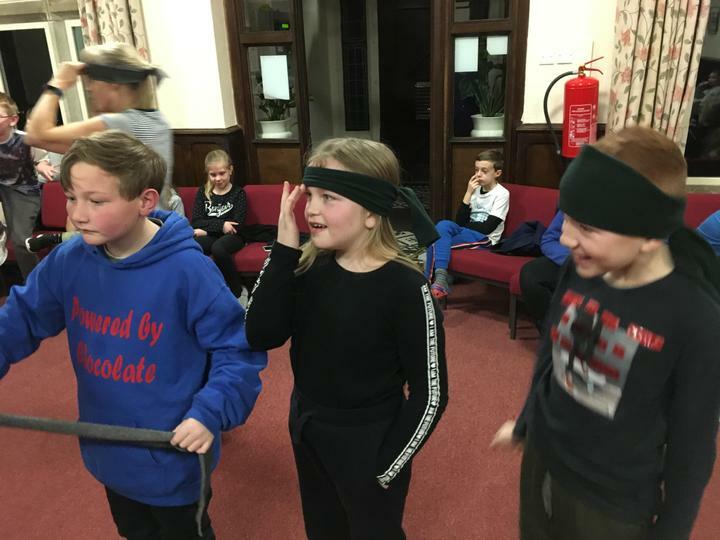 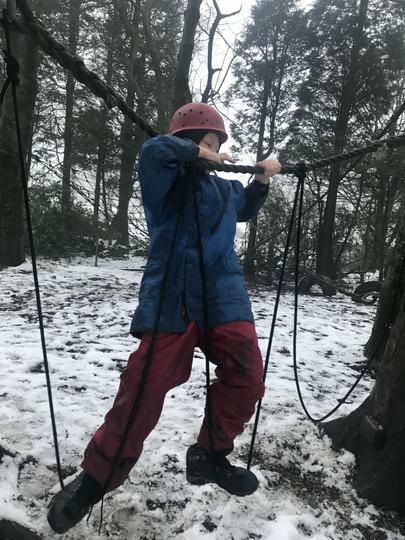 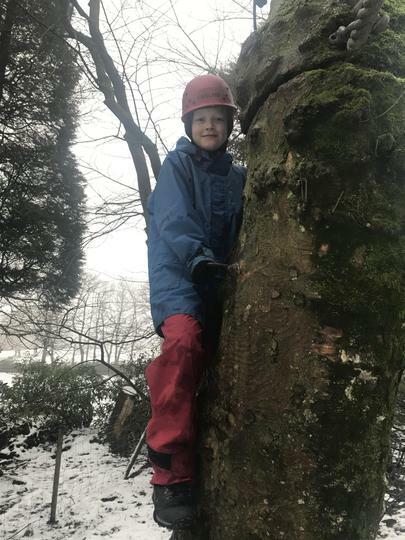 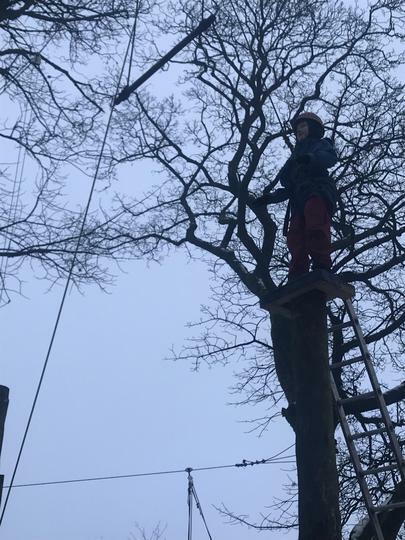 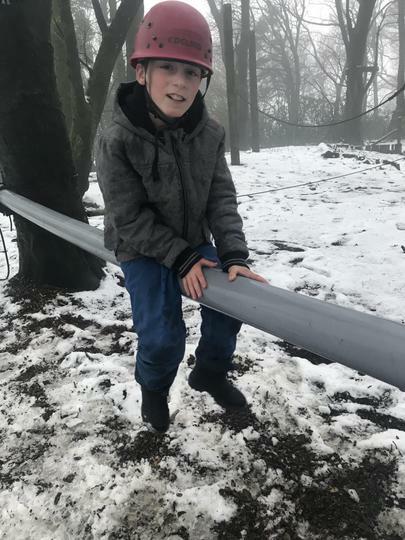 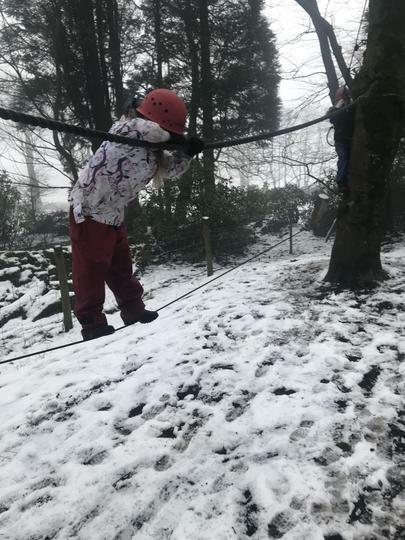 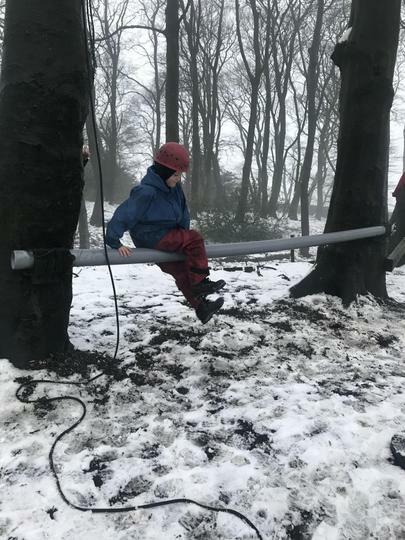 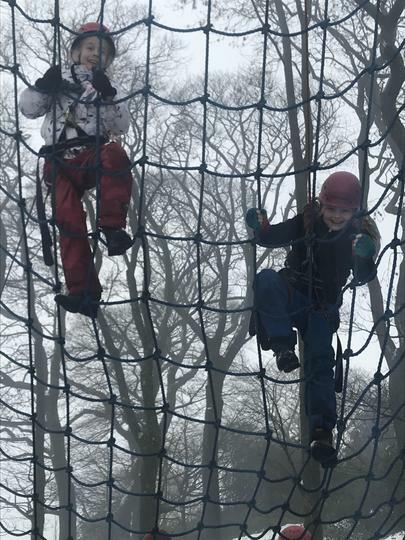 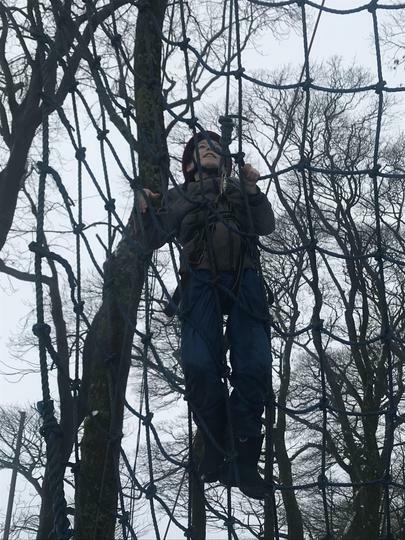 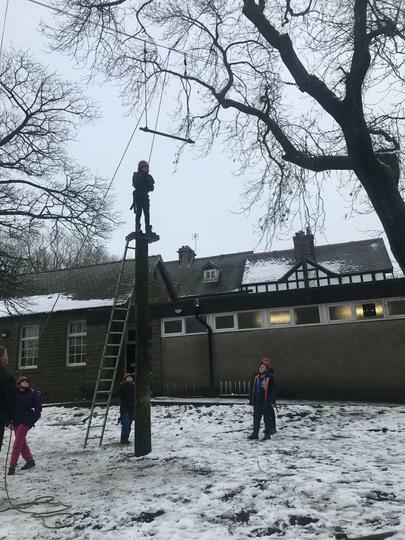 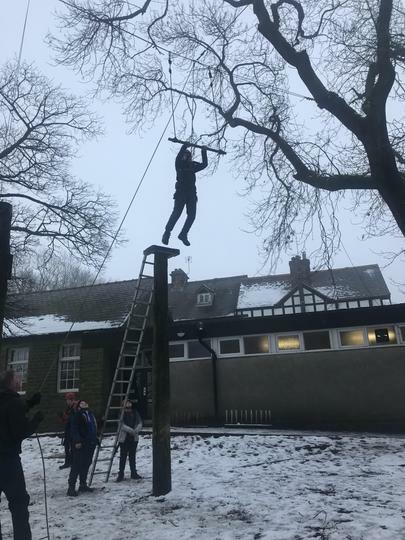 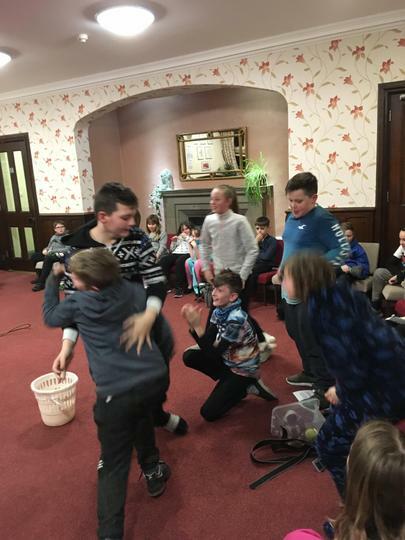 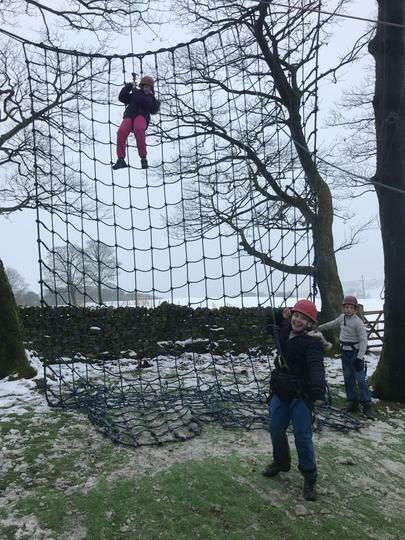 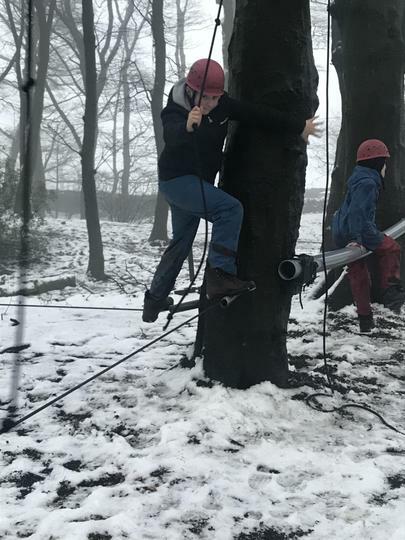 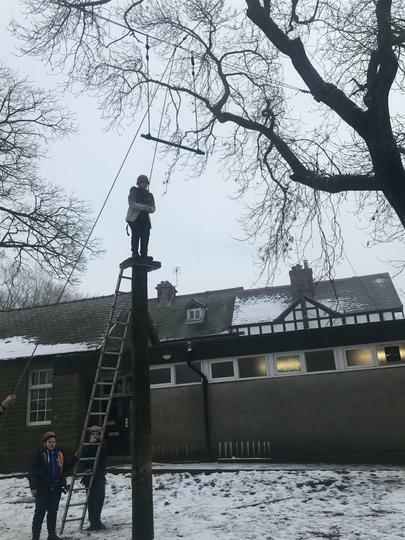 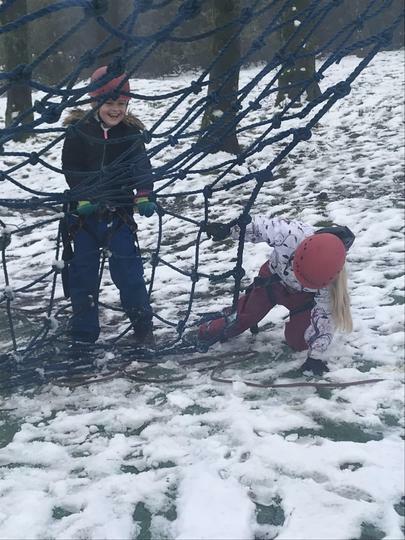 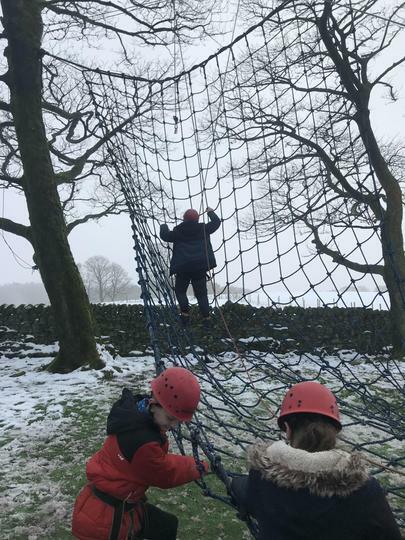 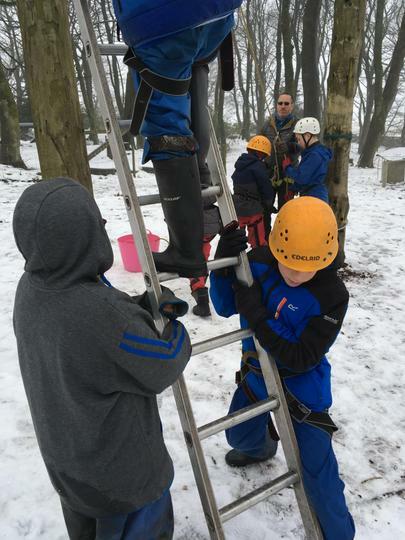 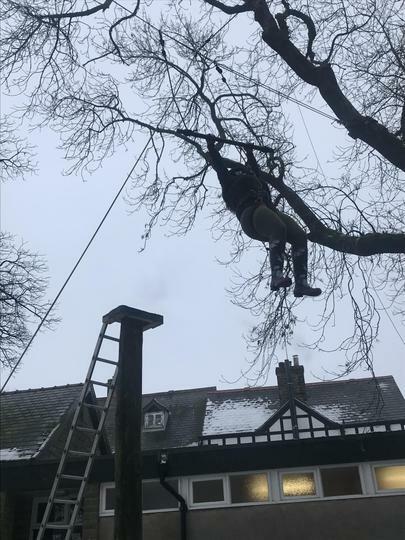 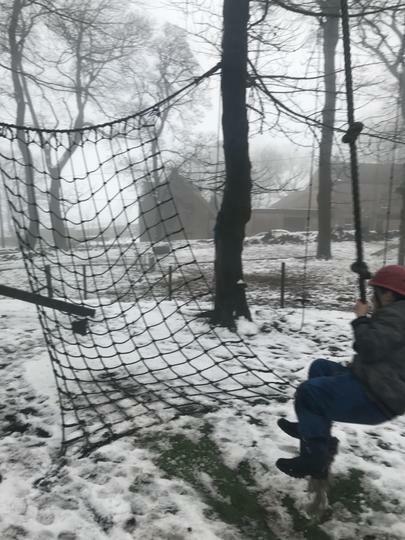 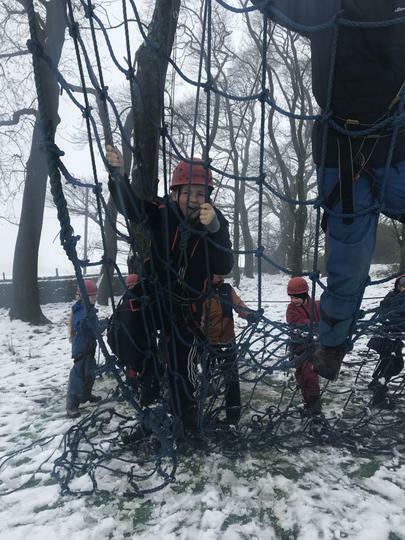 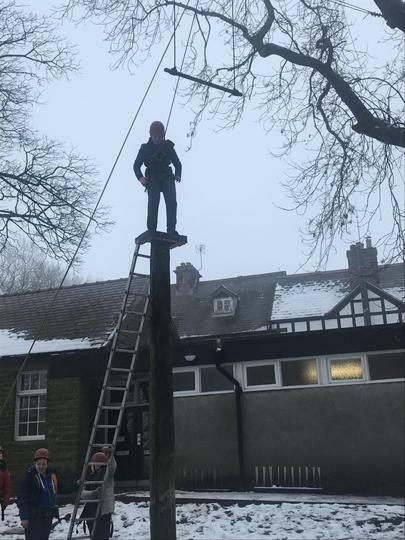 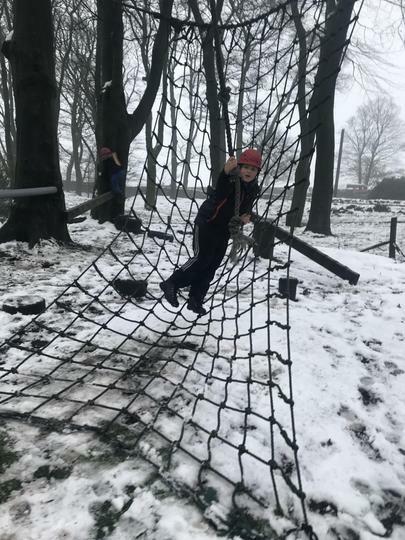 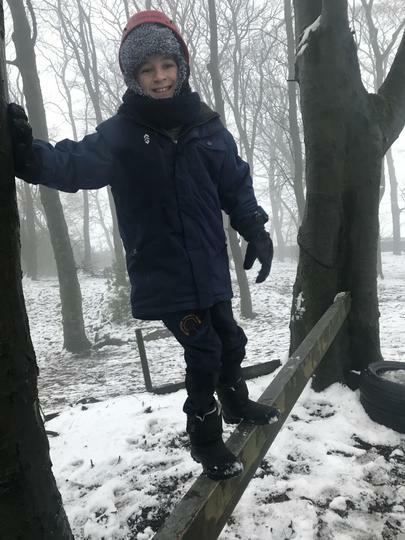 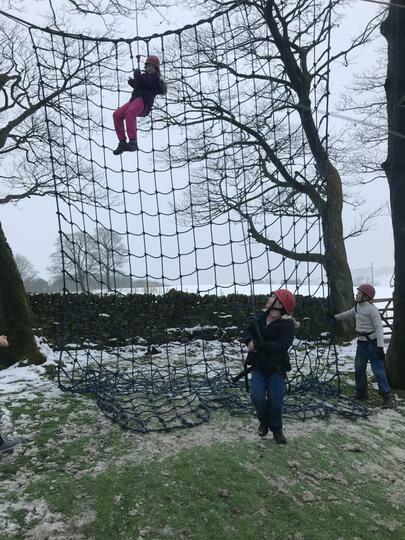 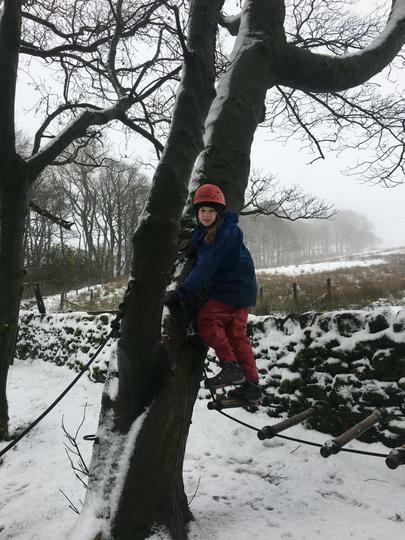 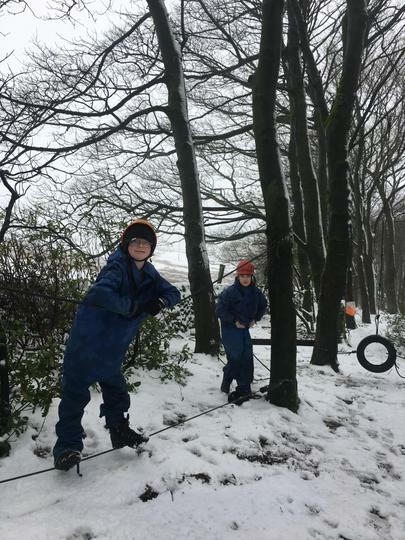 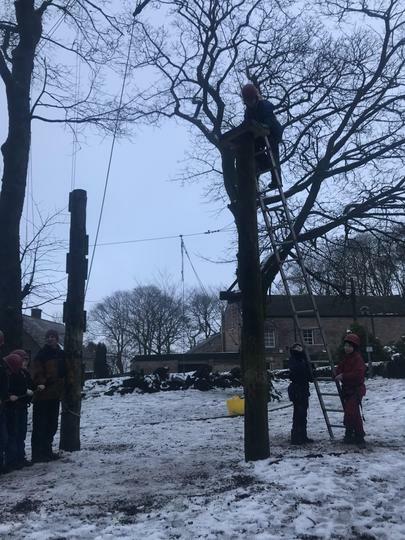 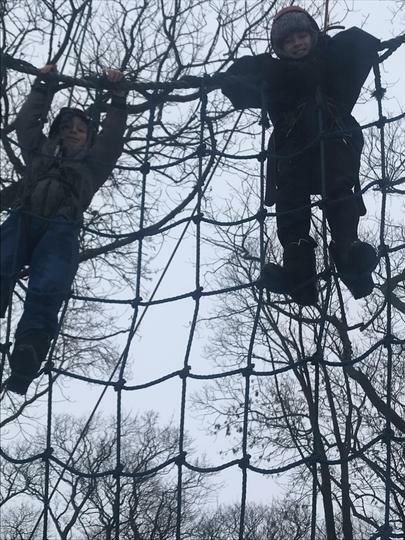 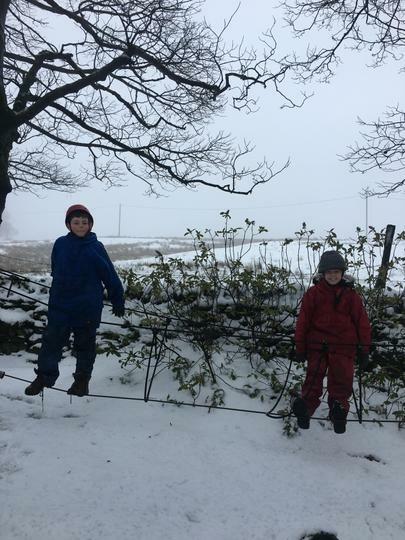 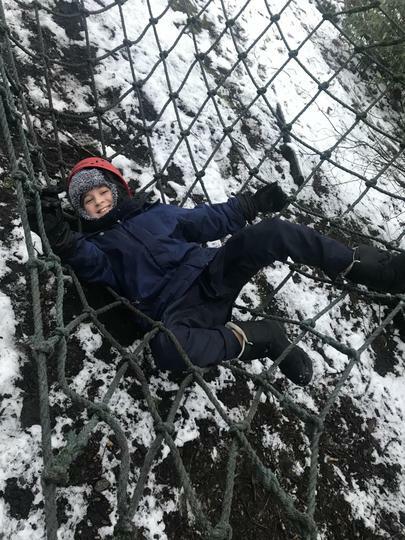 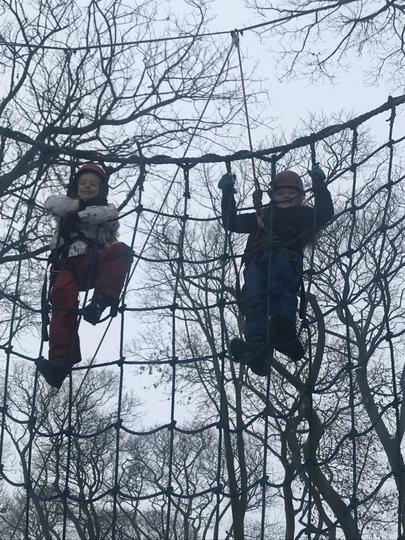 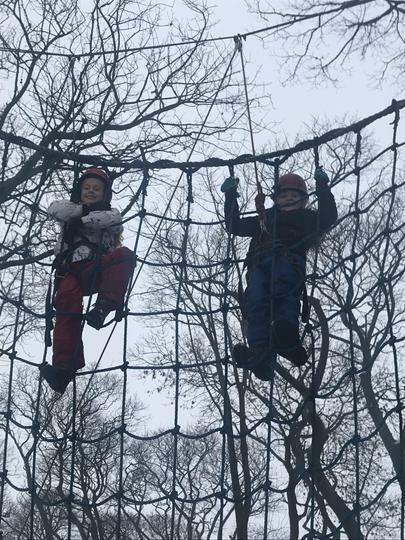 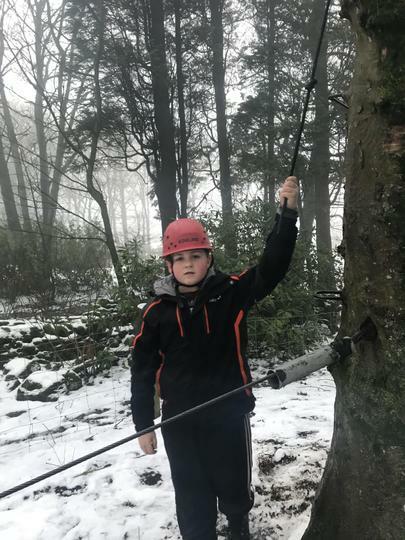 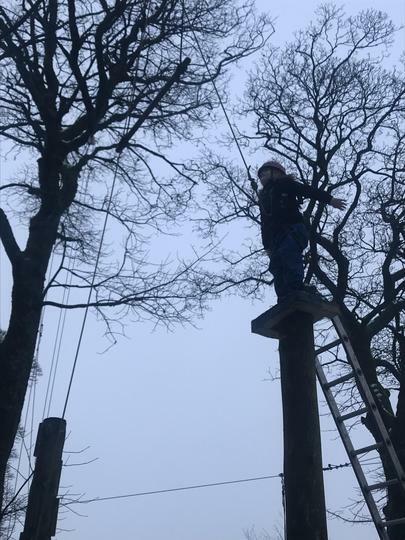 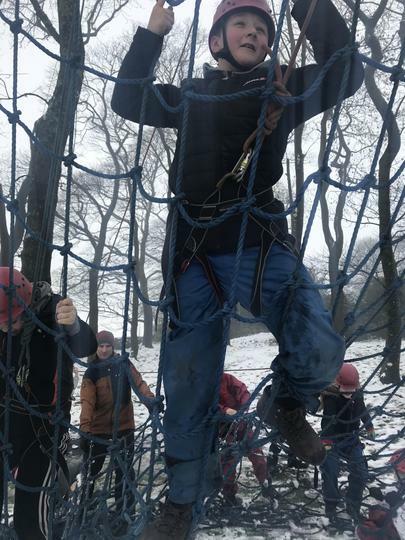 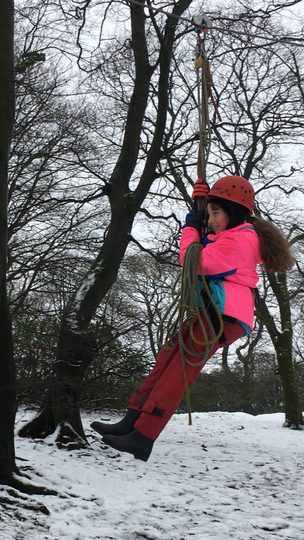 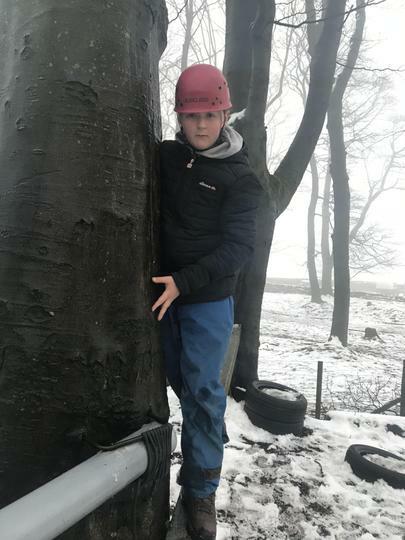 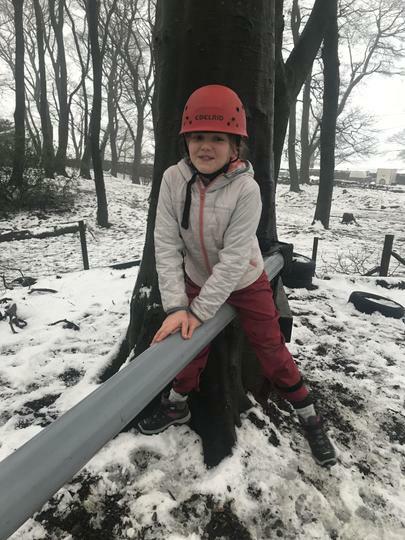 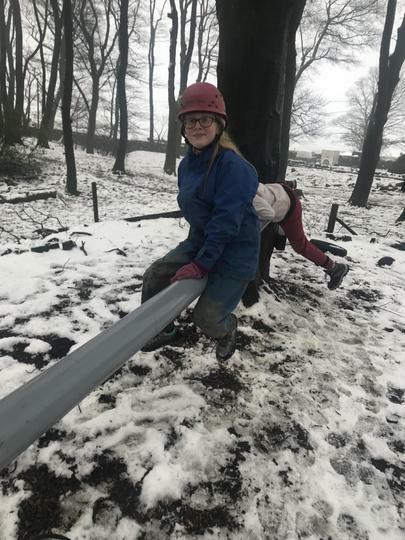 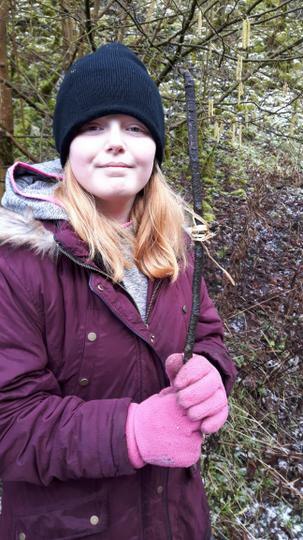 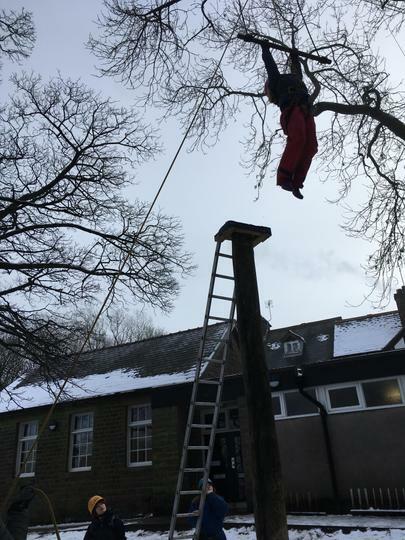 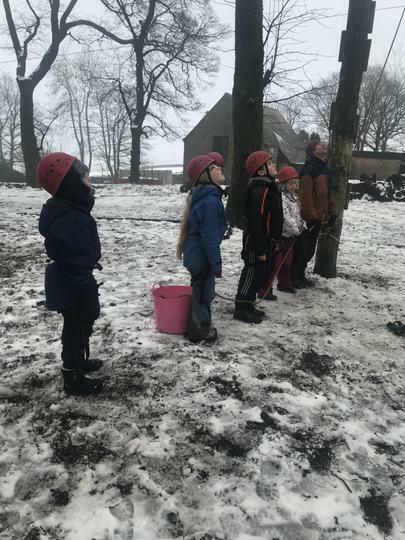 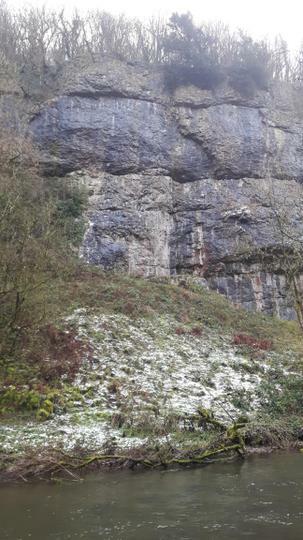 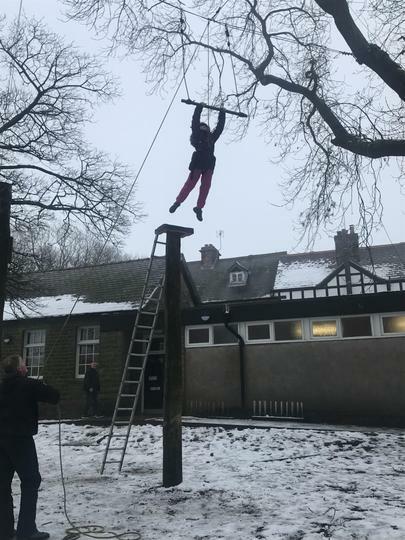 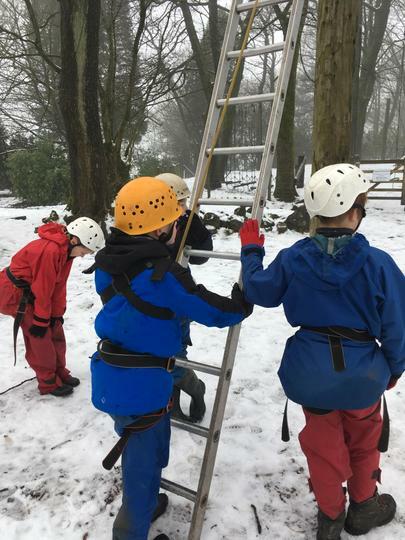 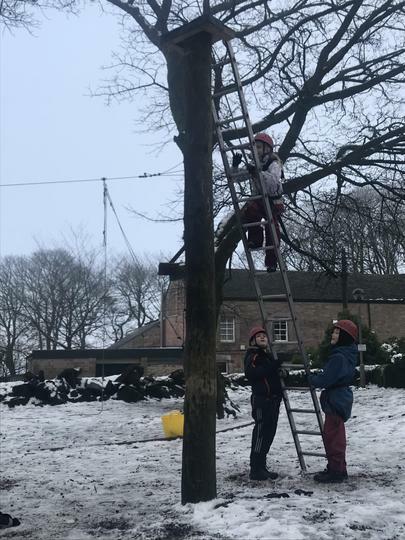 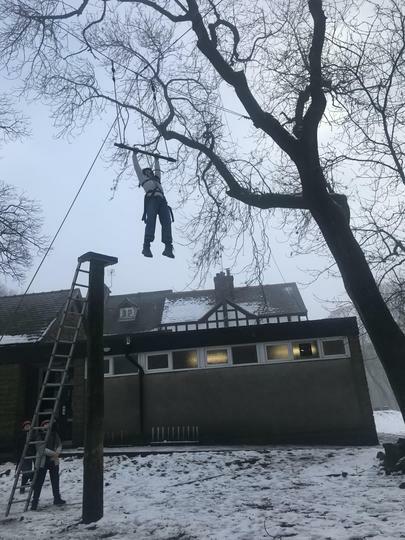 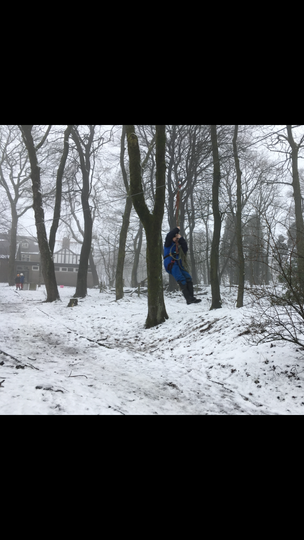 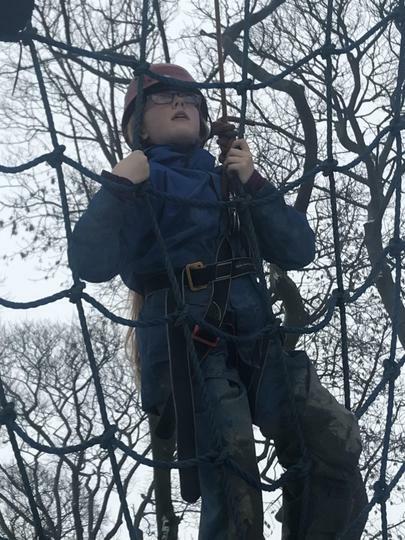 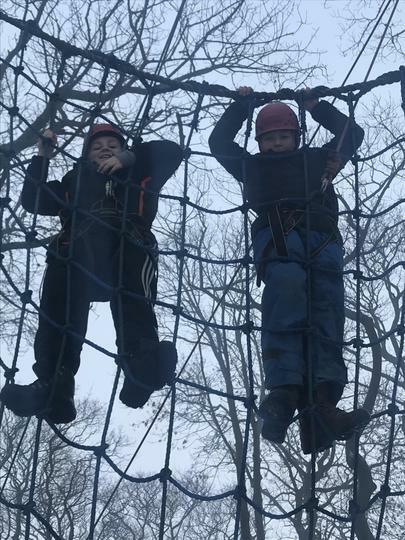 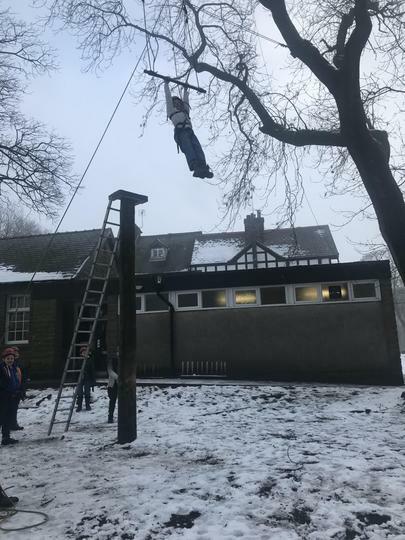 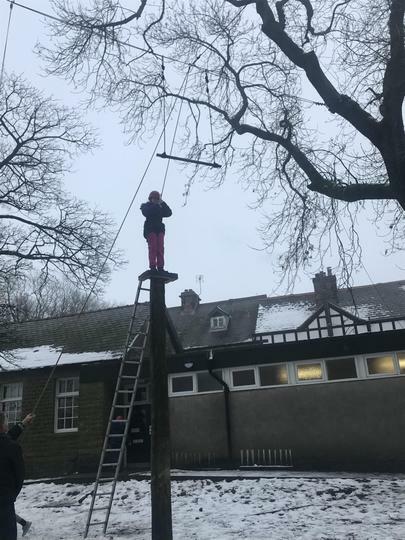 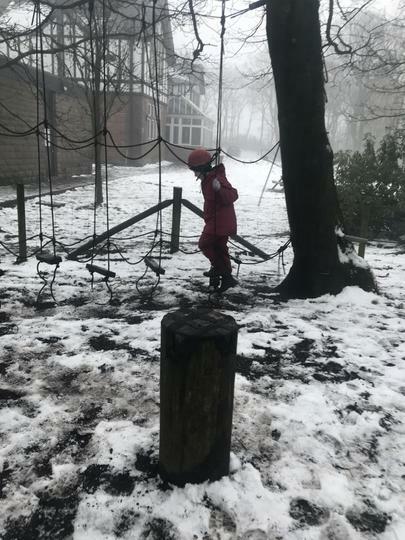 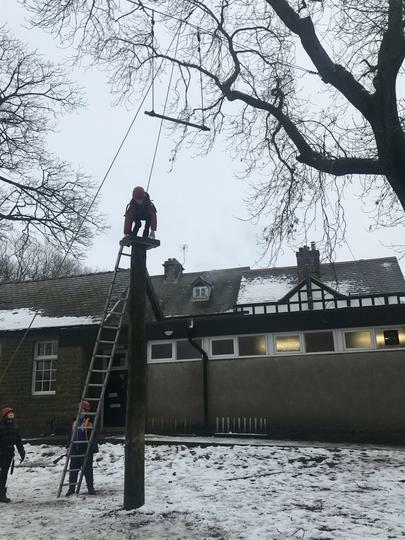 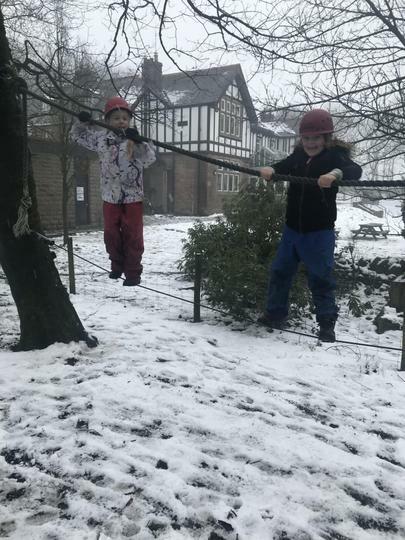 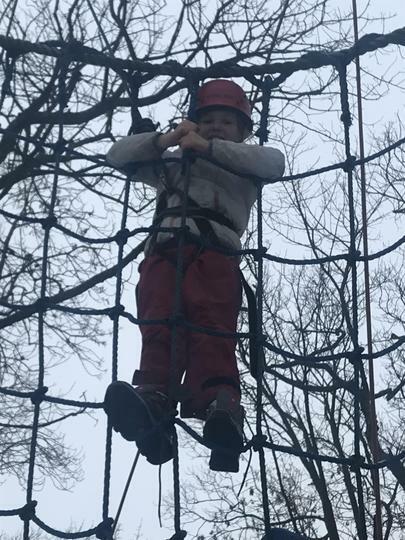 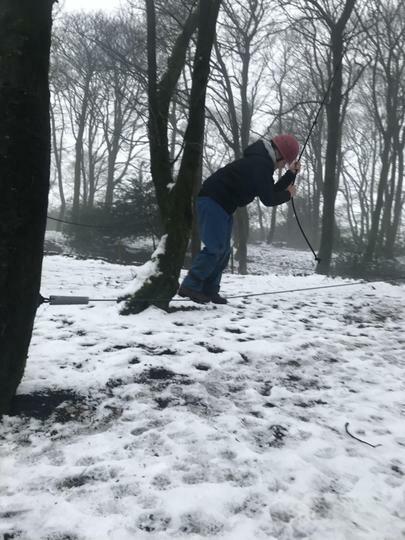 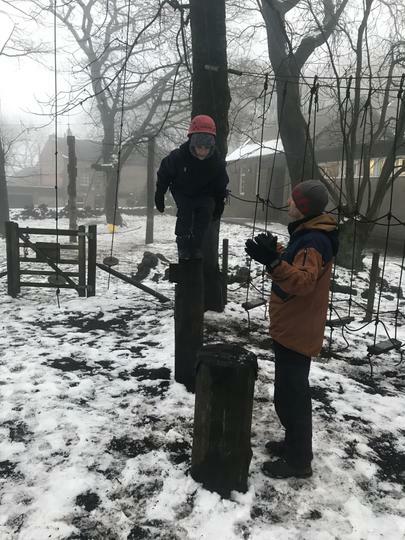 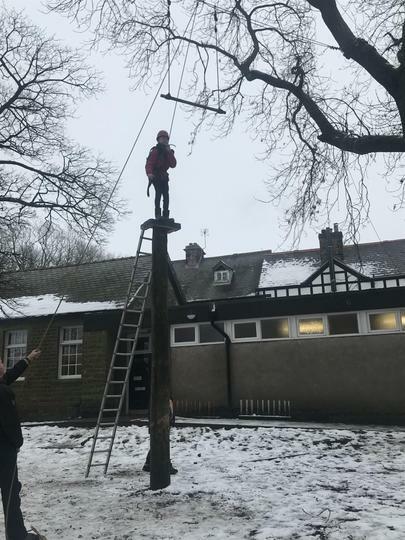 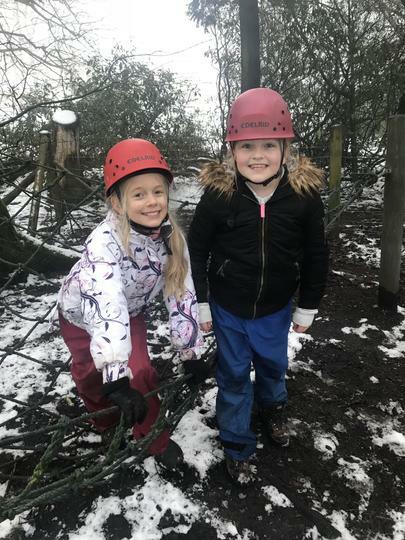 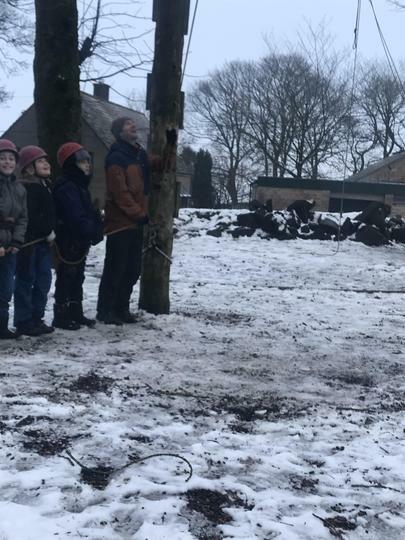 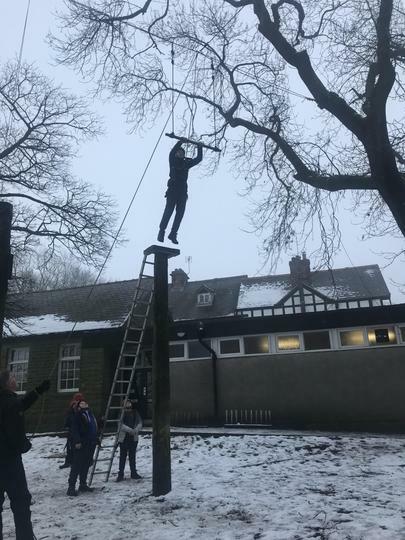 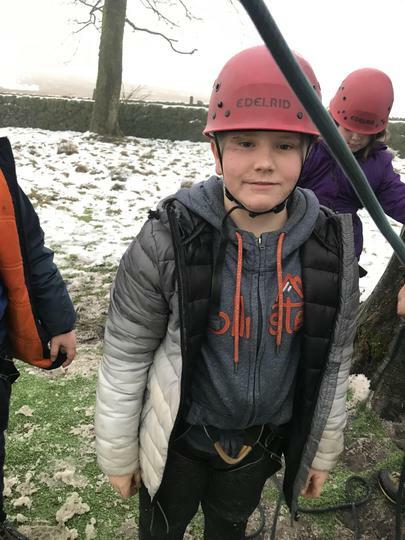 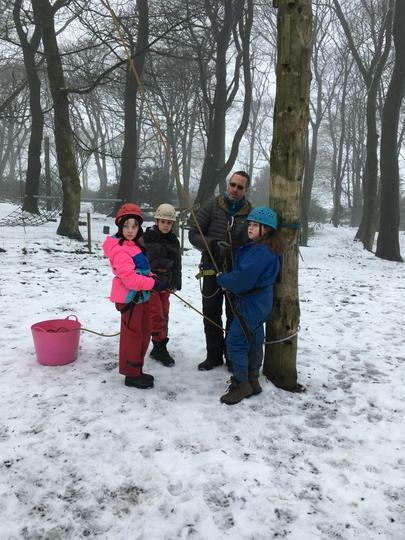 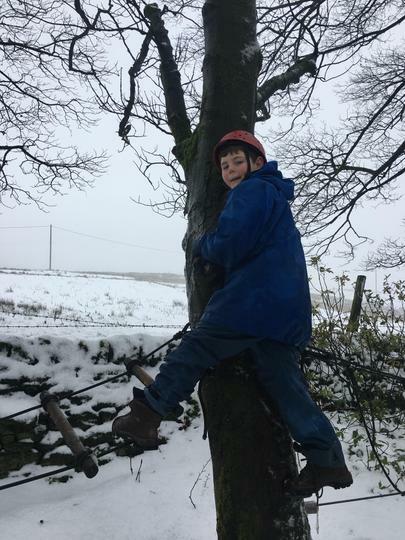 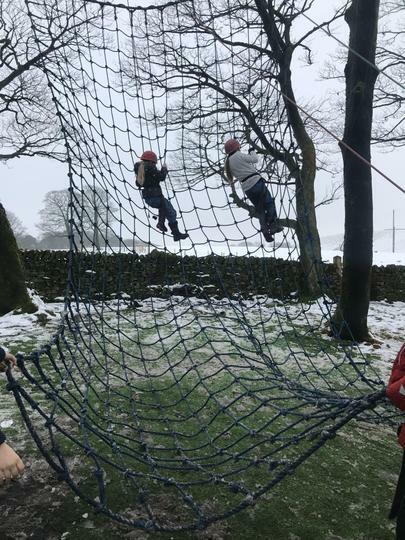 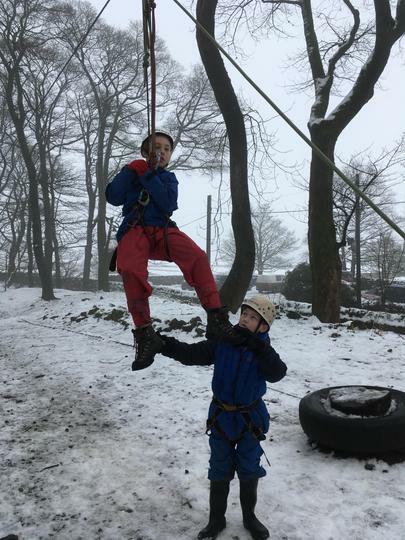 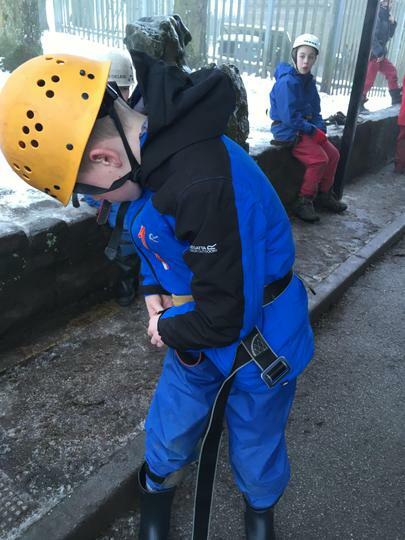 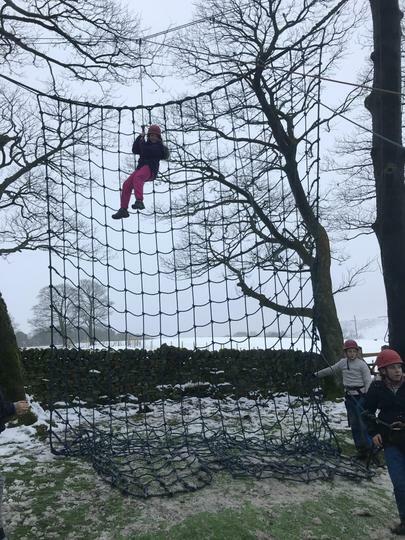 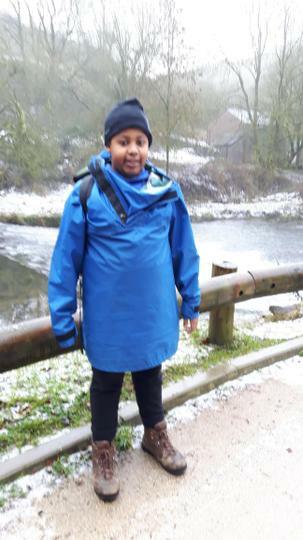 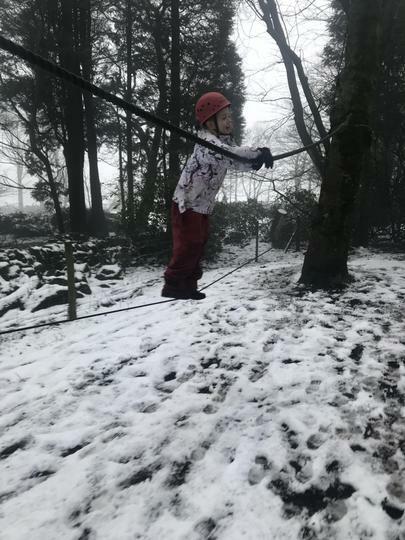 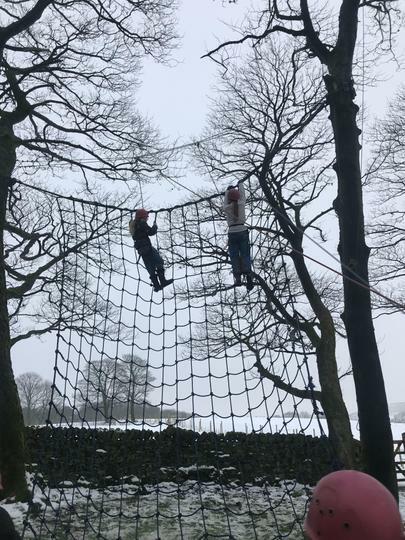 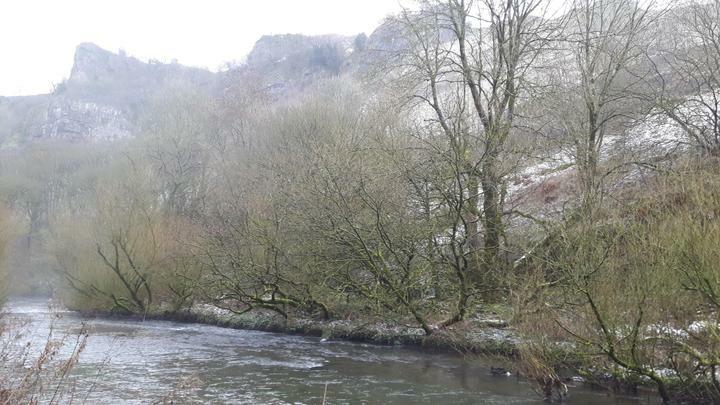 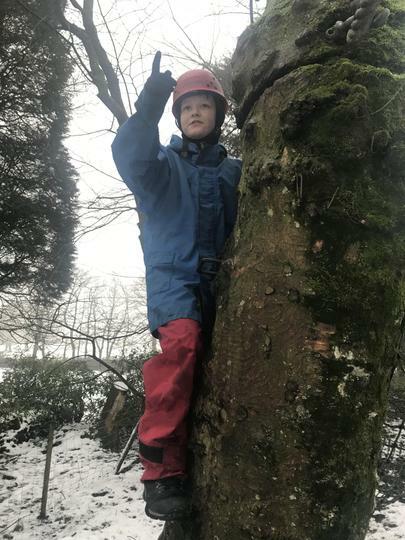 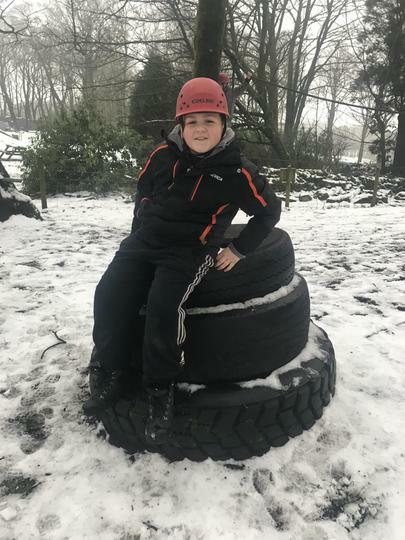 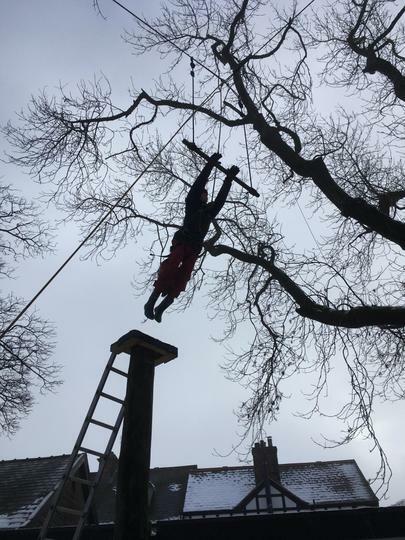 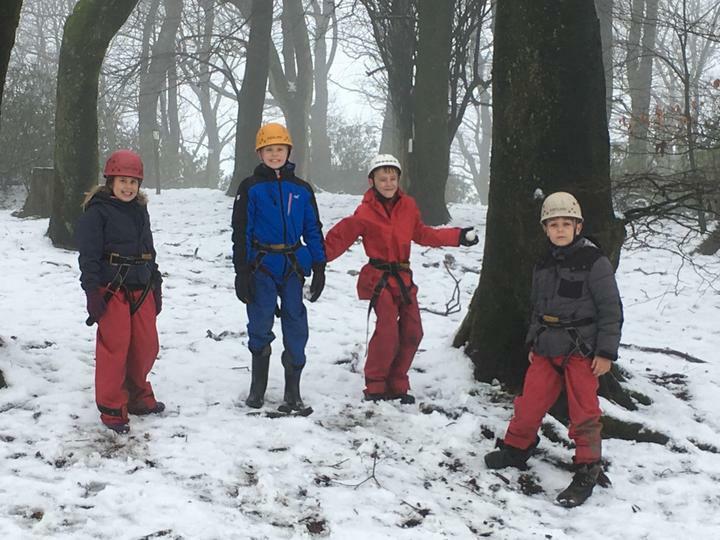 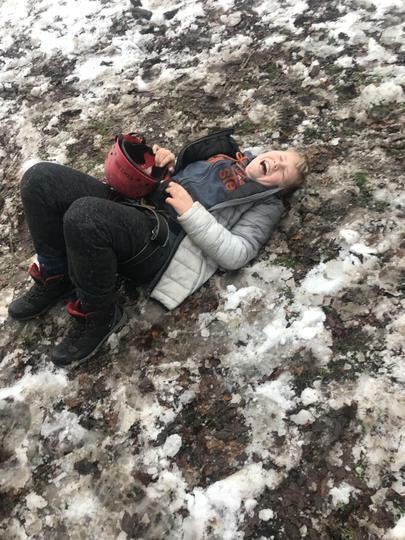 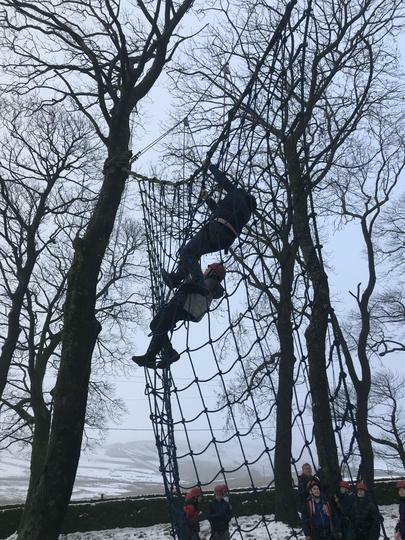 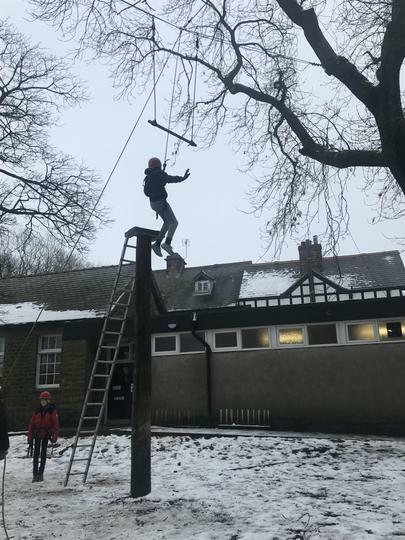 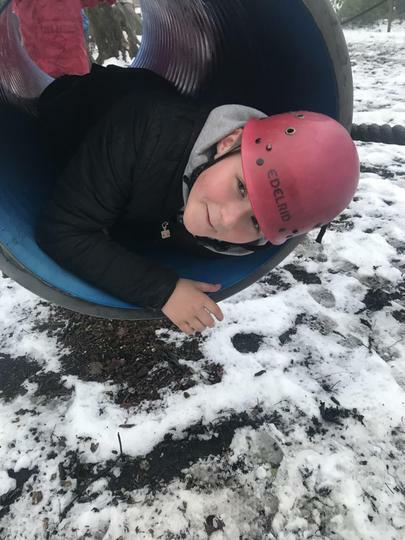 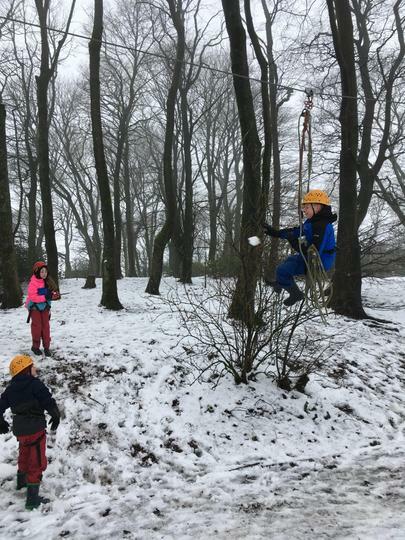 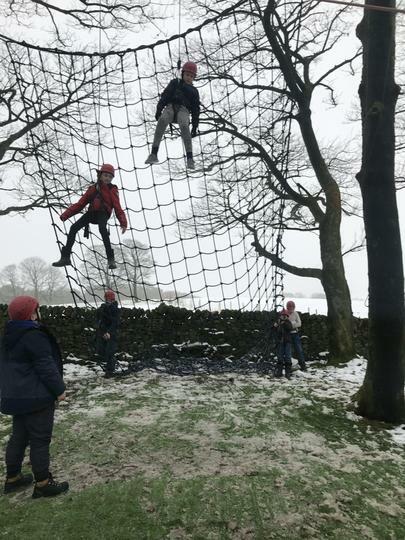 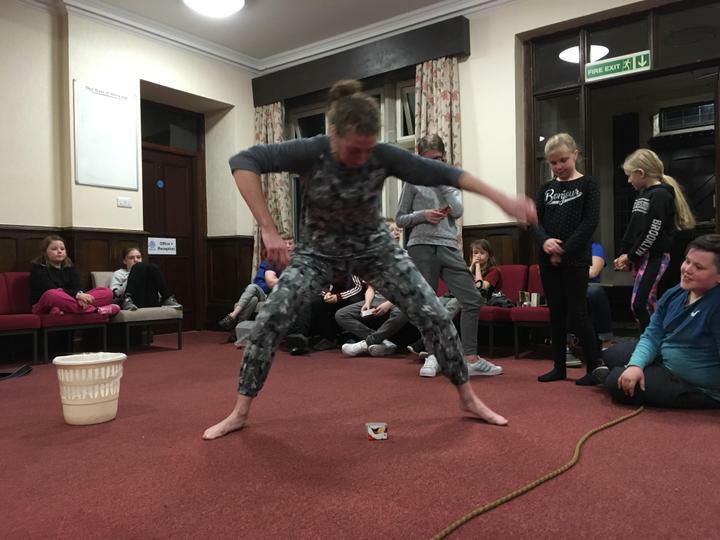 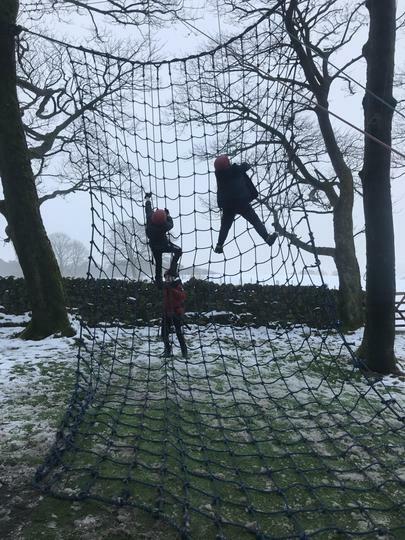 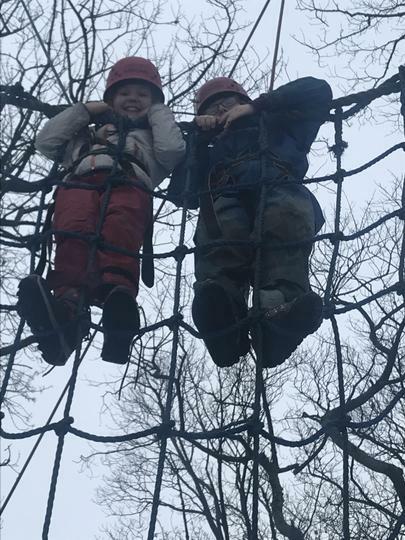 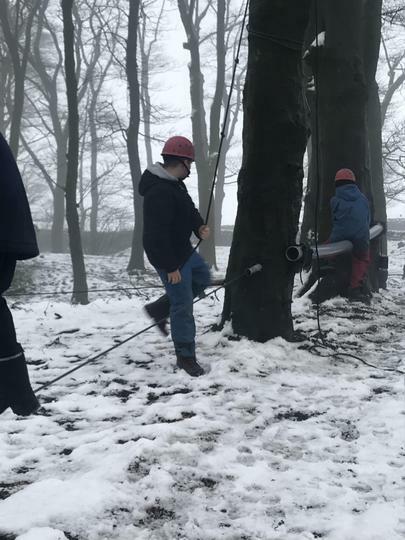 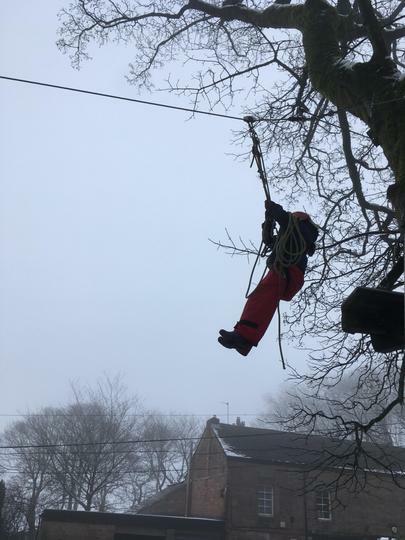 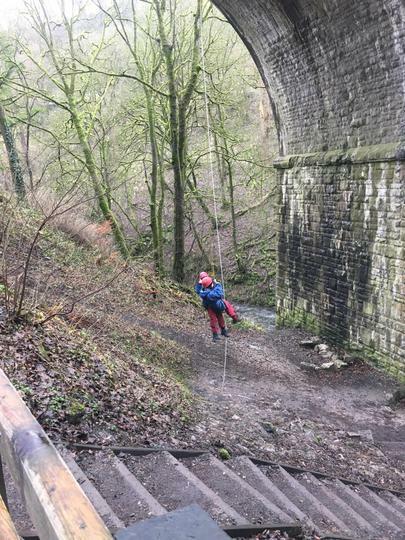 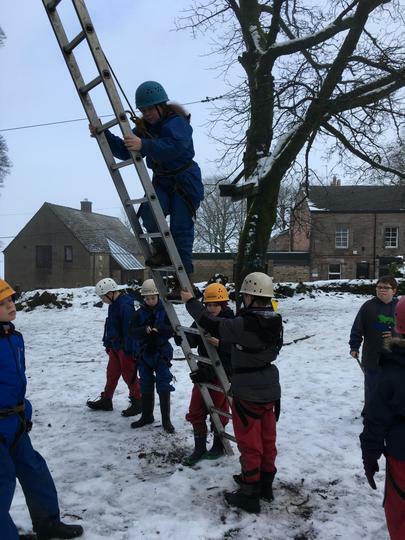 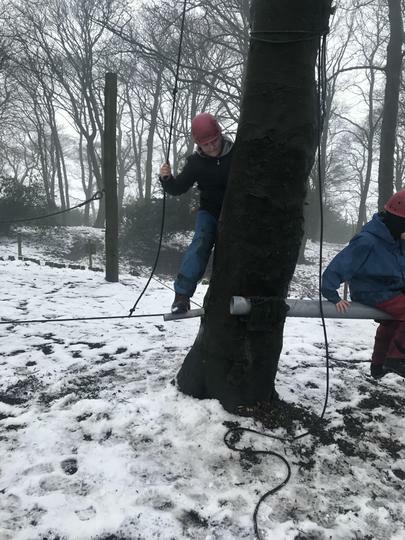 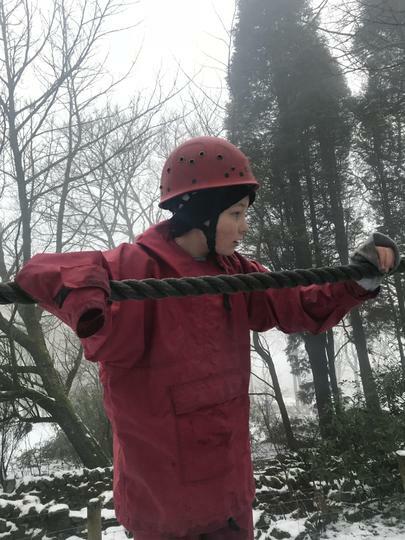 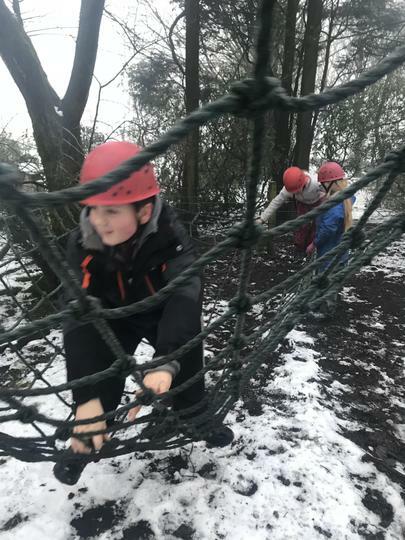 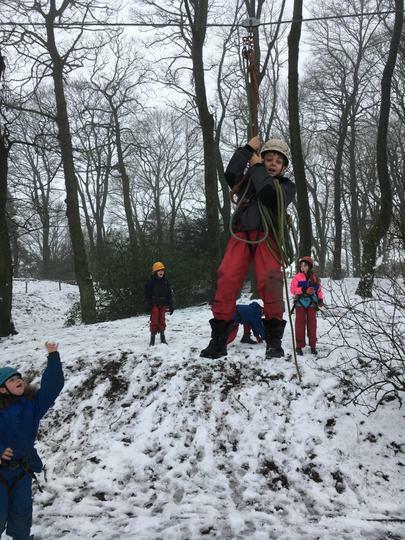 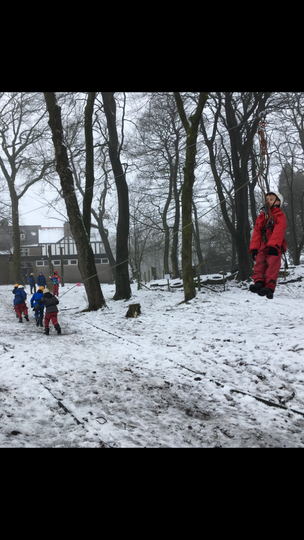 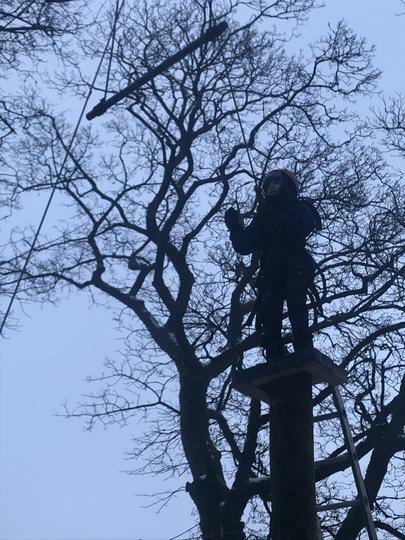 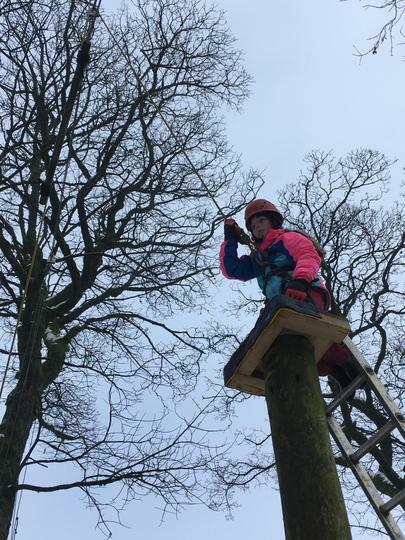 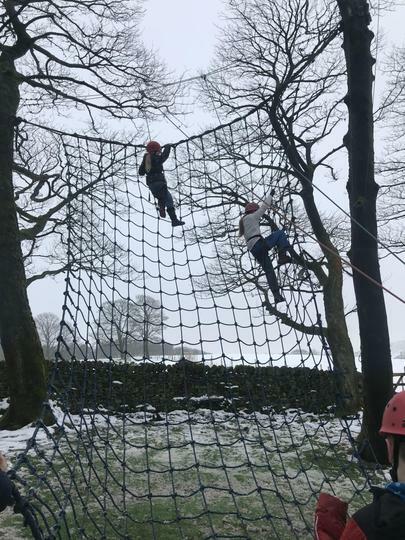 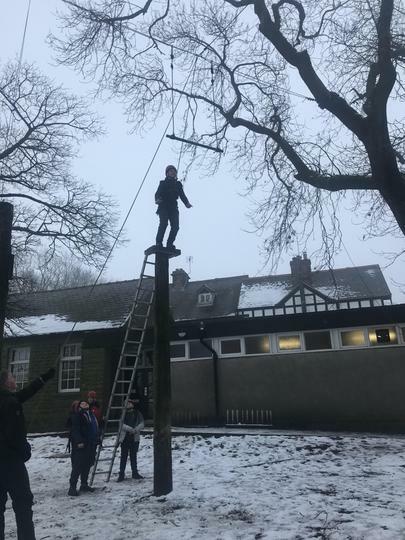 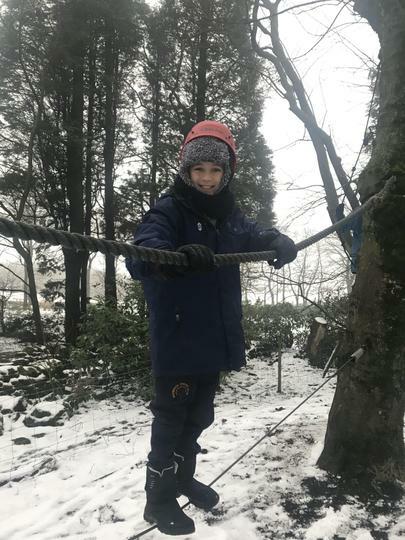 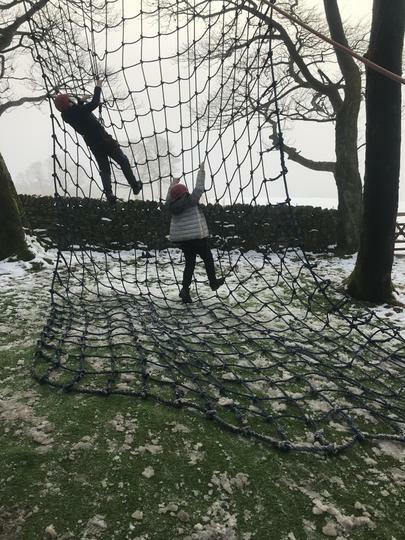 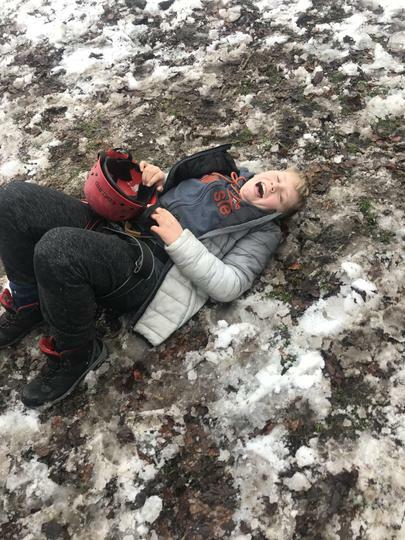 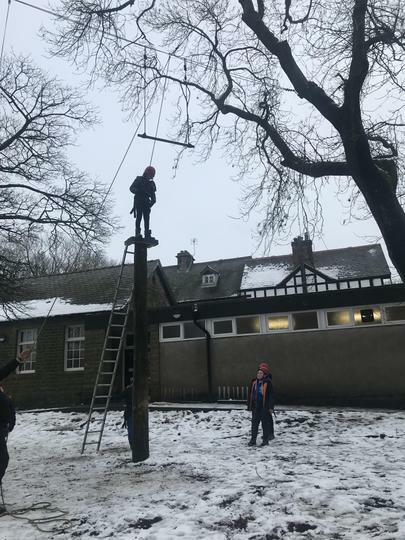 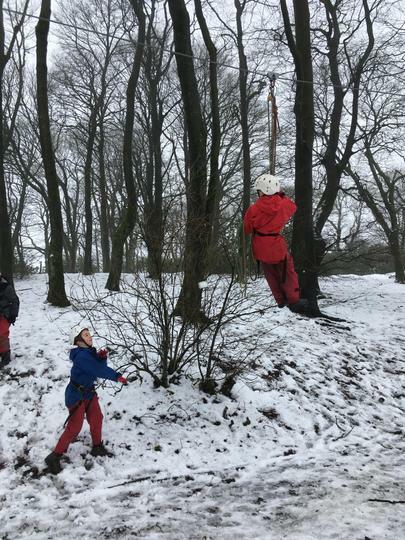 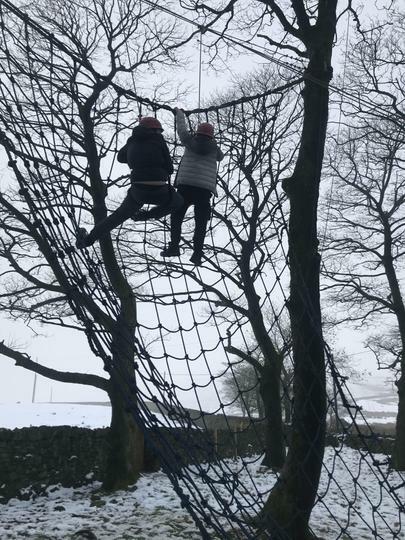 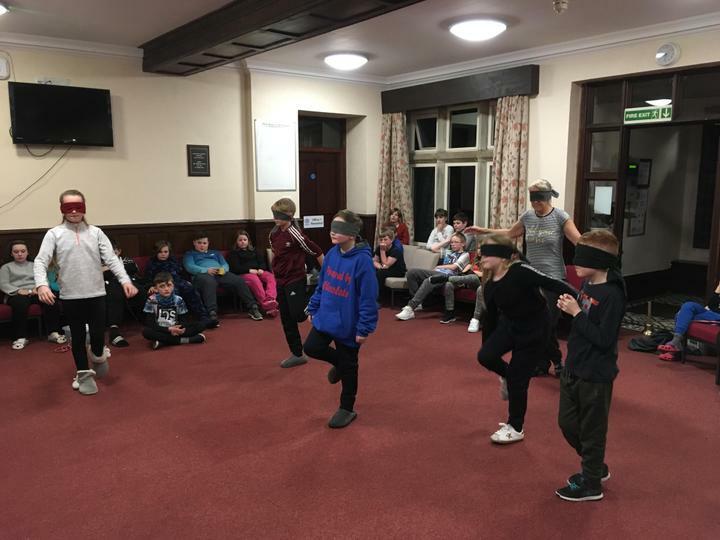 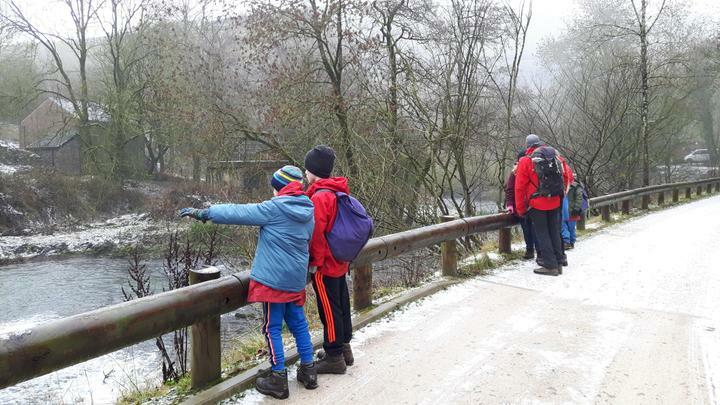 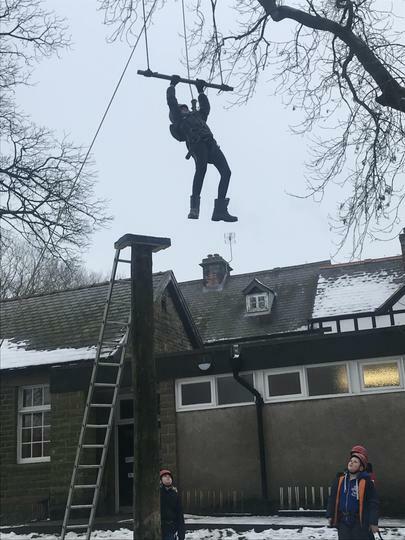 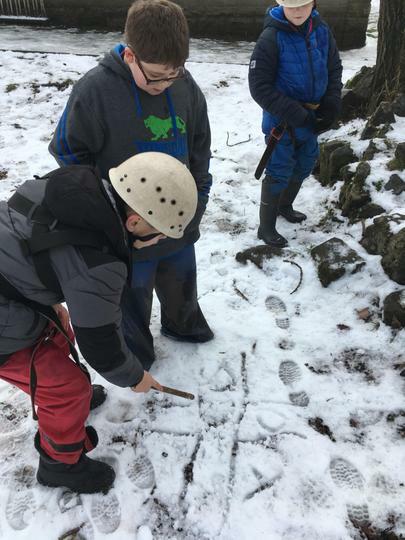 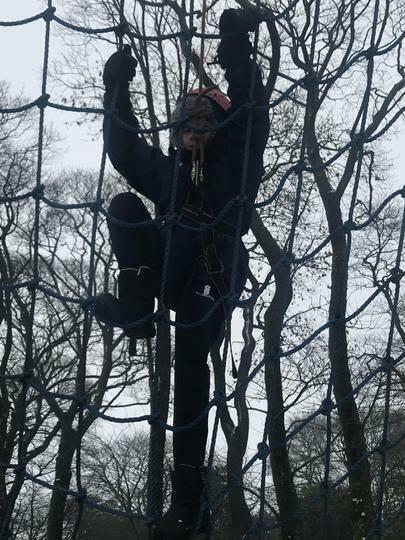 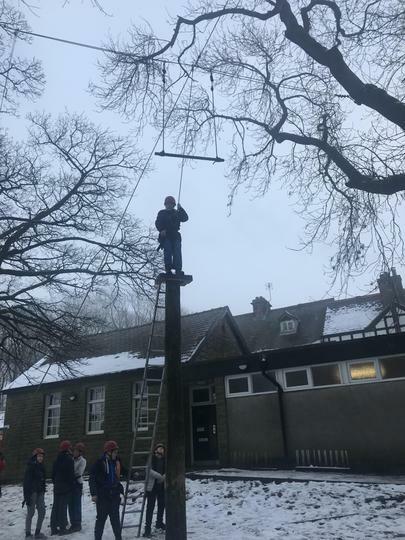 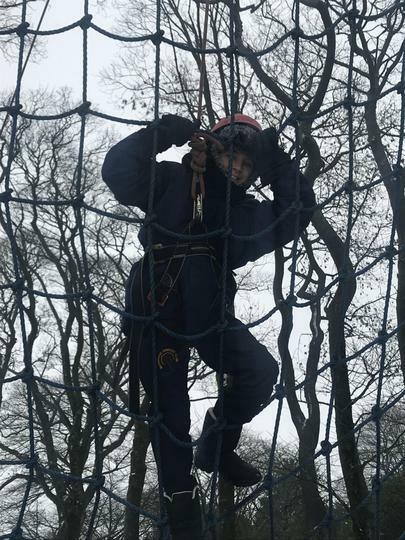 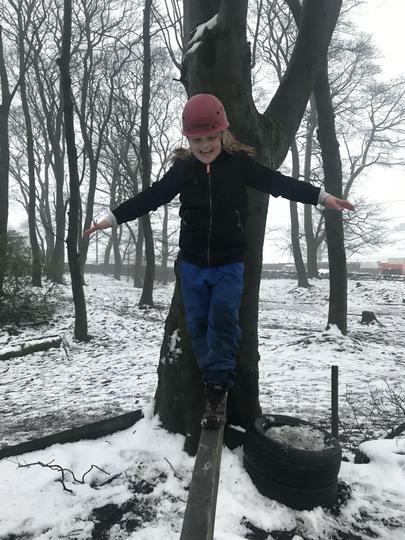 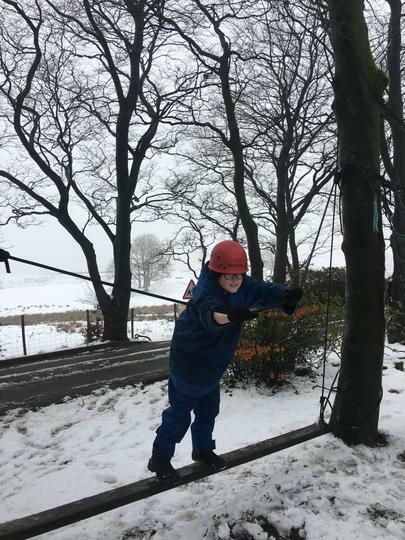 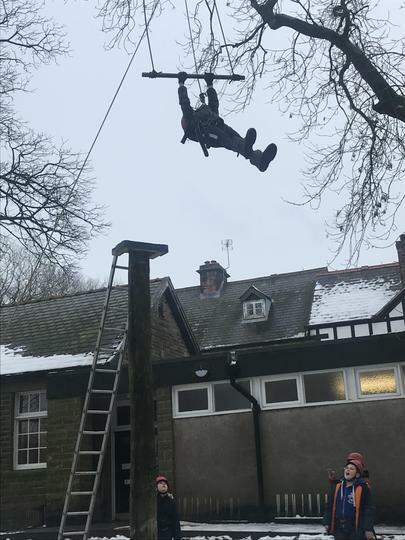 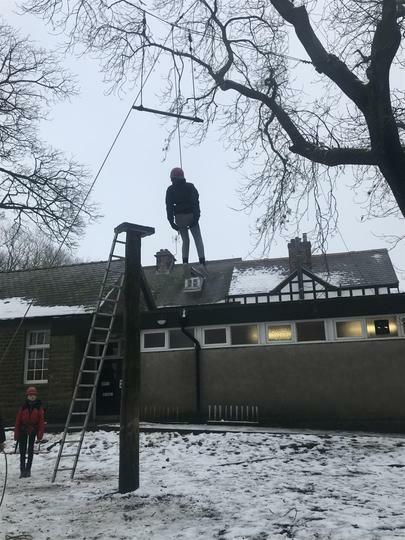 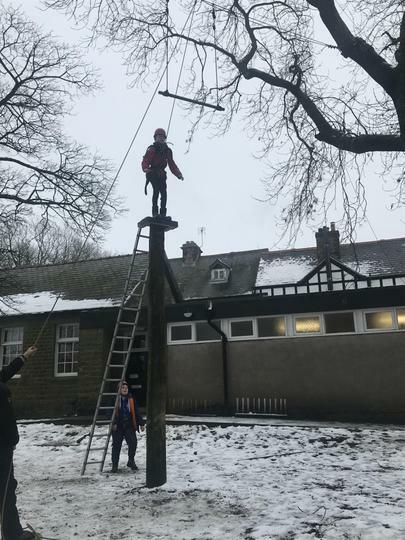 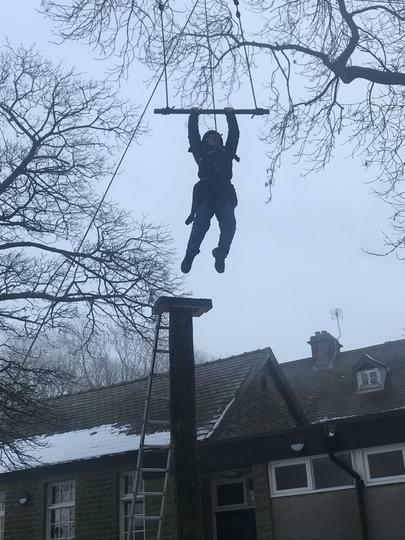 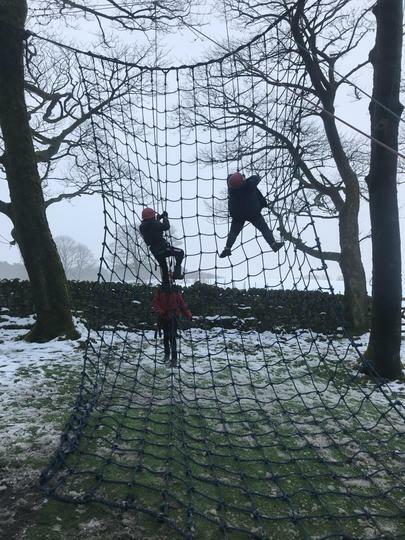 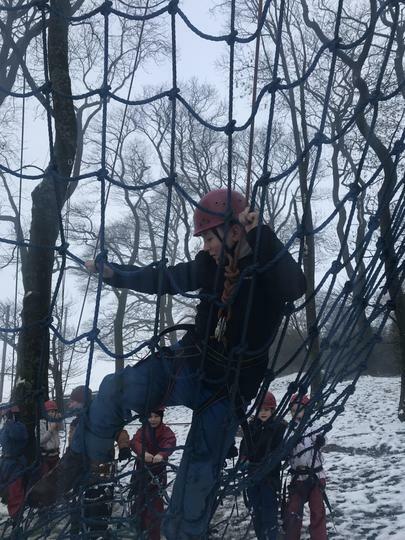 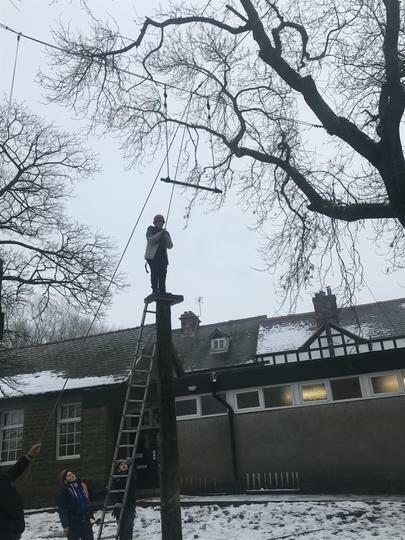 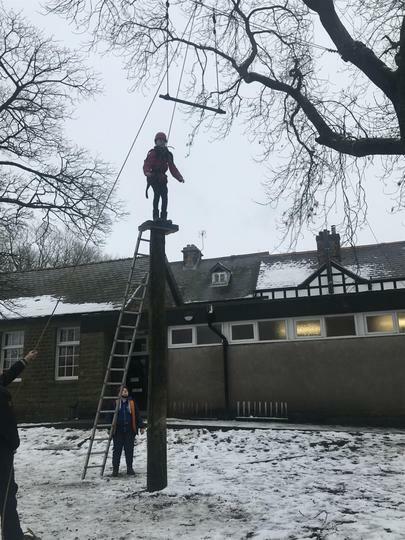 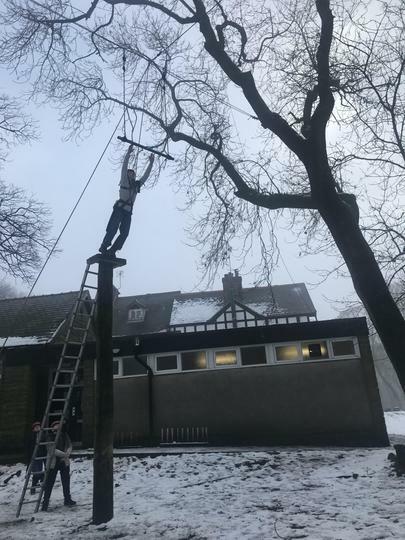 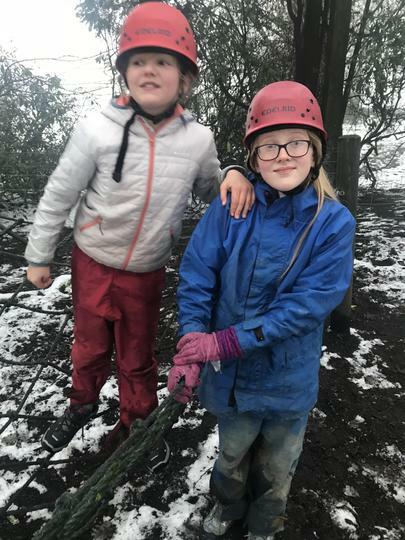 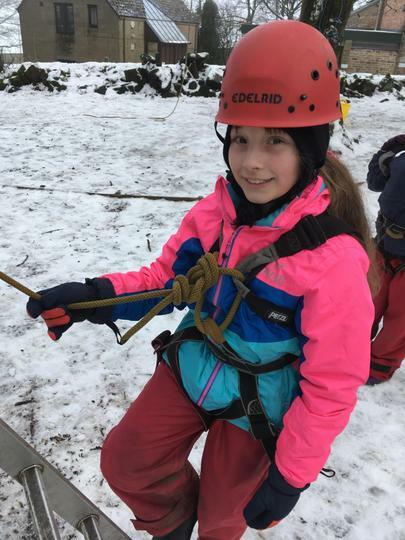 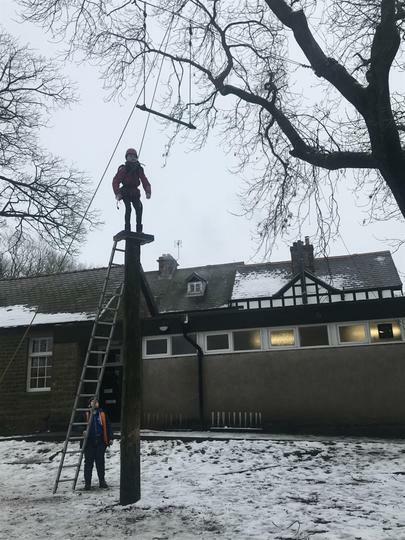 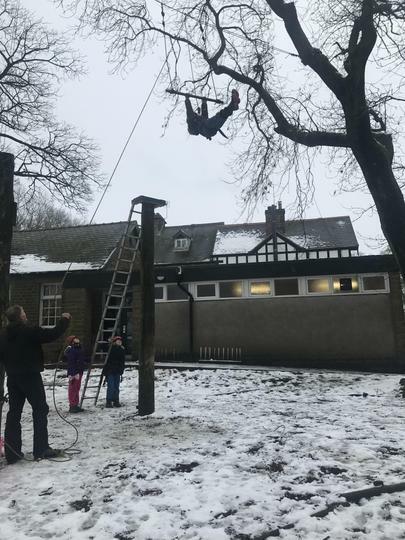 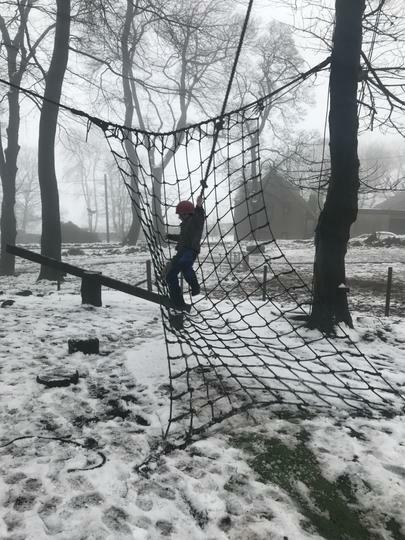 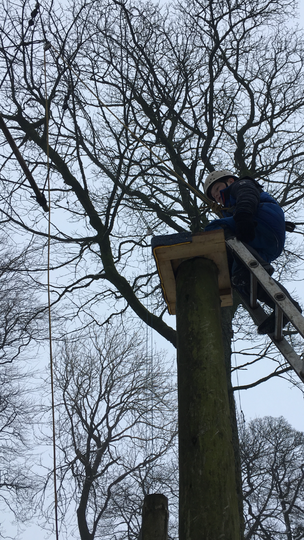 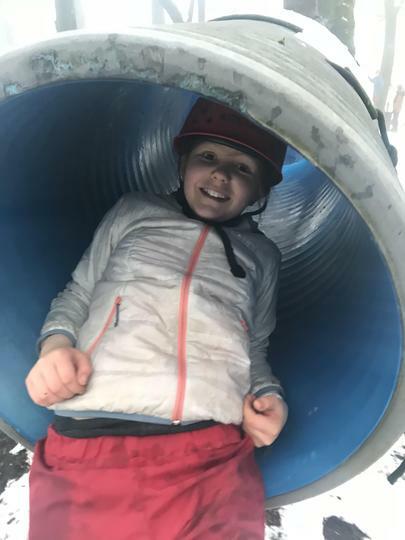 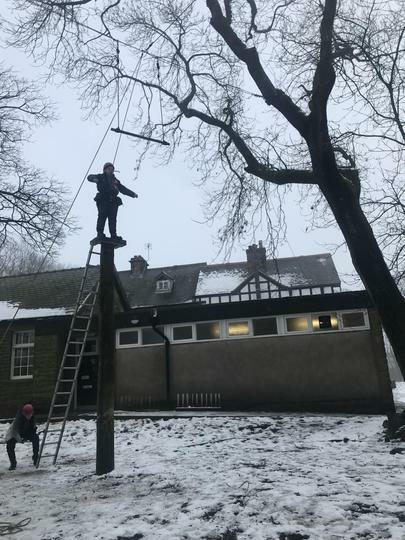 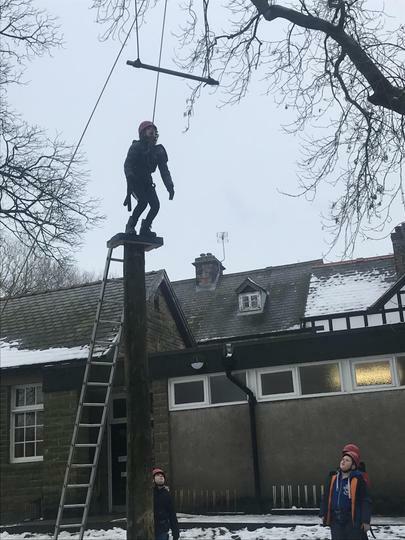 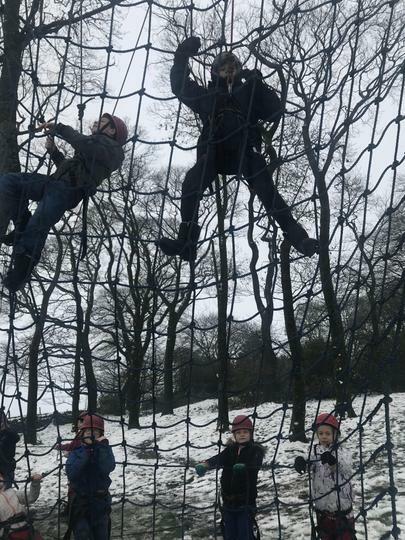 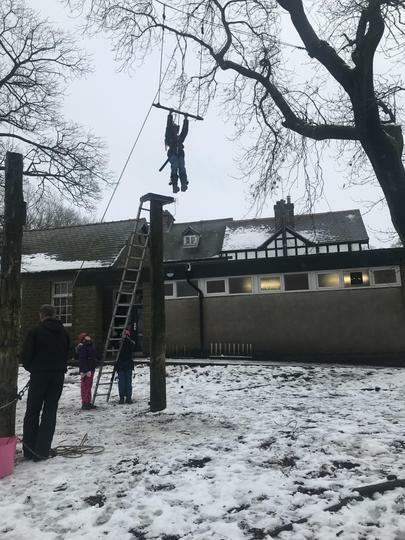 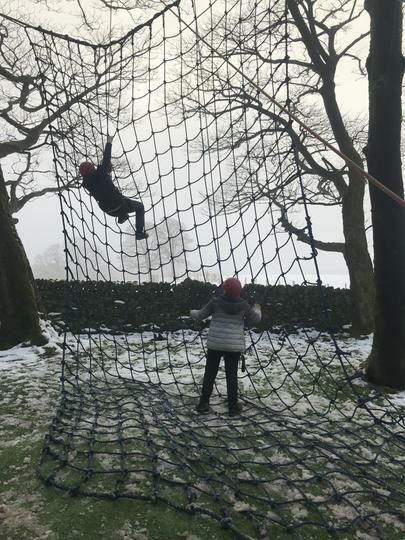 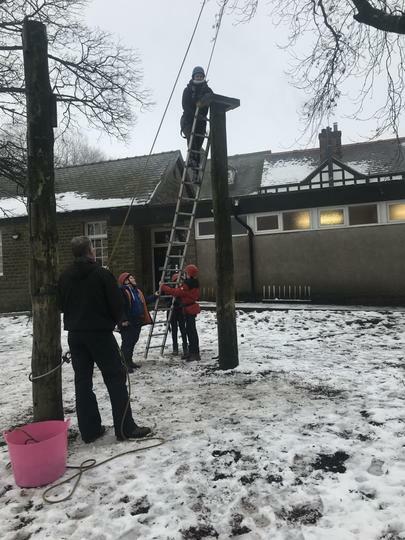 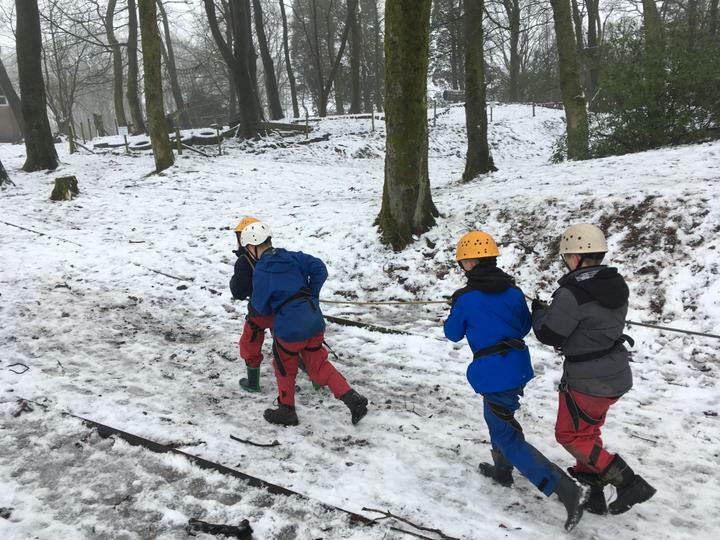 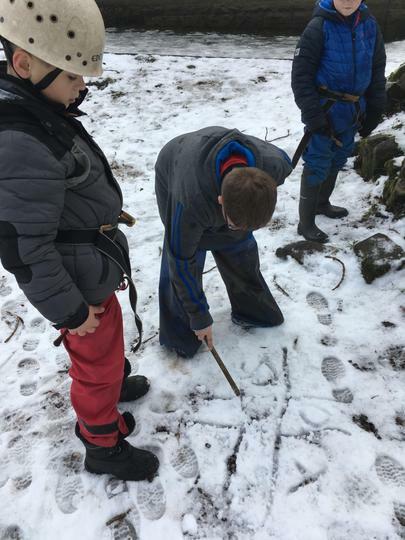 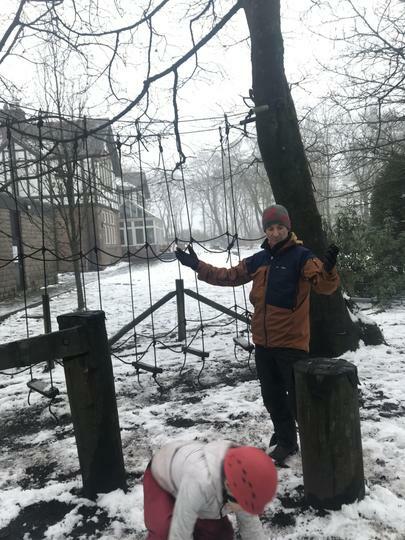 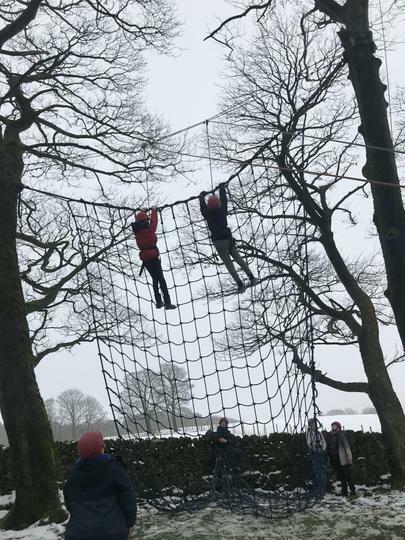 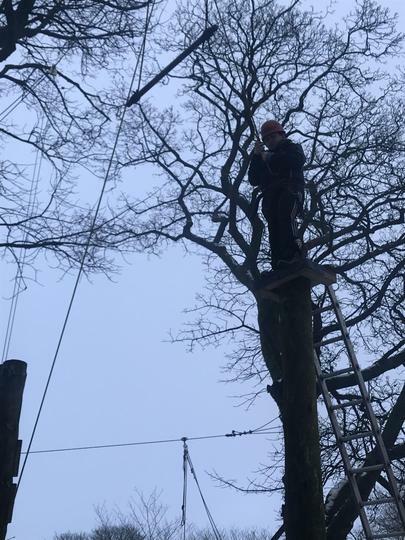 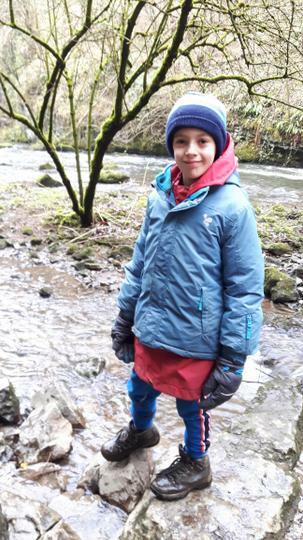 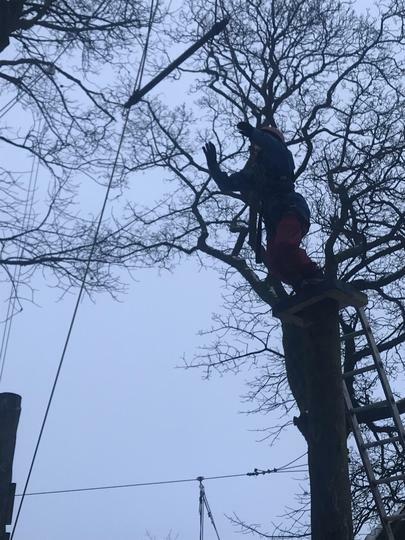 This afternoon we did the outdoor climbing net, the leap of faith (which 100% of the children did) and the ropes course, followed by a snowball fight! 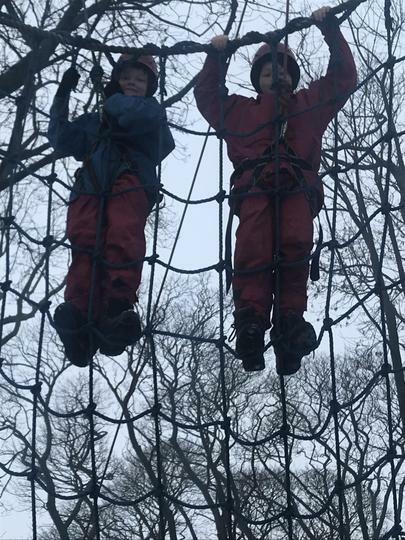 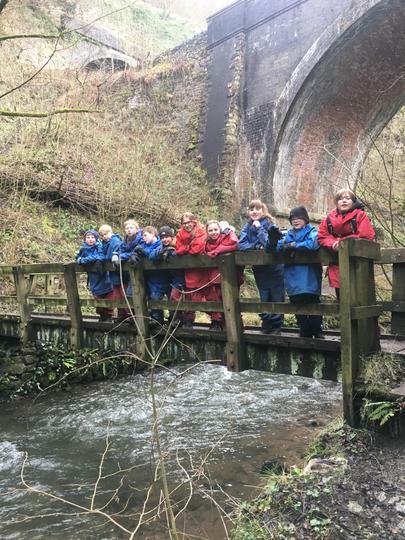 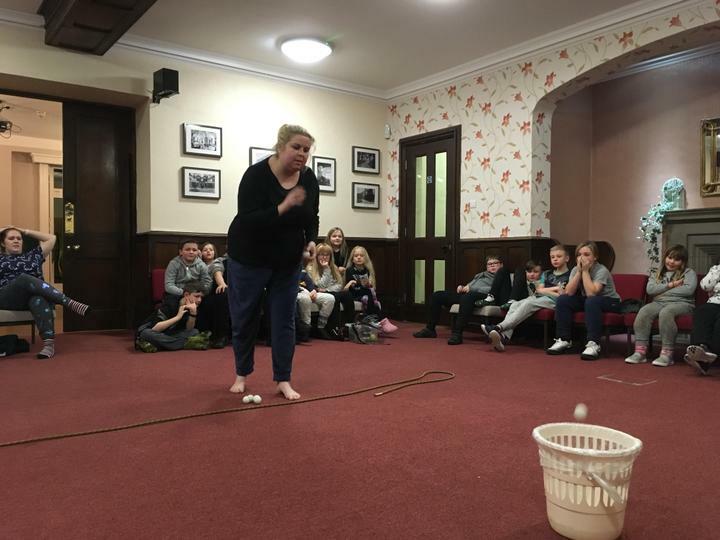 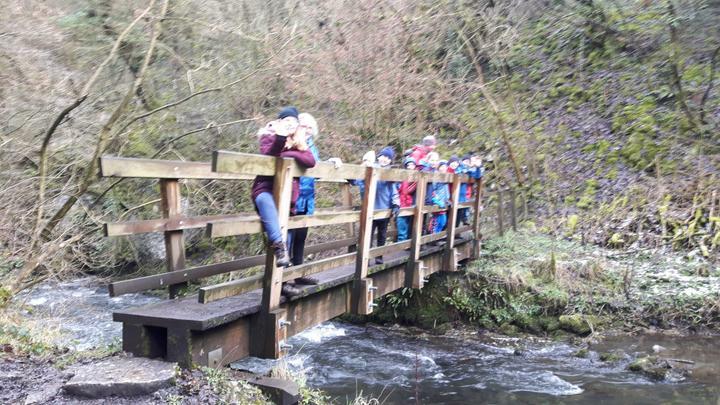 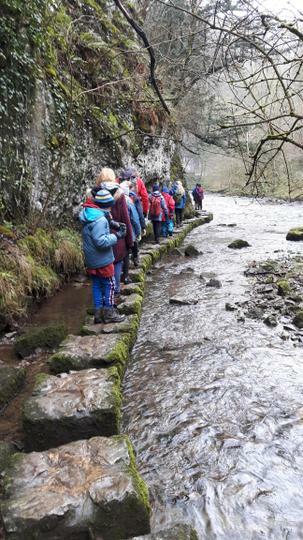 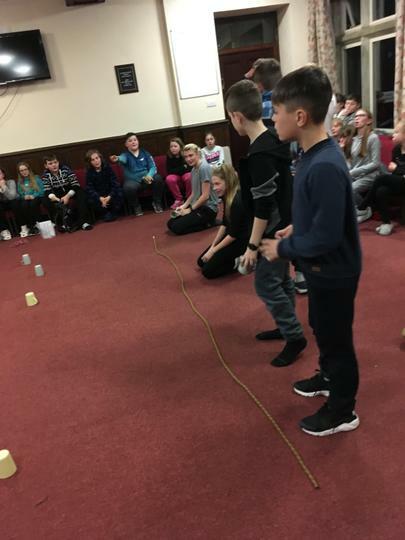 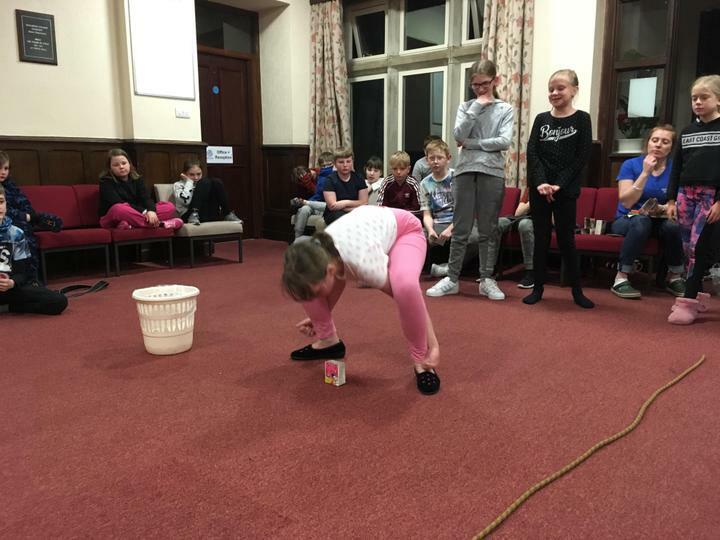 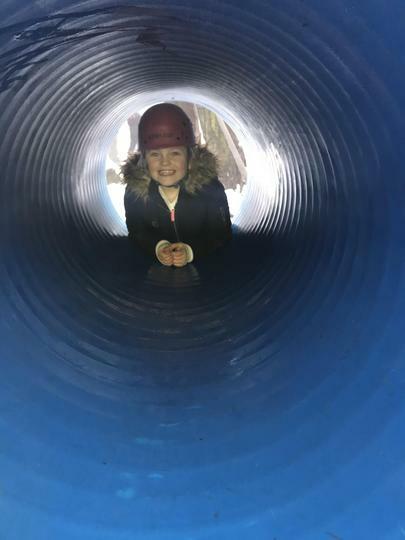 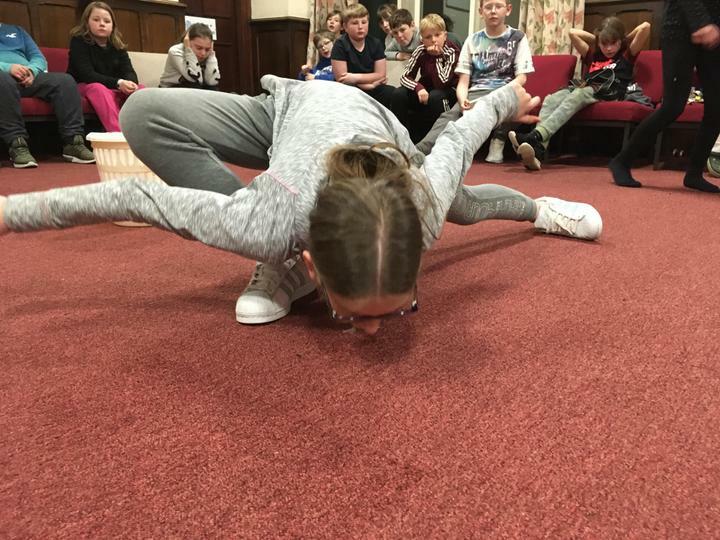 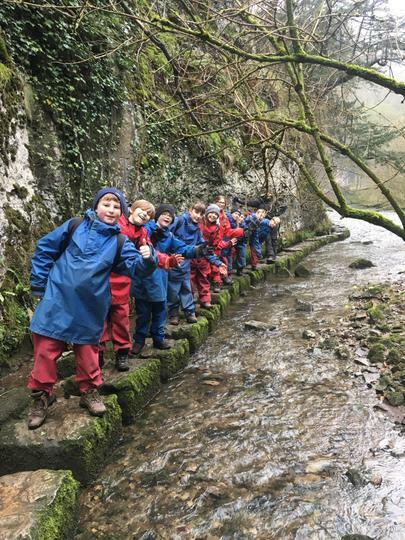 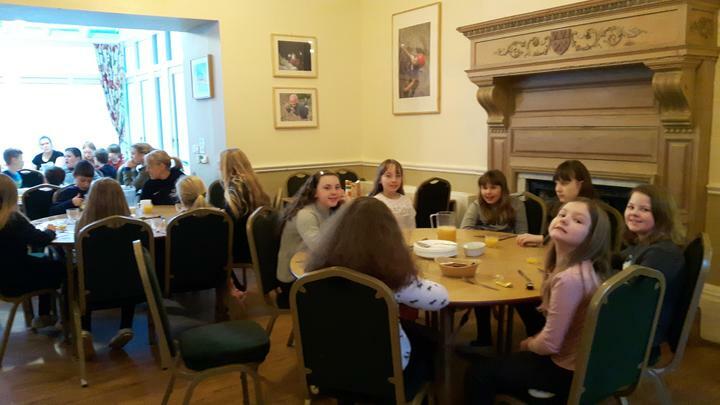 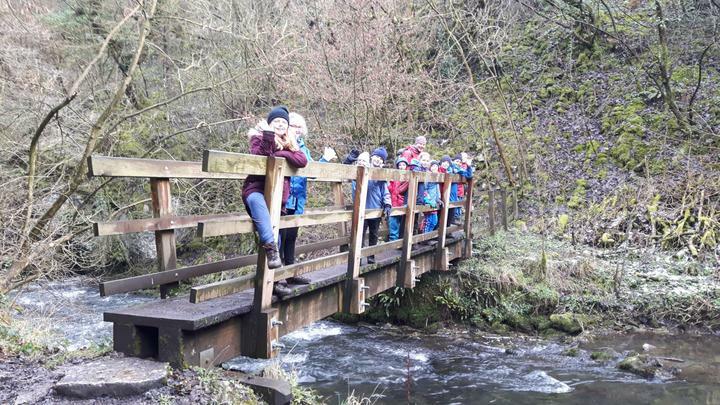 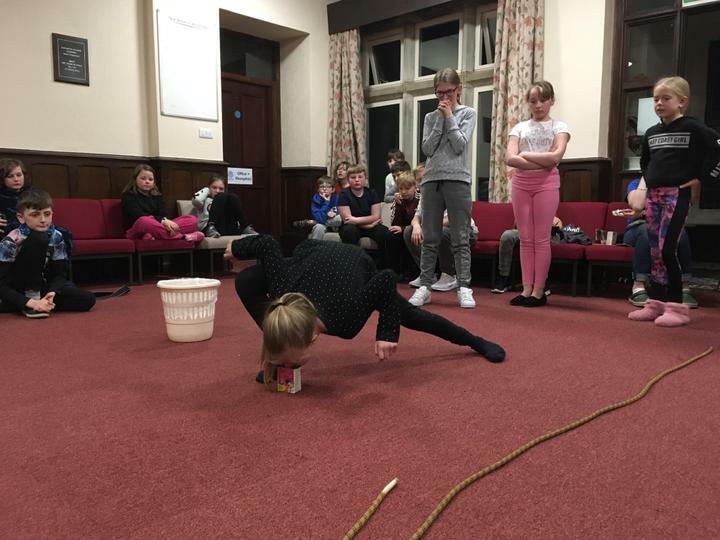 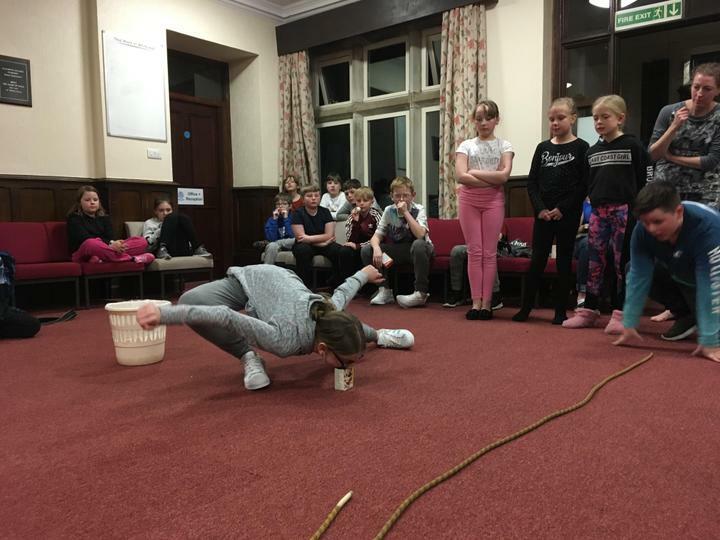 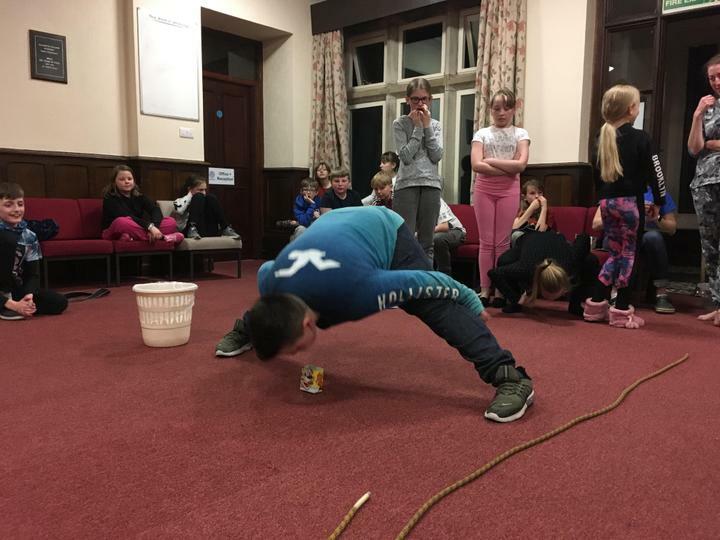 The children have done fantastic and have really impressed me with their excellent team work and the support they have provided one another. 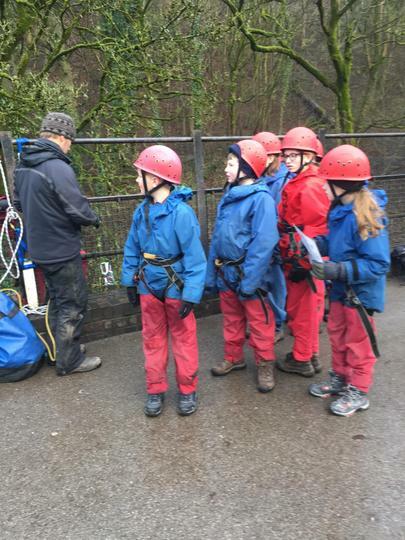 I am exceptionally proud of each and every one of them. 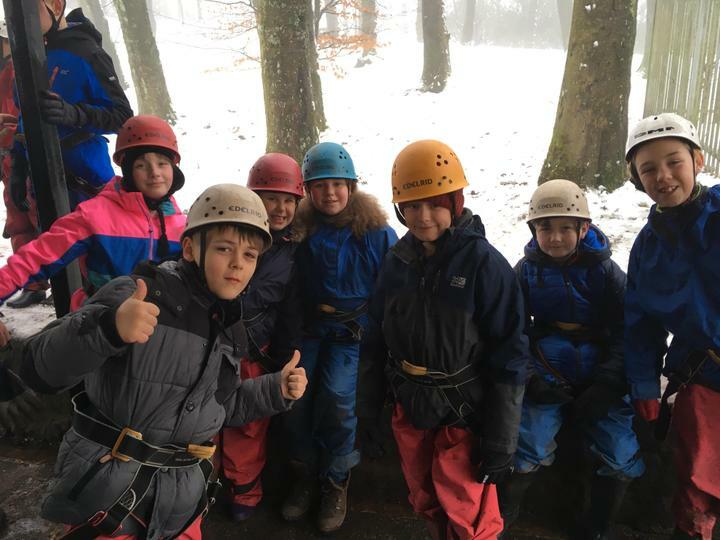 Well done group B! 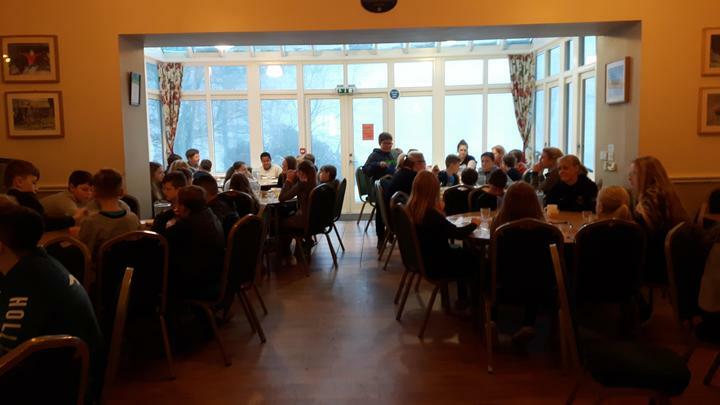 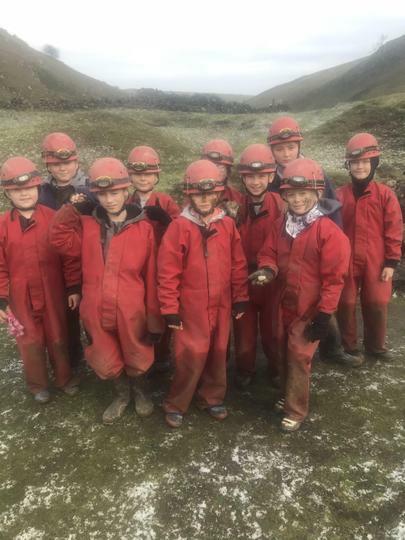 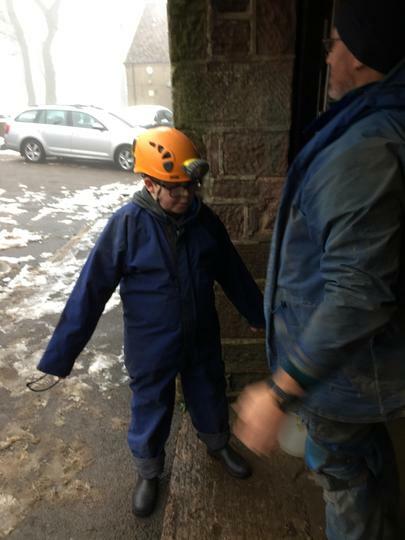 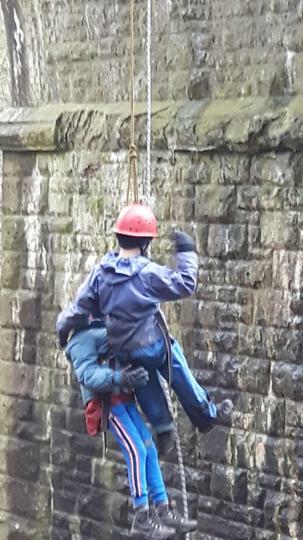 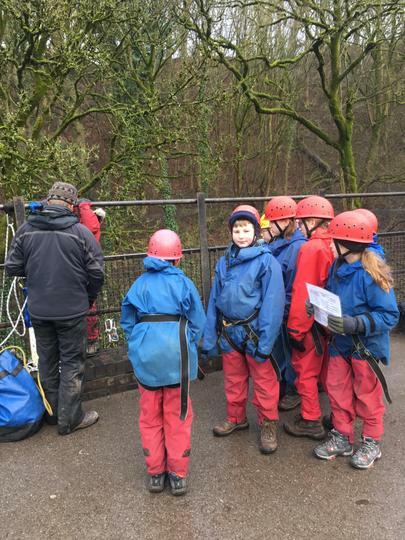 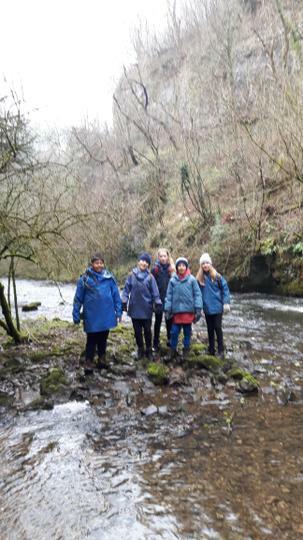 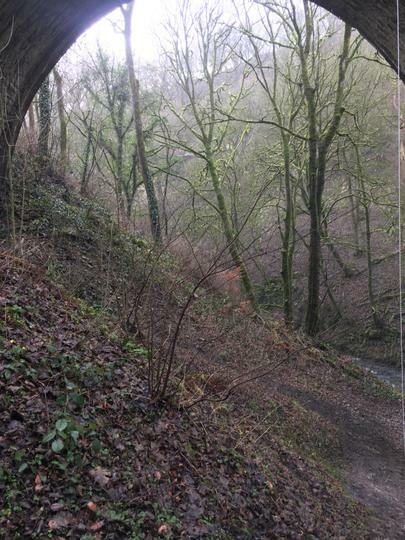 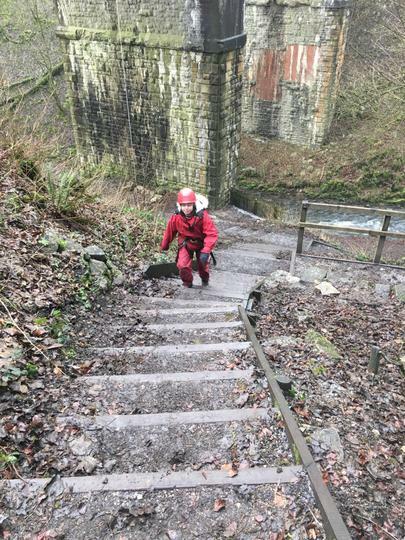 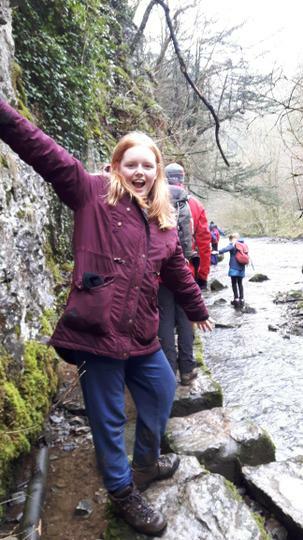 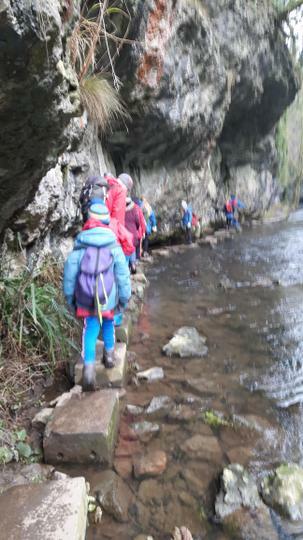 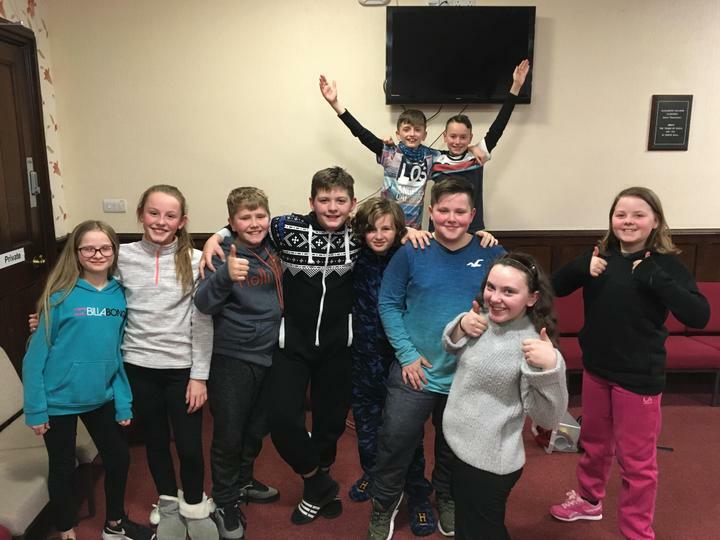 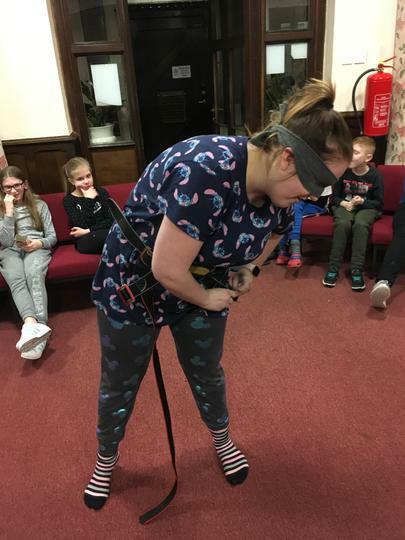 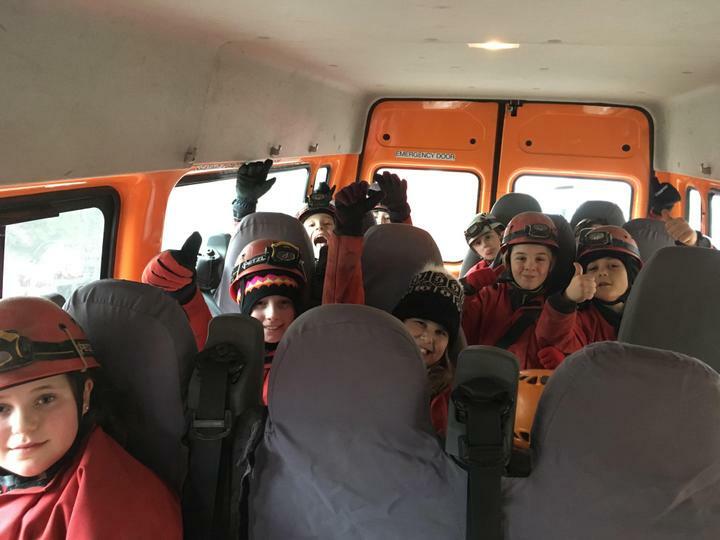 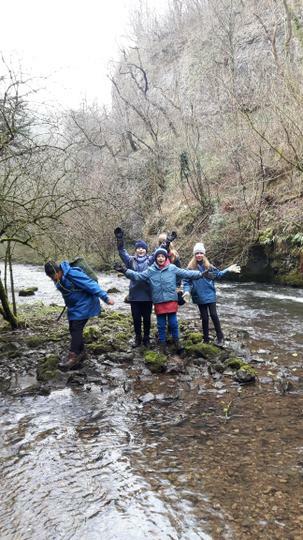 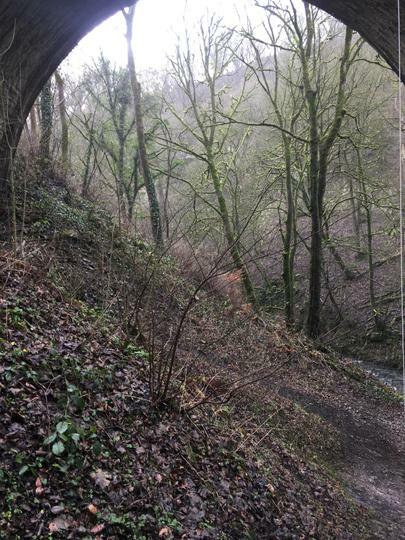 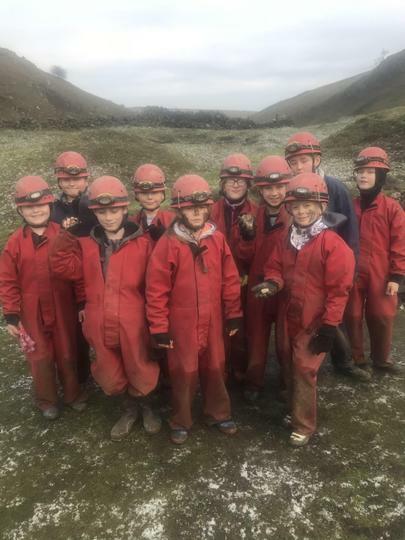 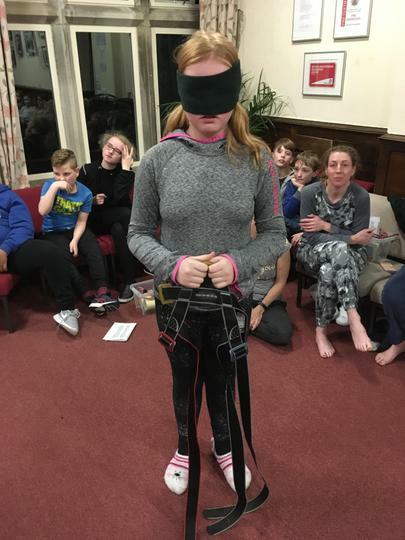 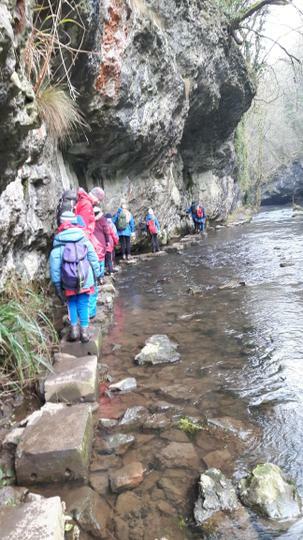 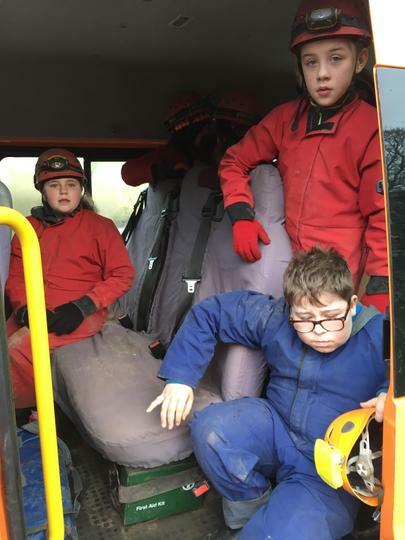 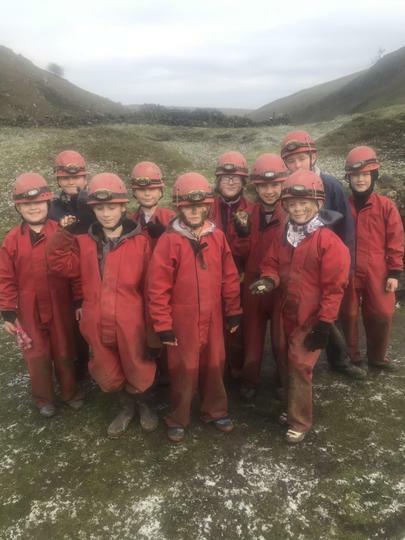 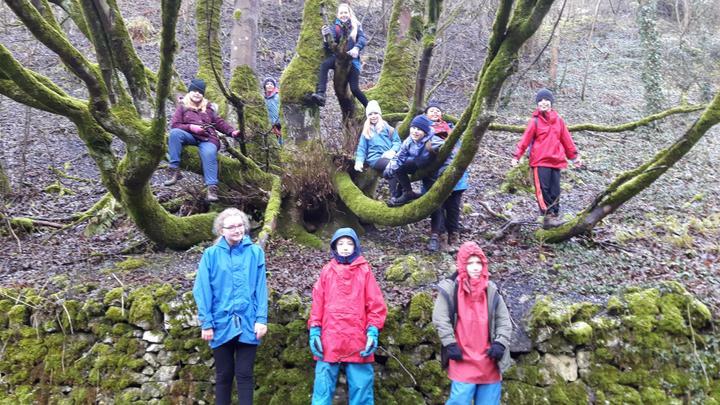 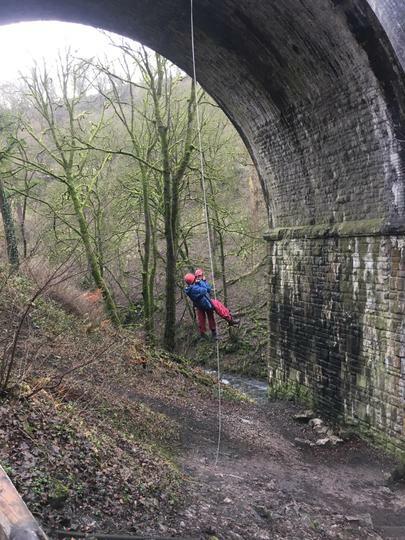 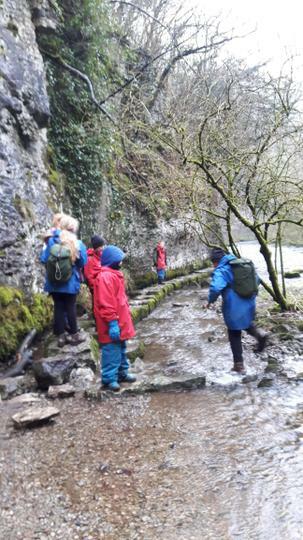 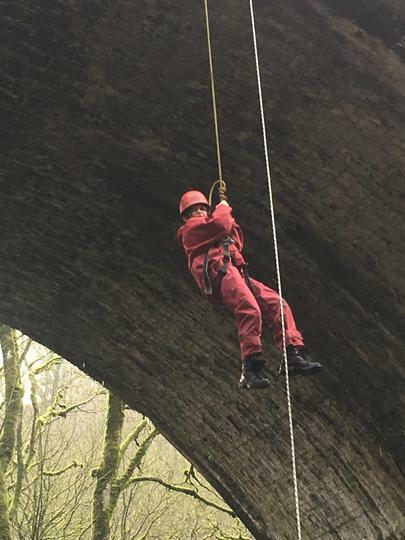 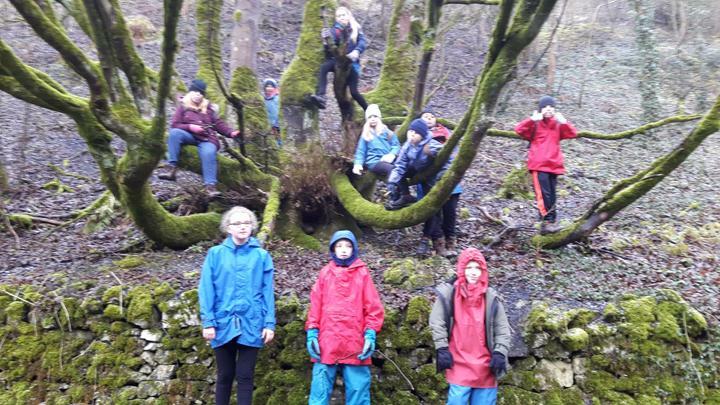 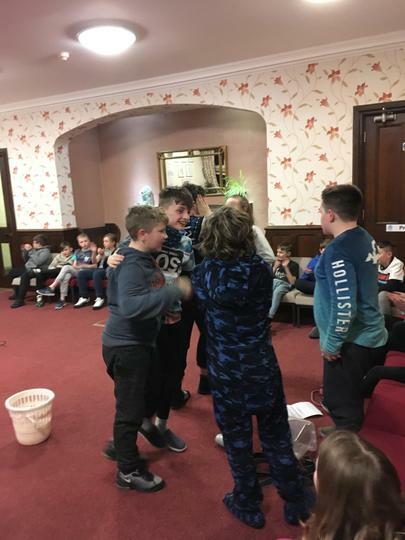 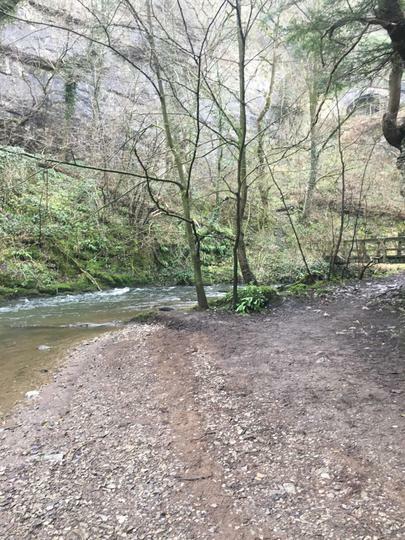 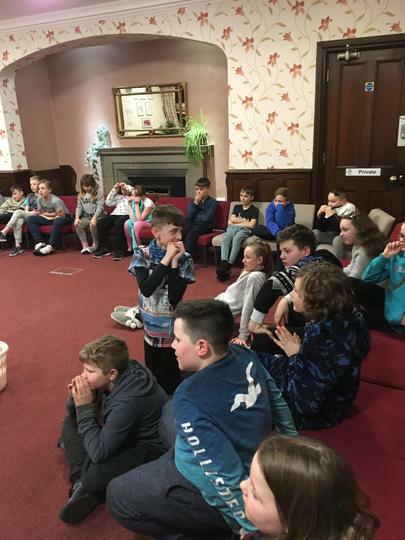 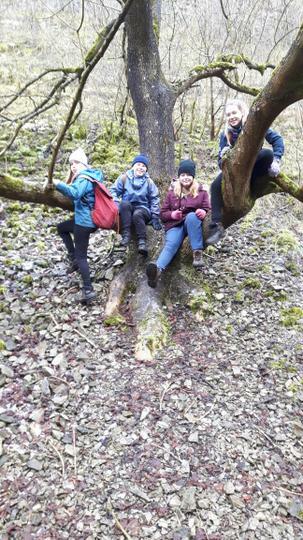 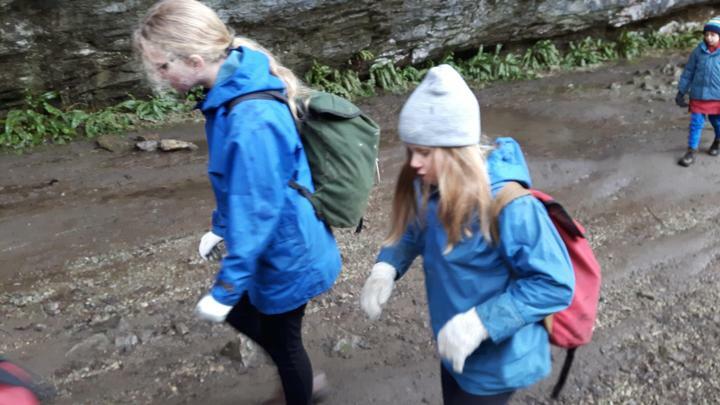 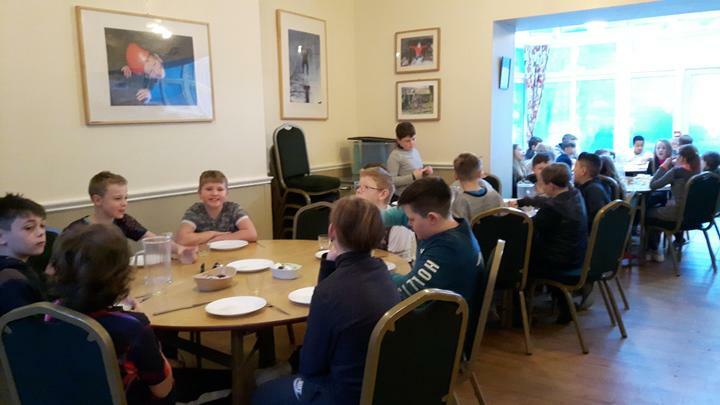 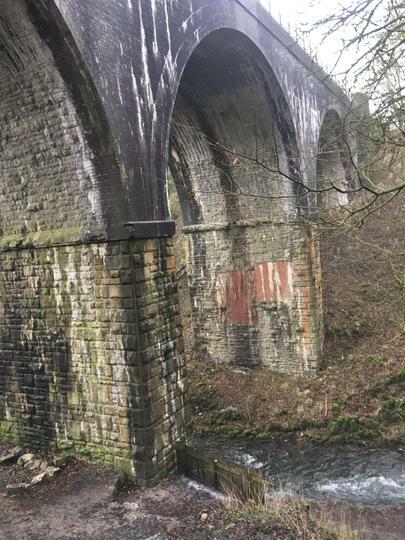 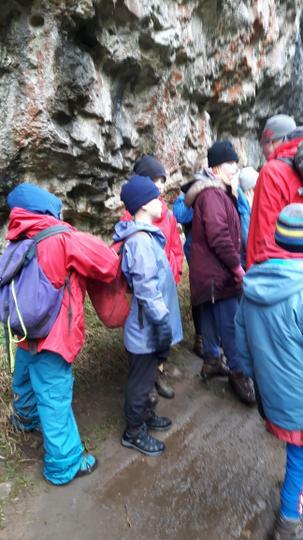 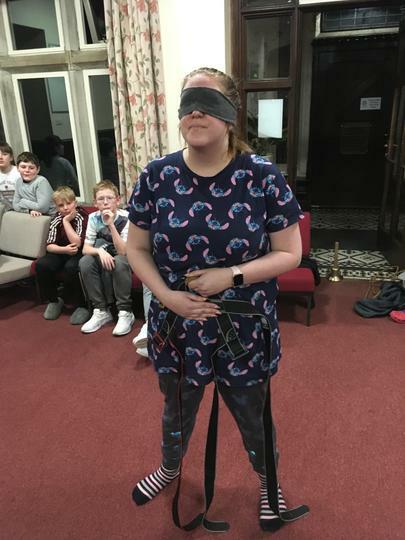 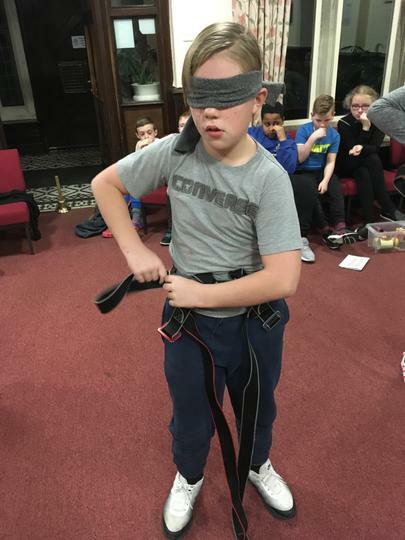 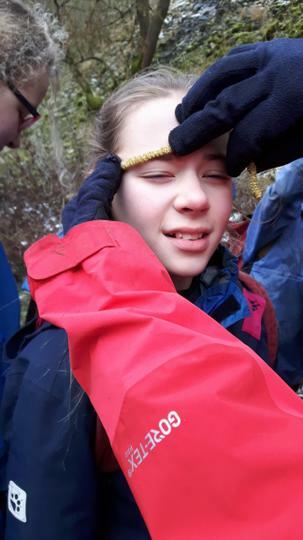 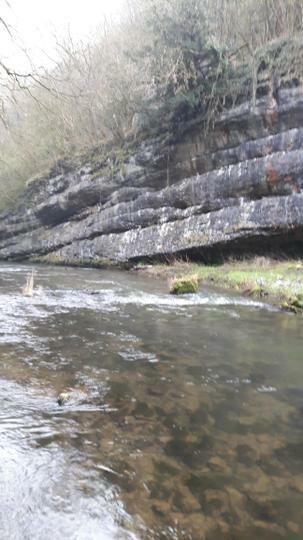 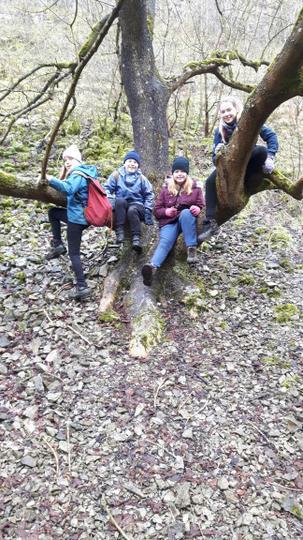 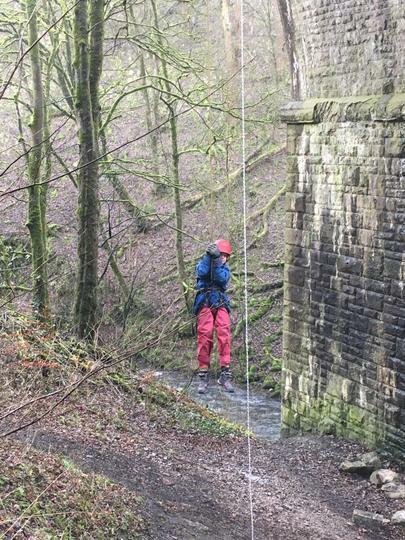 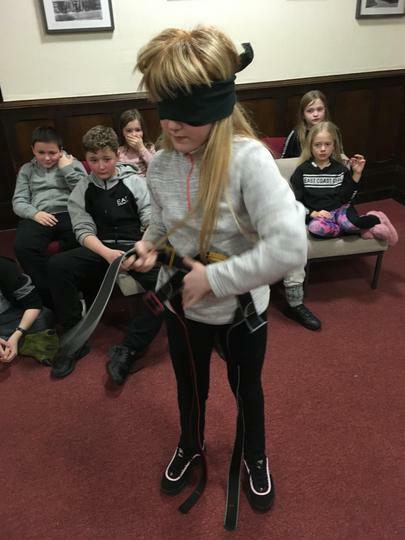 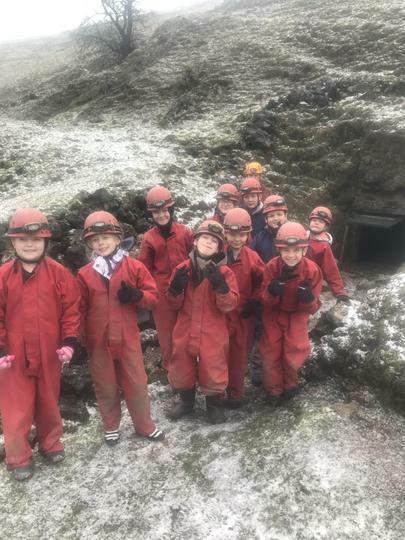 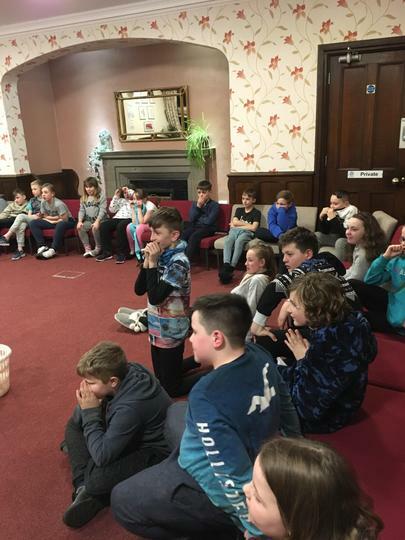 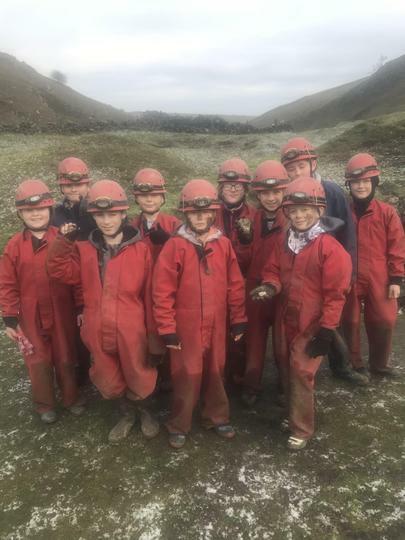 Group C have been caving this morning, though some of use were a bit apprehensive about going into the cave we all went in and explored the different areas. 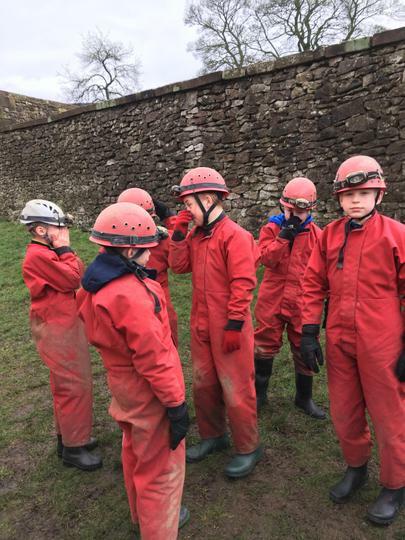 Unfortunately, we didn’t get any pictures whilst in there as we couldn’t take a phone! 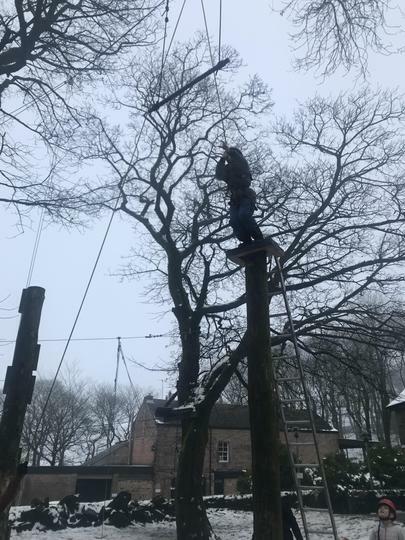 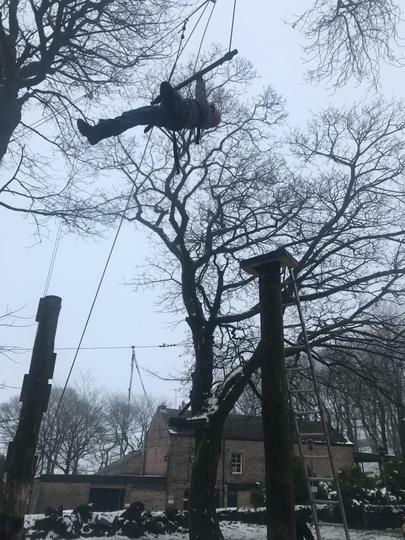 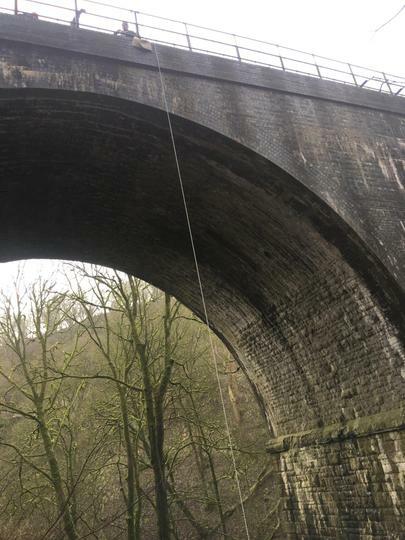 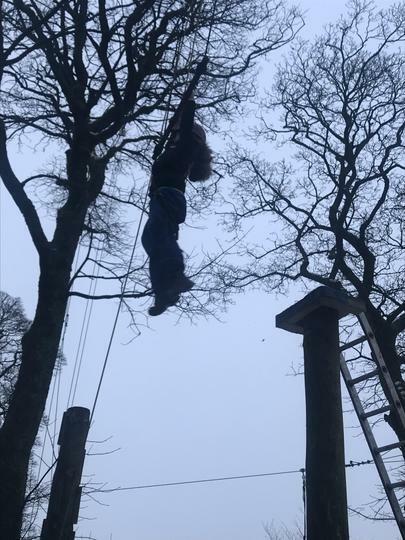 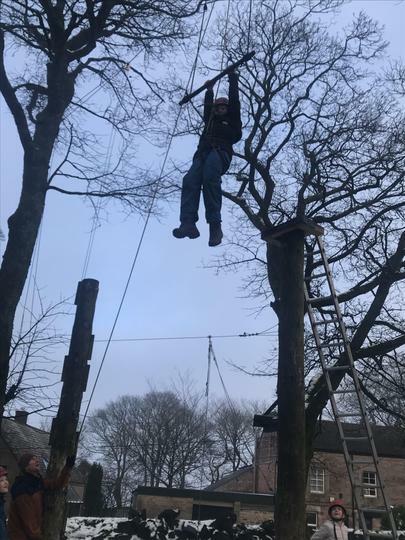 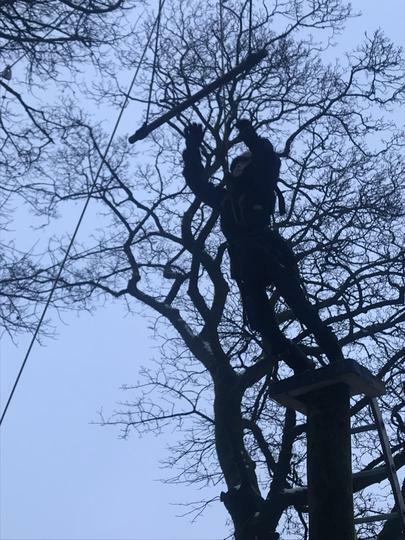 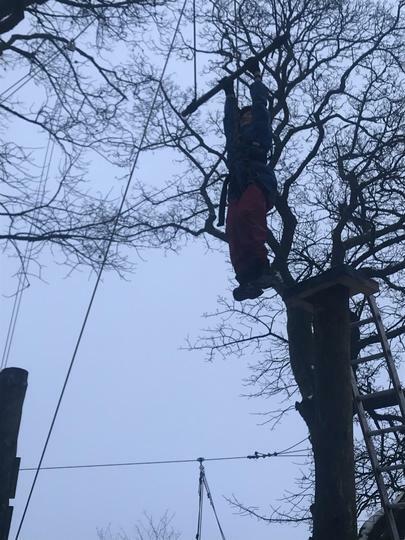 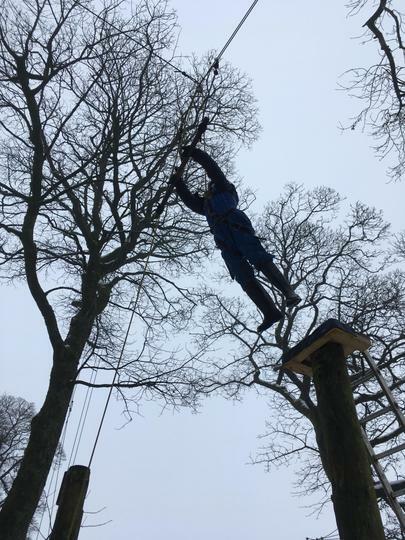 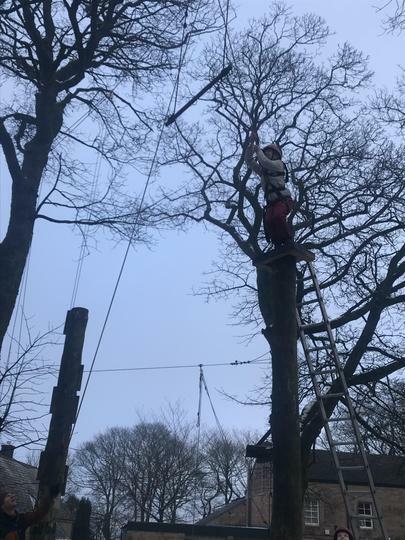 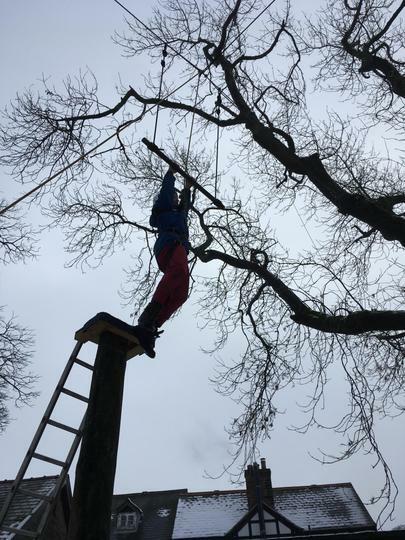 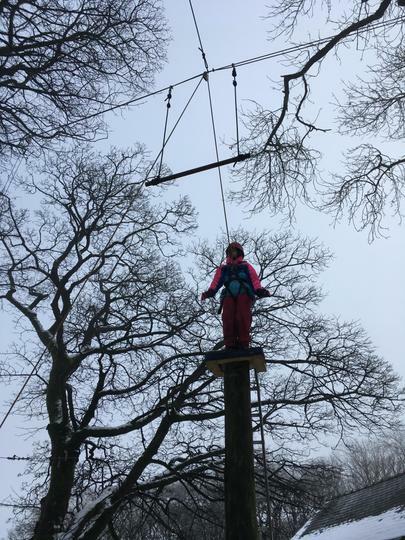 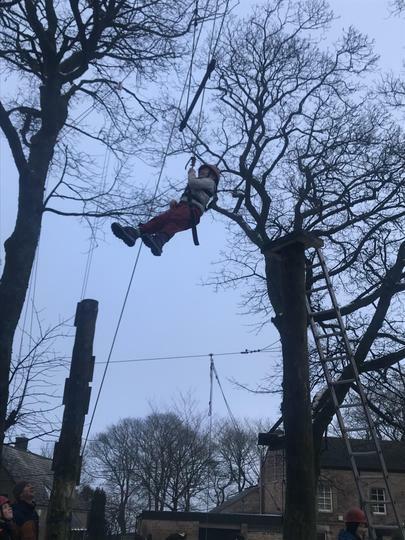 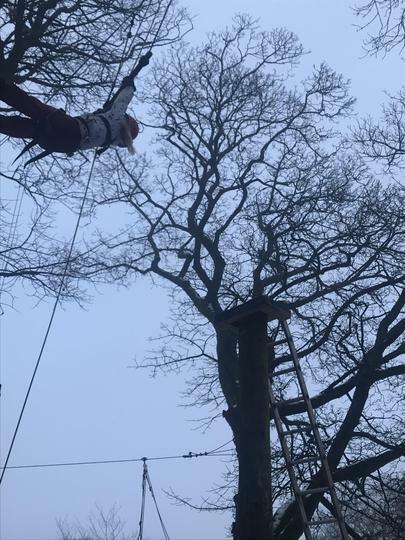 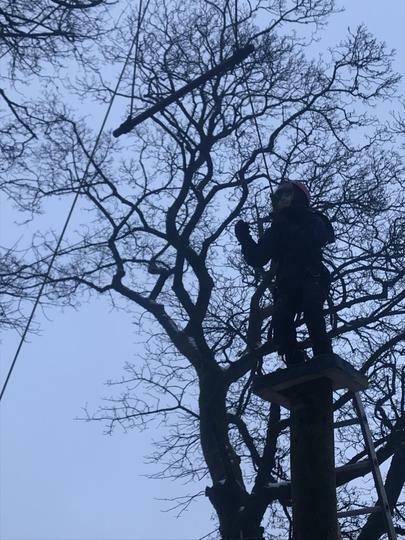 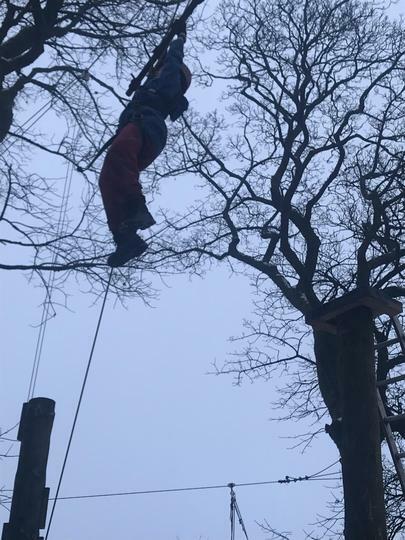 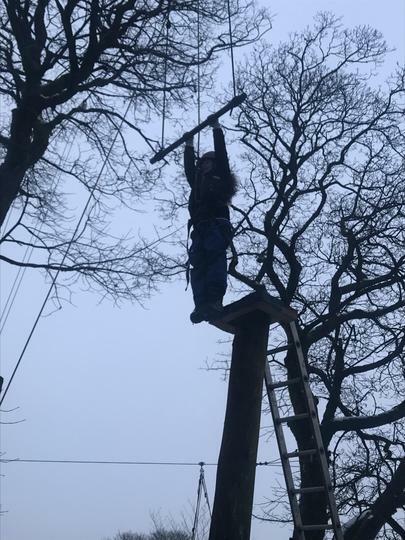 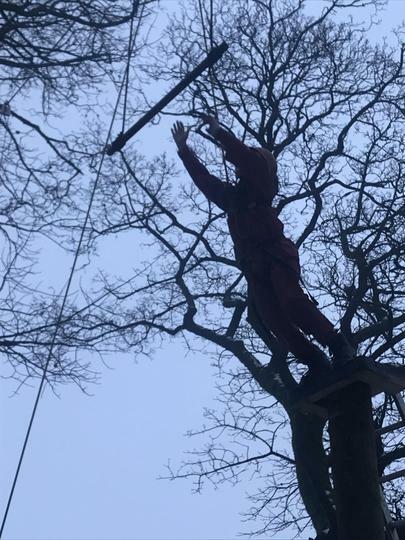 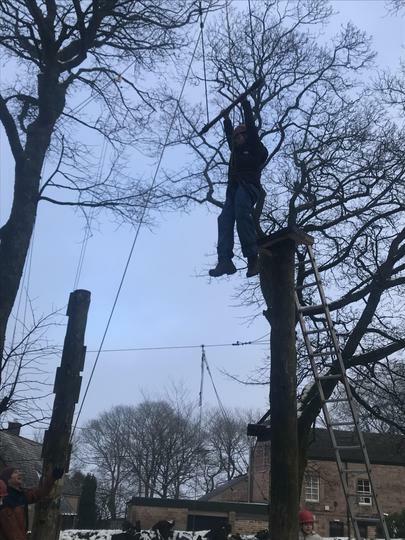 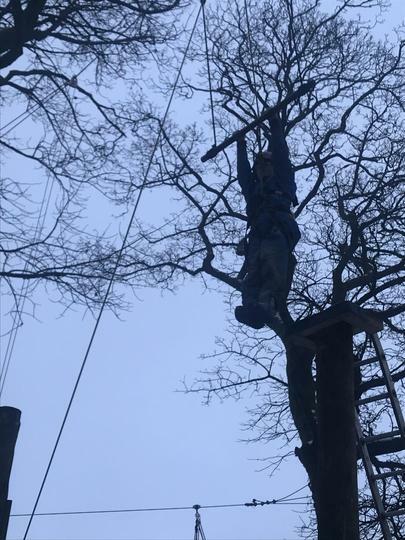 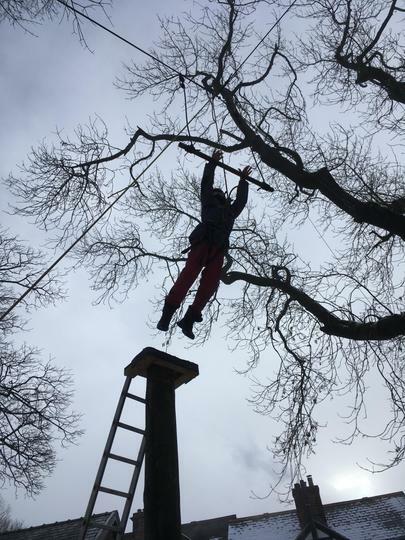 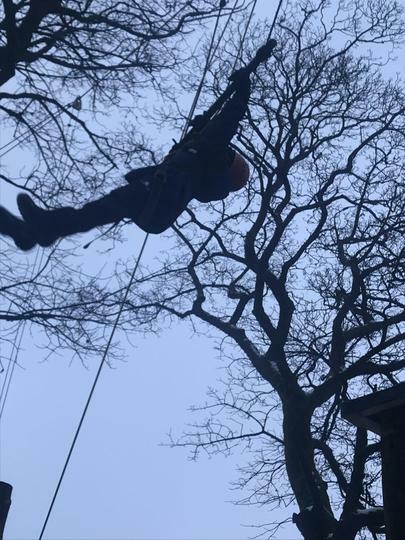 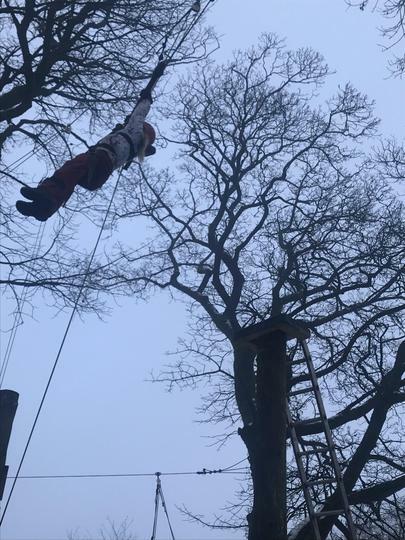 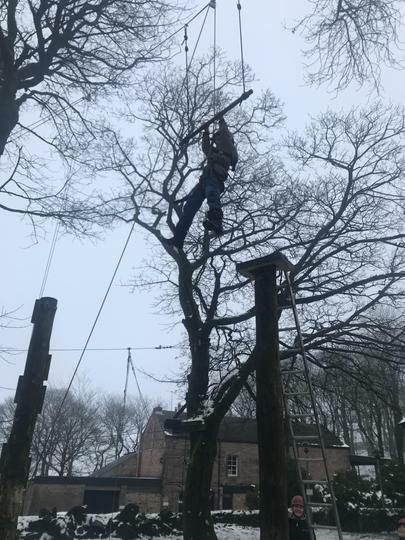 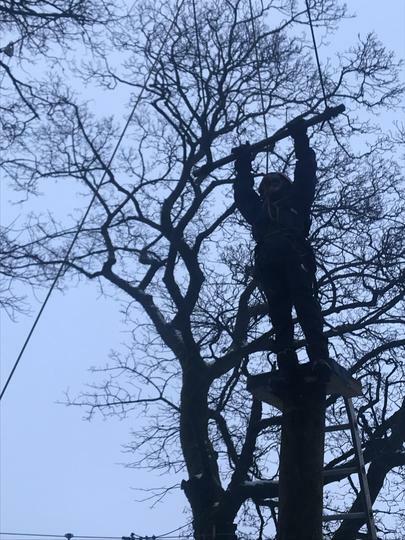 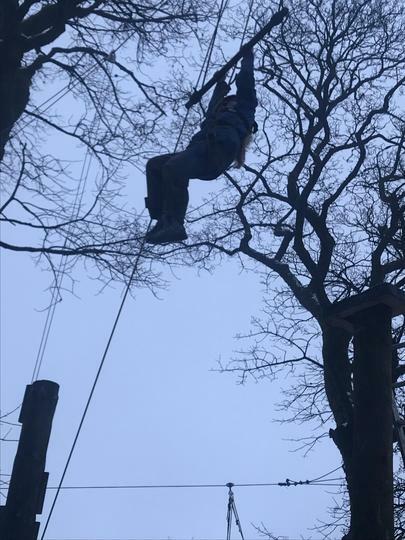 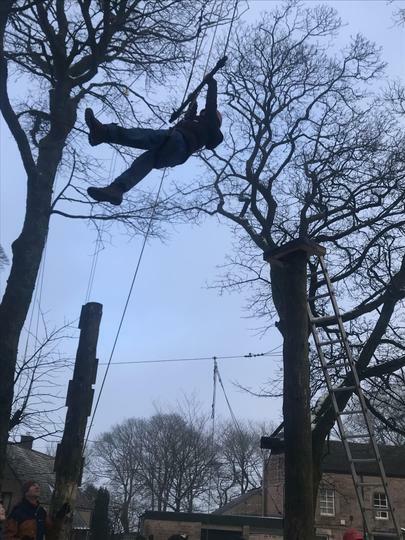 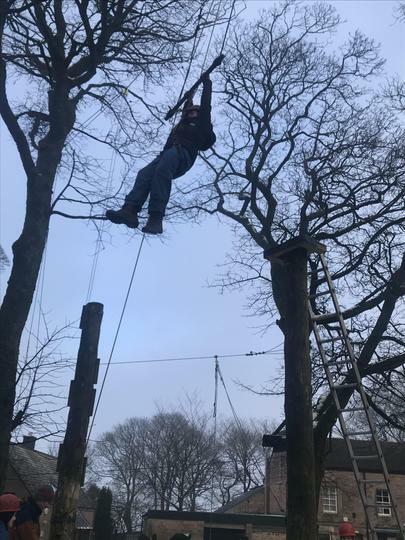 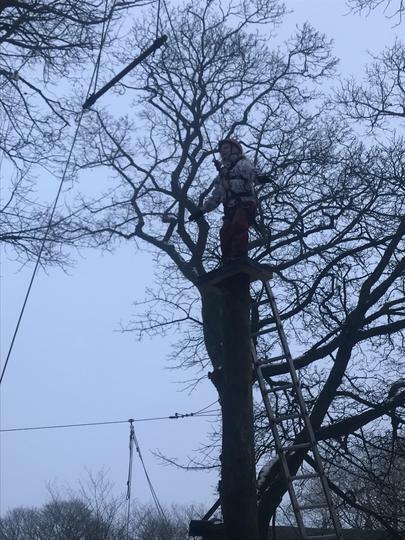 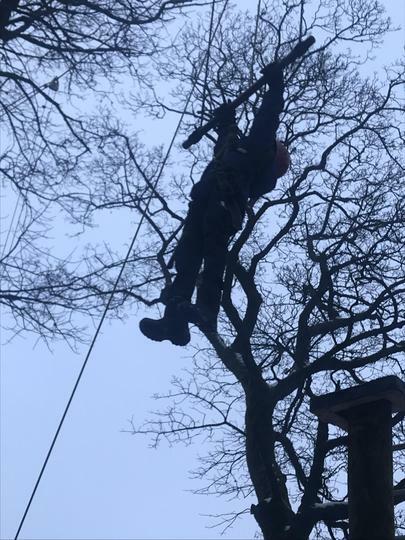 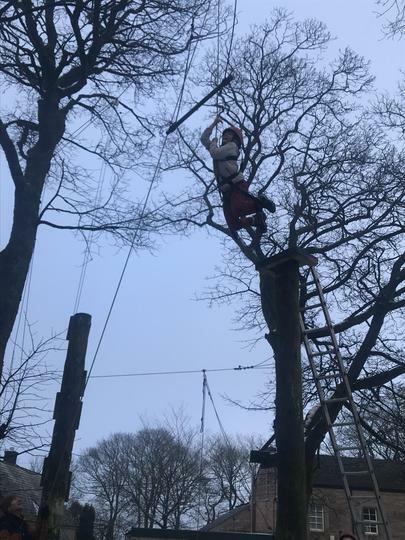 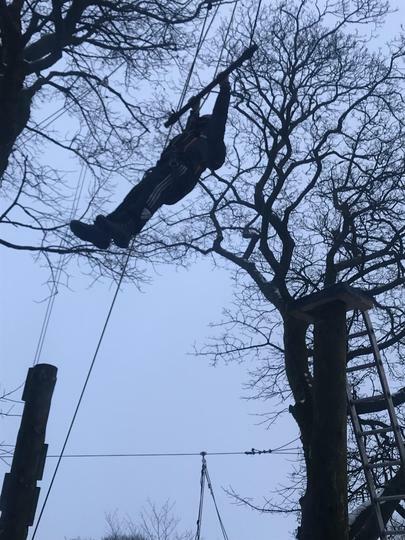 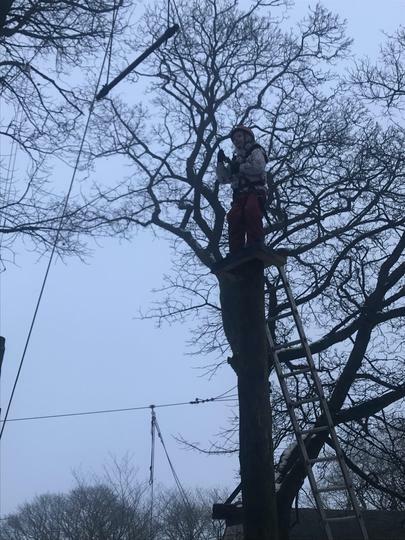 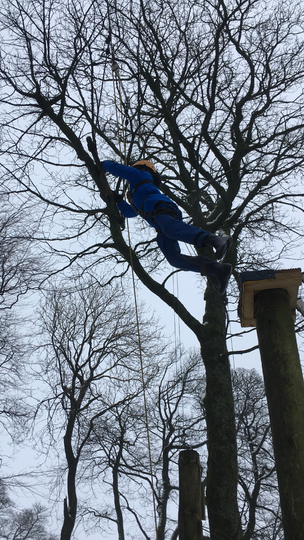 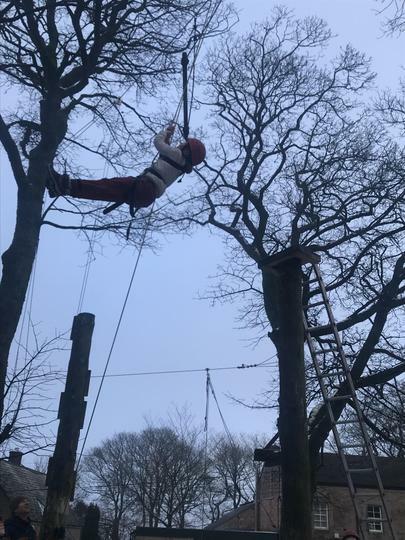 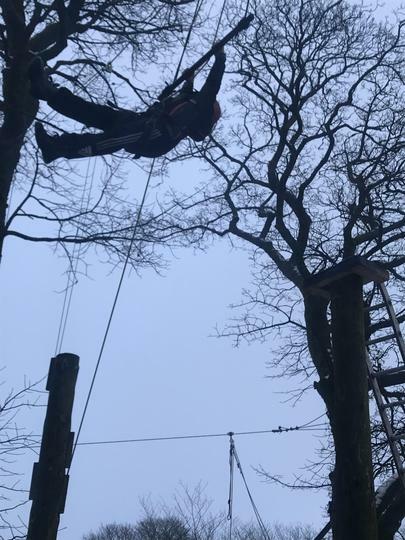 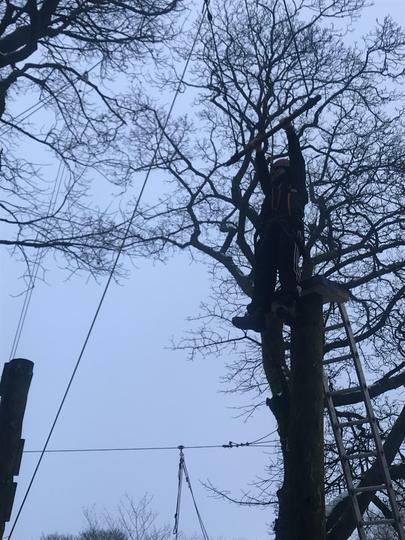 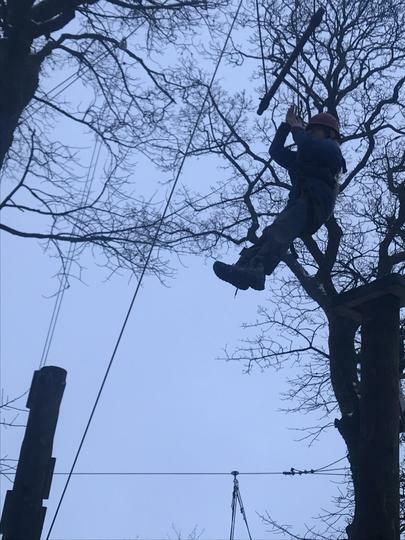 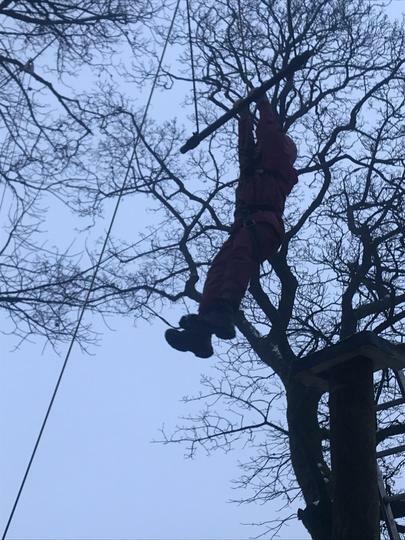 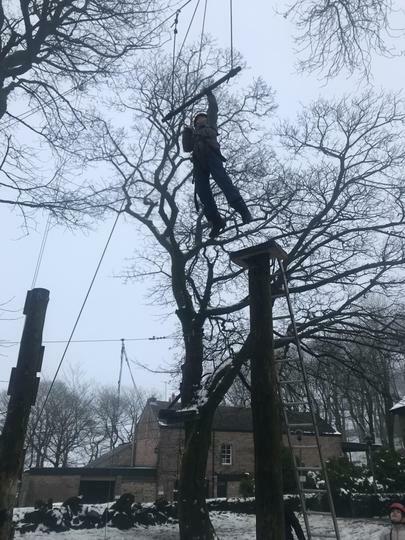 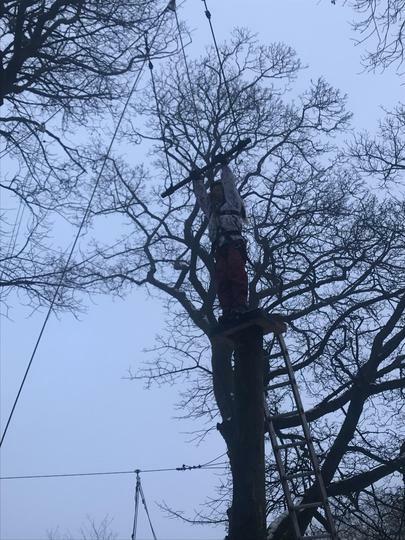 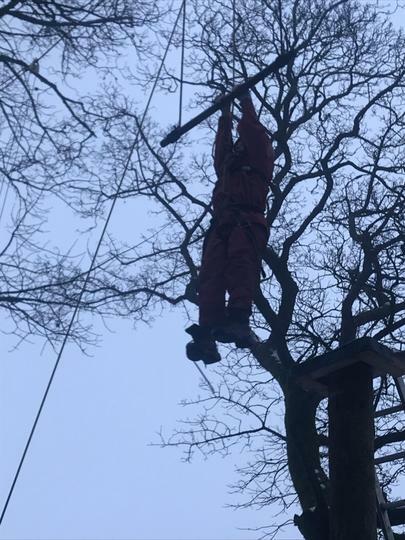 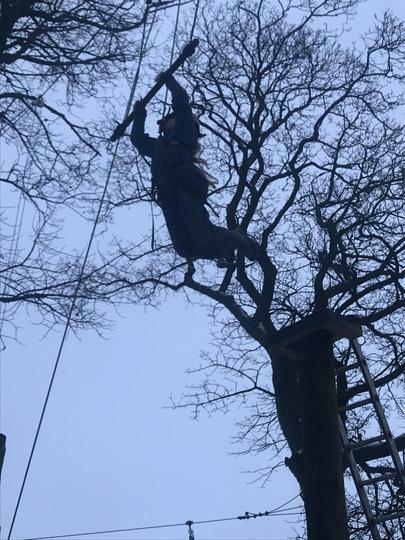 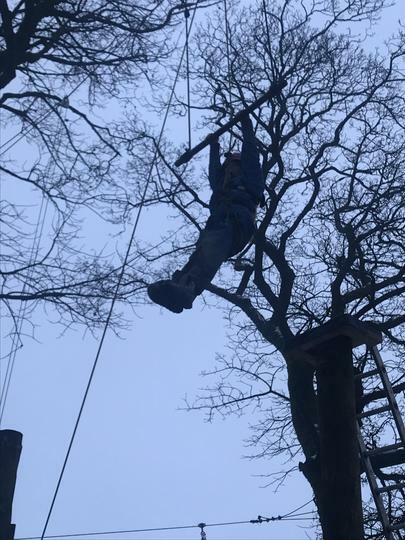 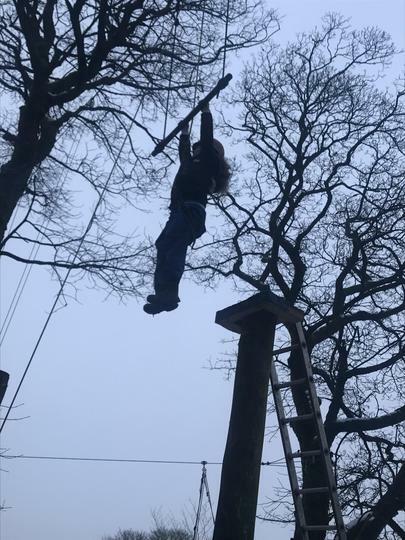 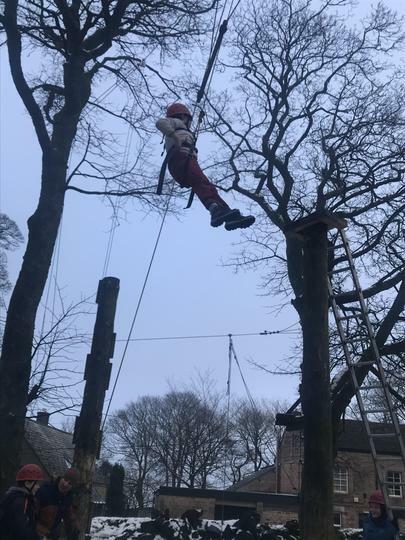 This afternoon we spent some time on the high ropes, we ALL completed the leap of faith, including myself, as the whole team made the jump! 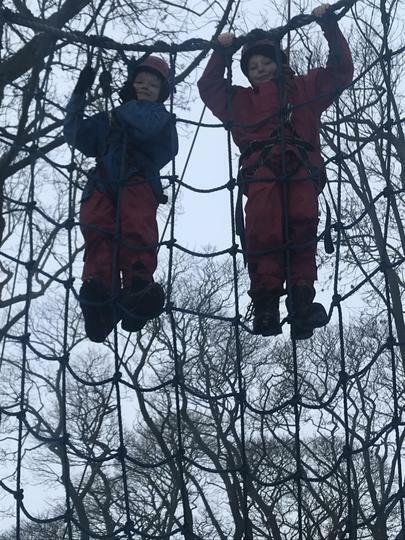 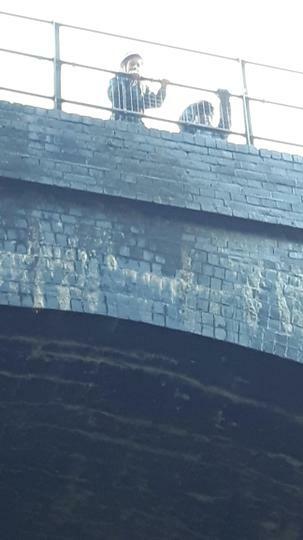 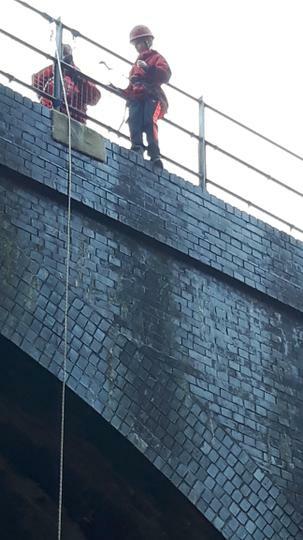 I couldn’t be more proud of them, as quite a few of them were worried about anything involving heights at the beginning of the week! 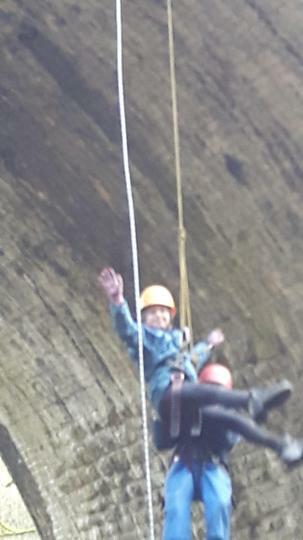 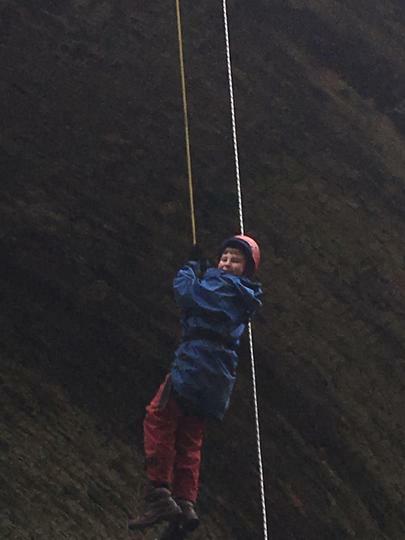 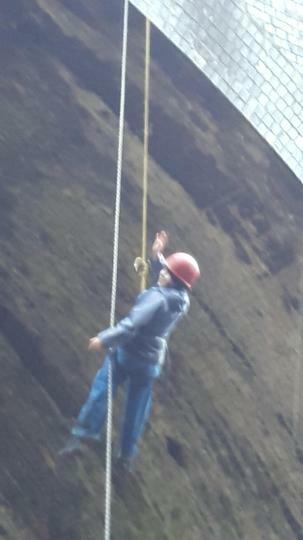 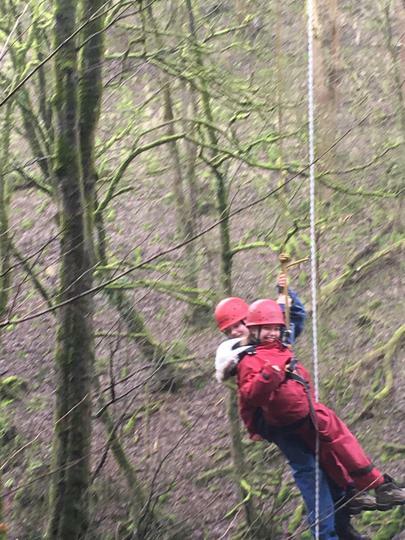 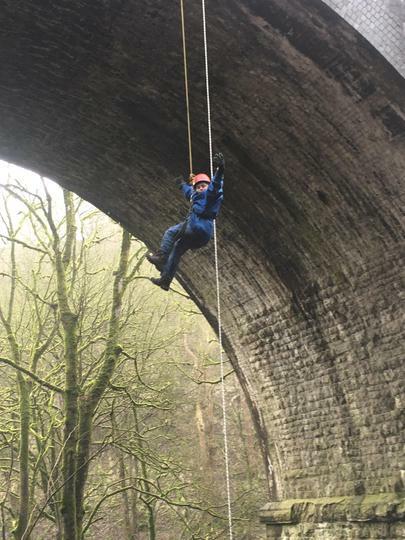 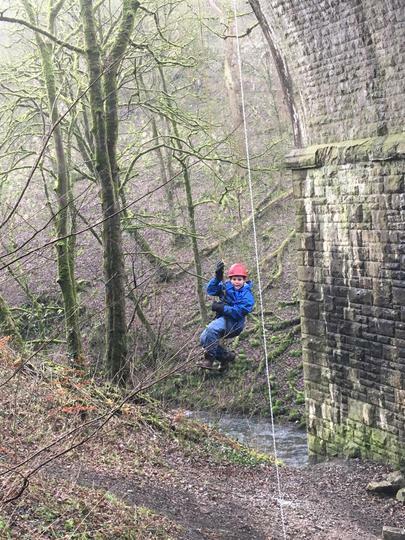 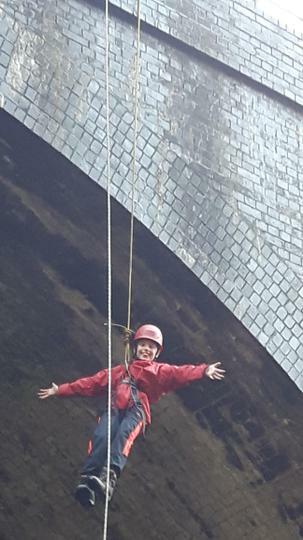 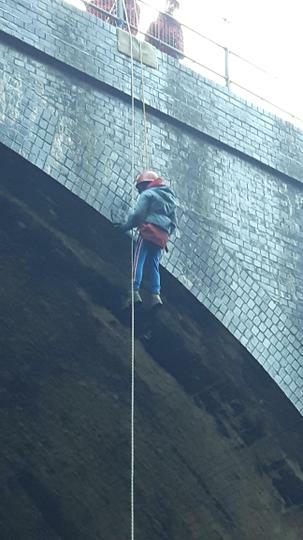 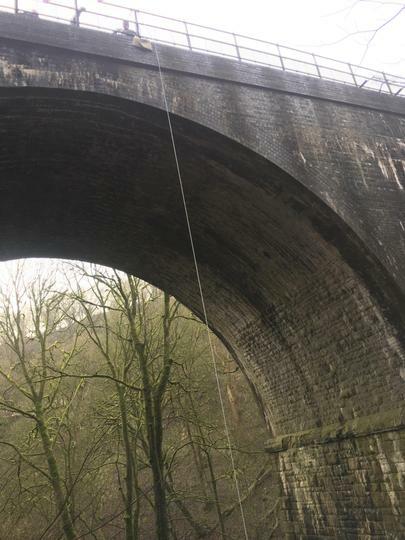 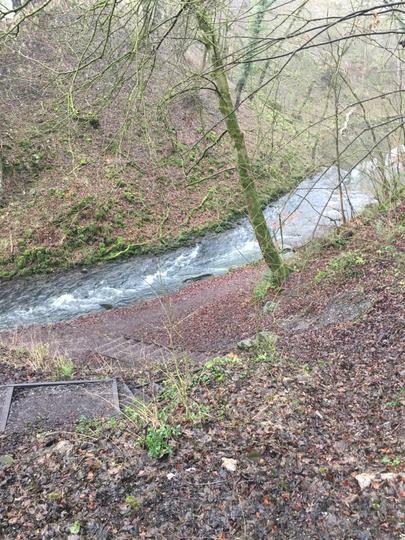 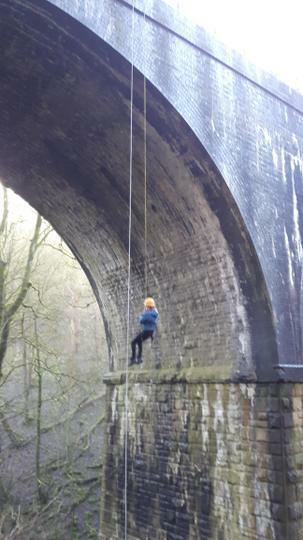 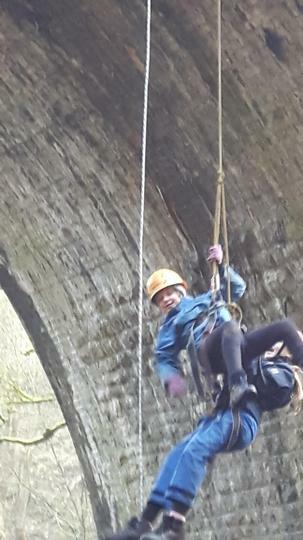 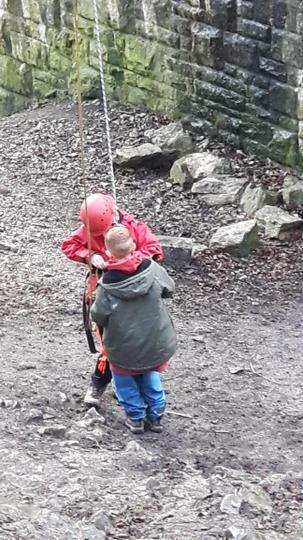 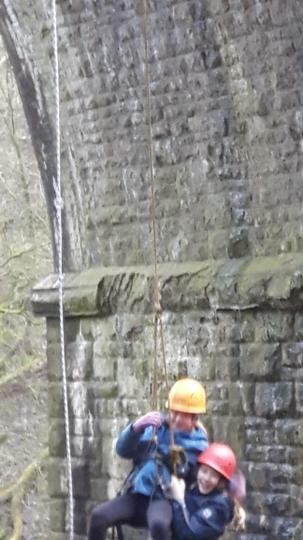 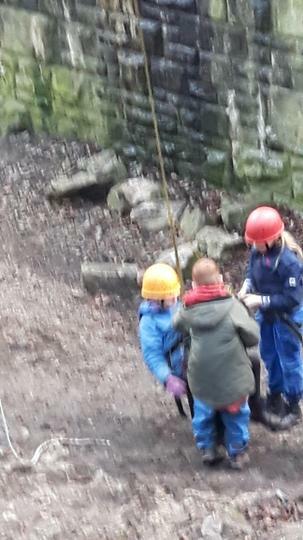 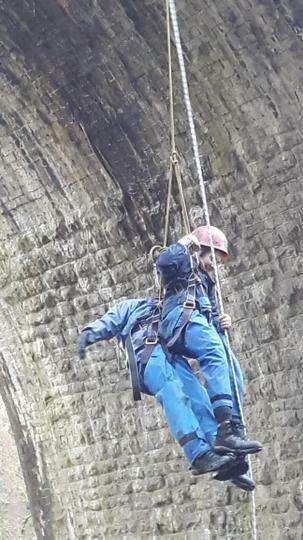 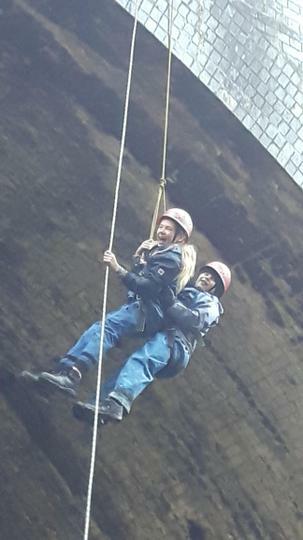 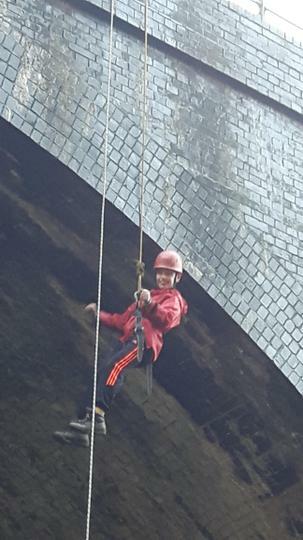 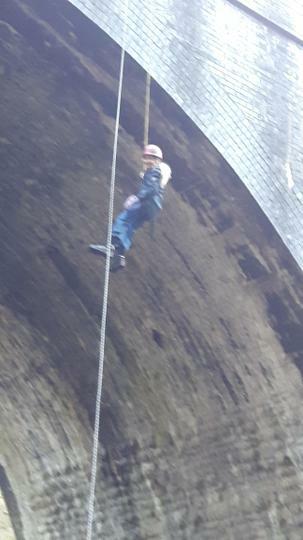 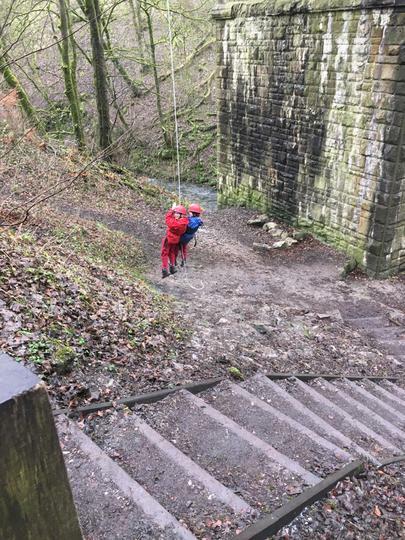 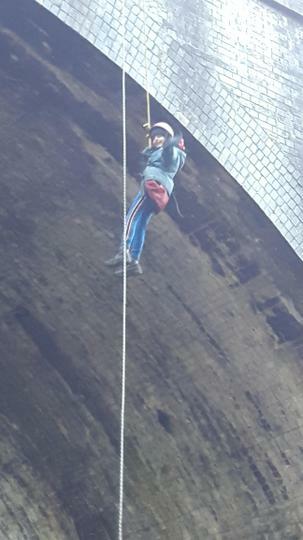 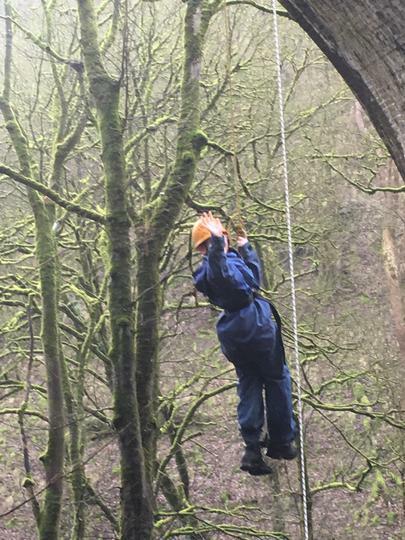 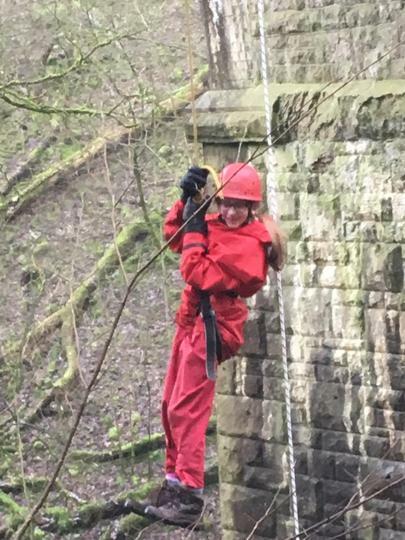 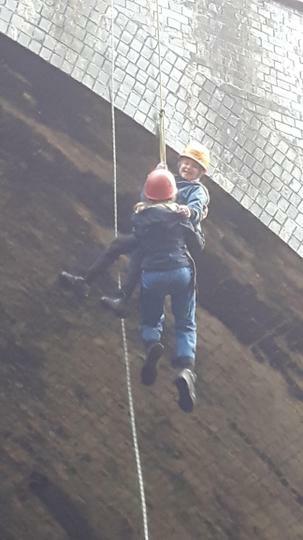 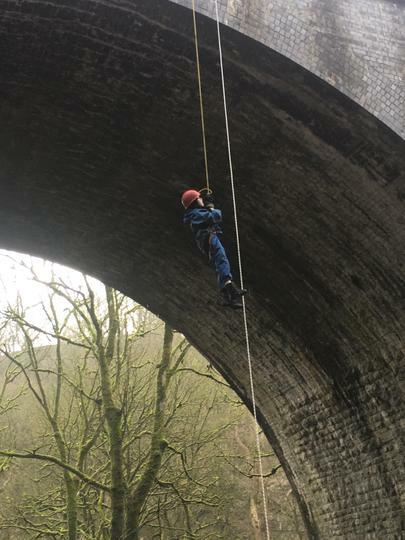 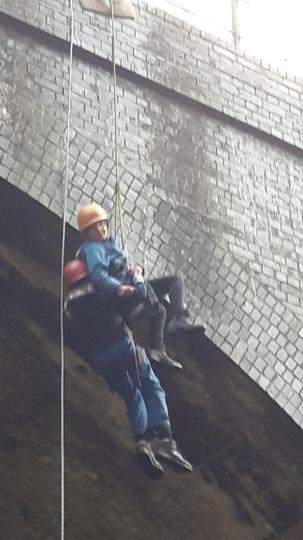 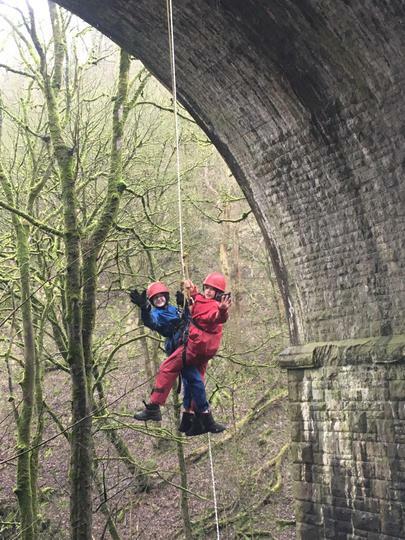 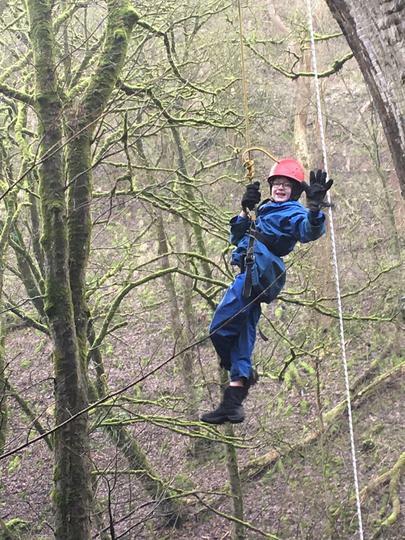 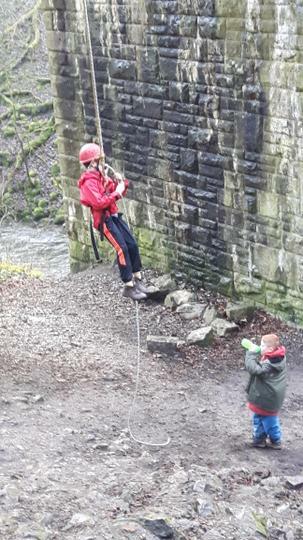 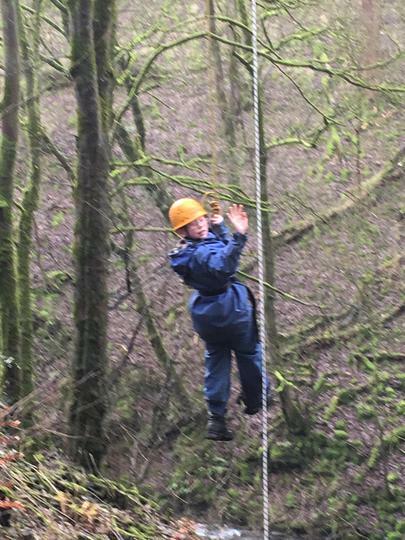 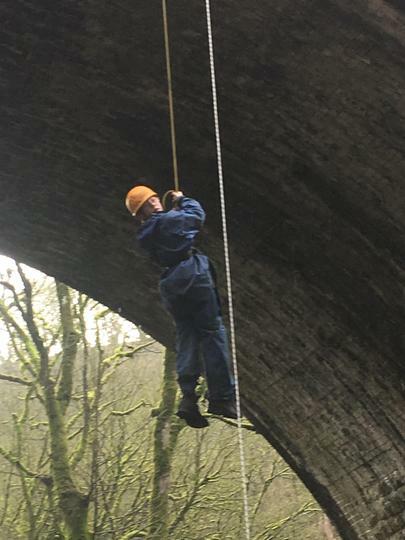 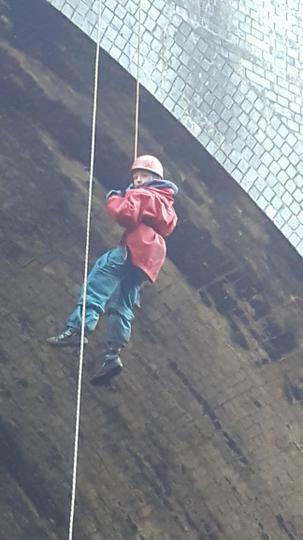 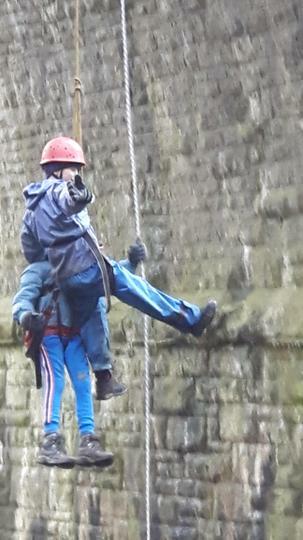 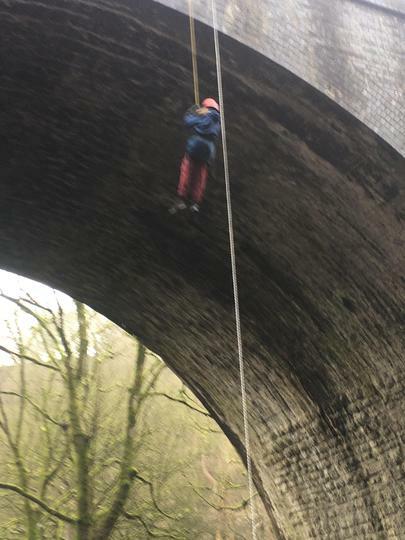 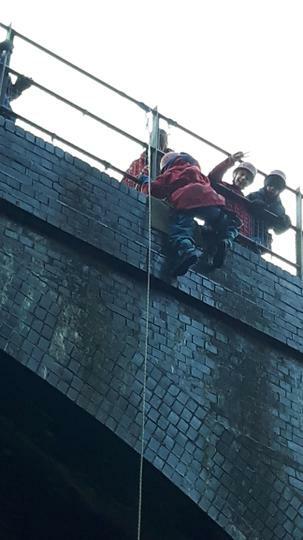 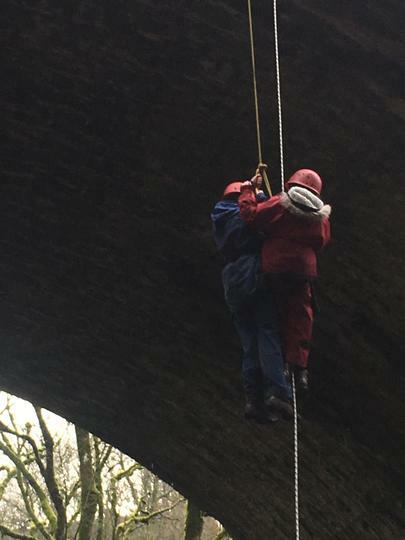 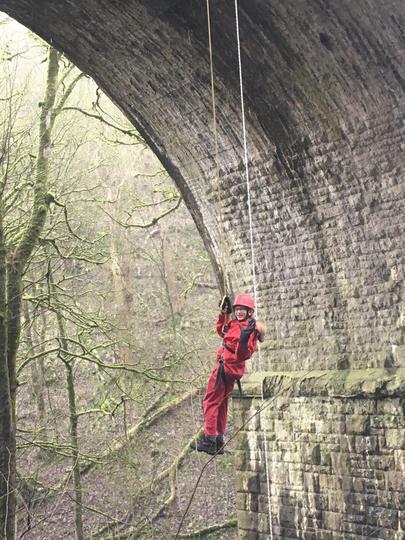 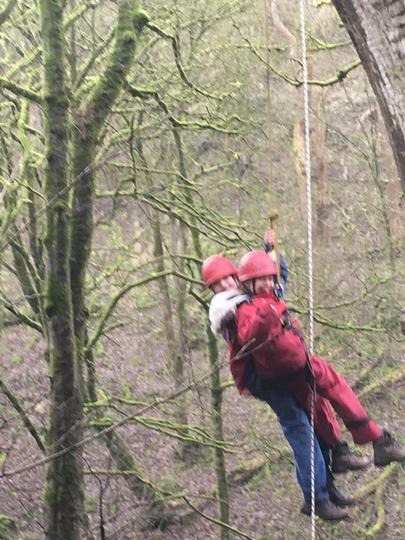 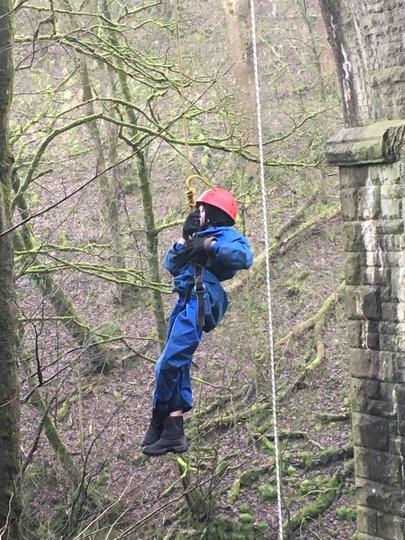 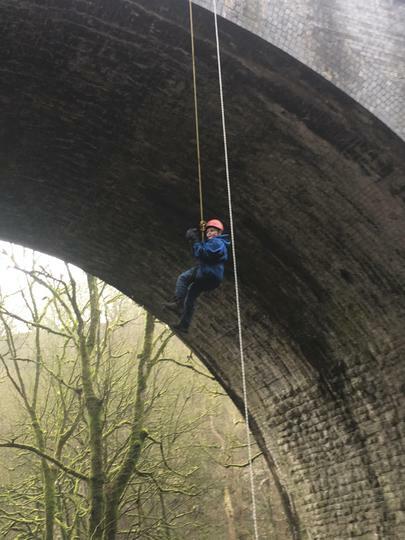 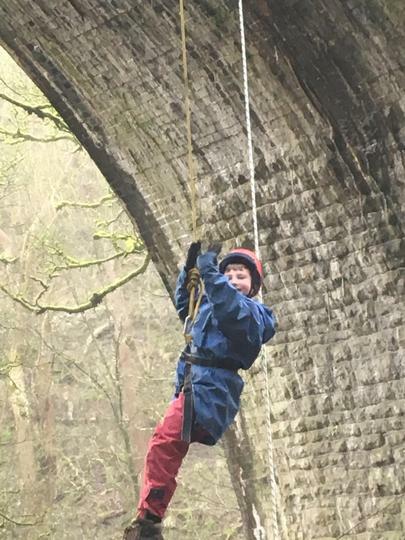 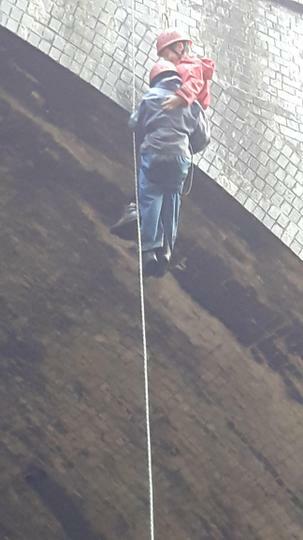 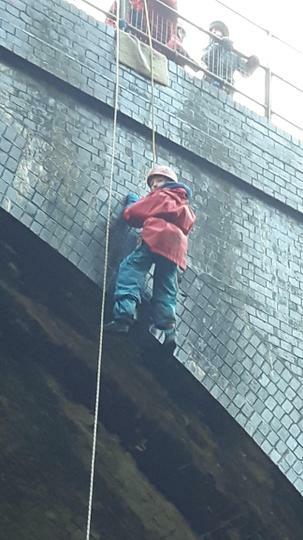 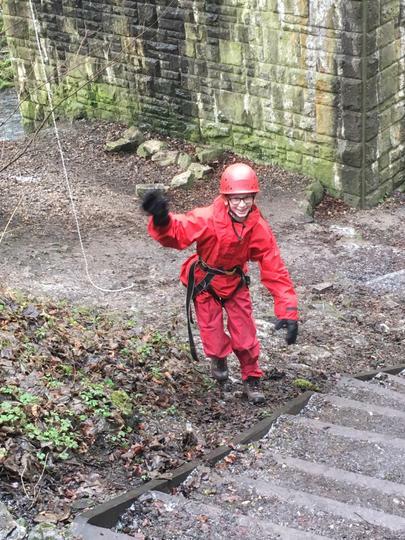 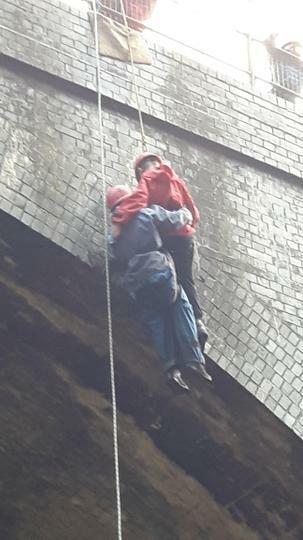 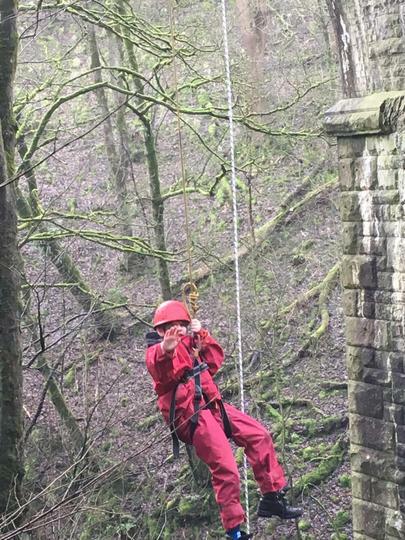 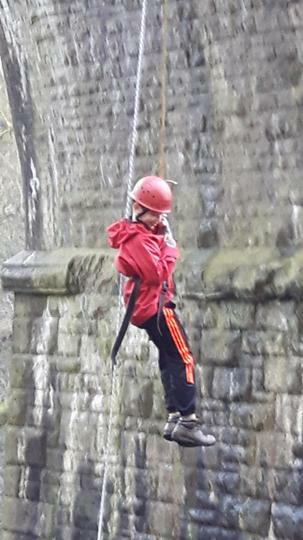 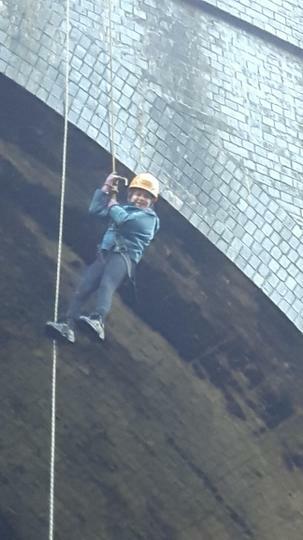 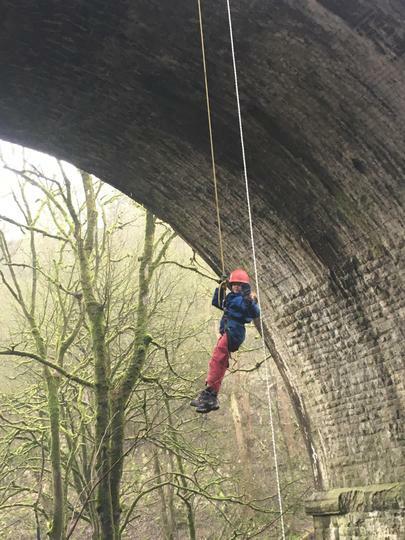 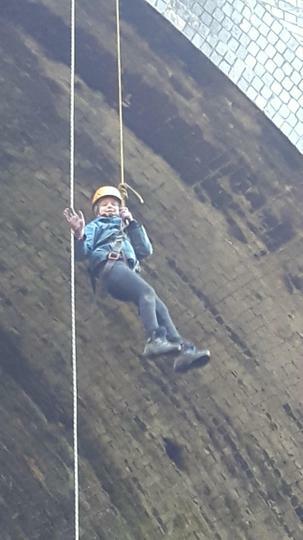 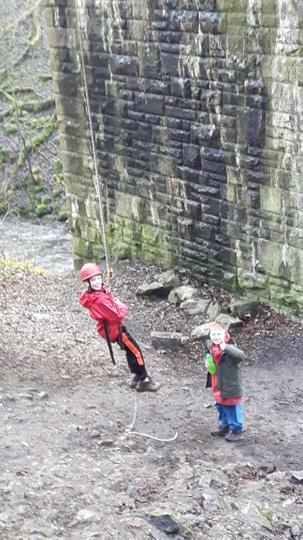 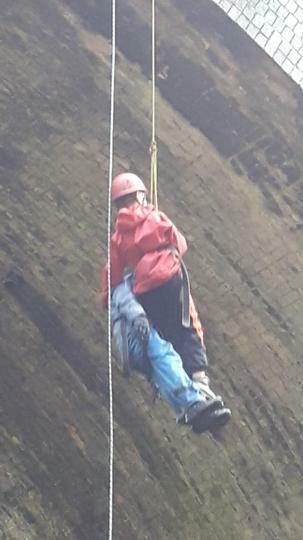 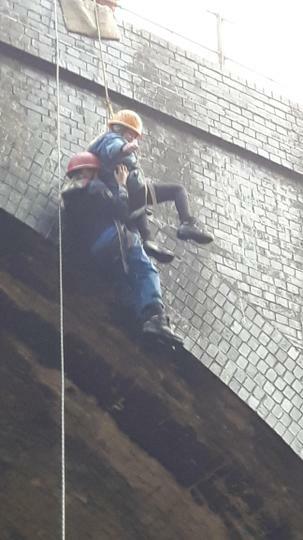 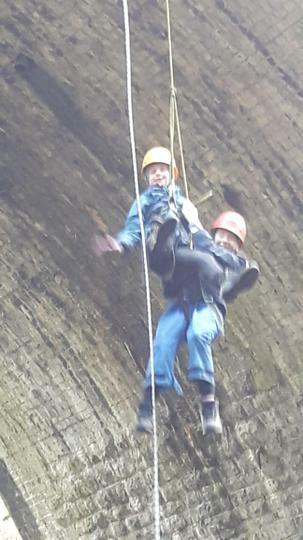 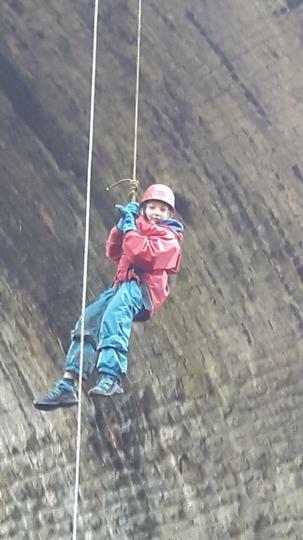 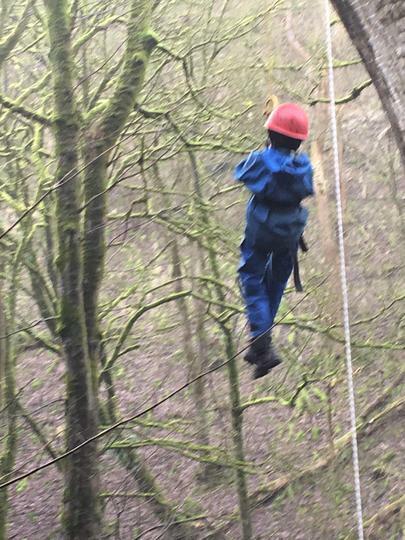 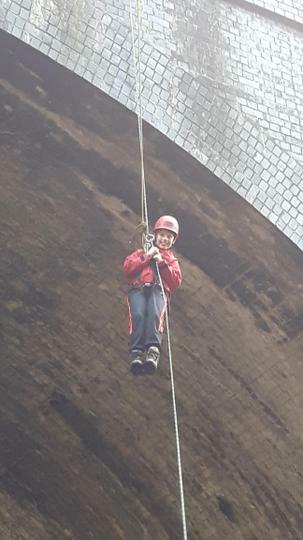 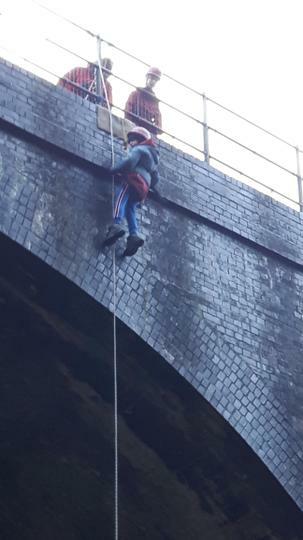 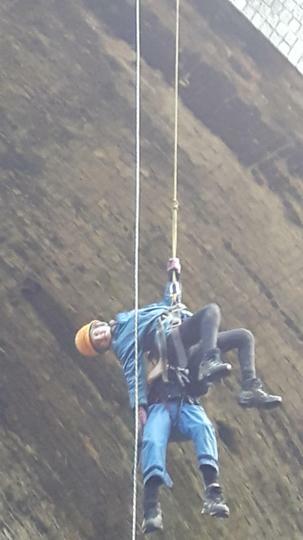 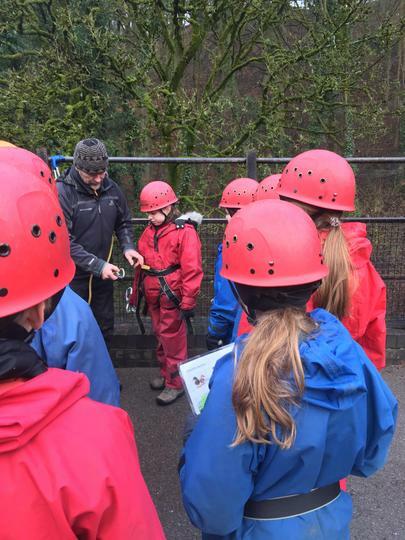 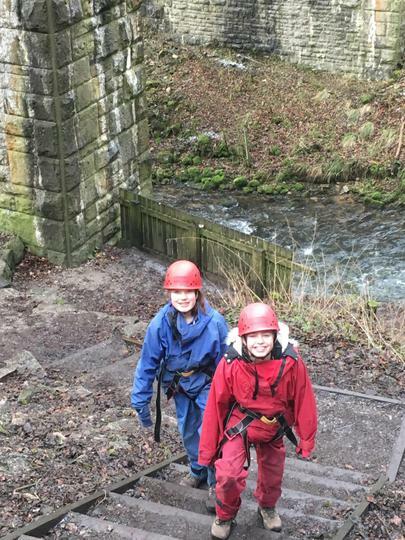 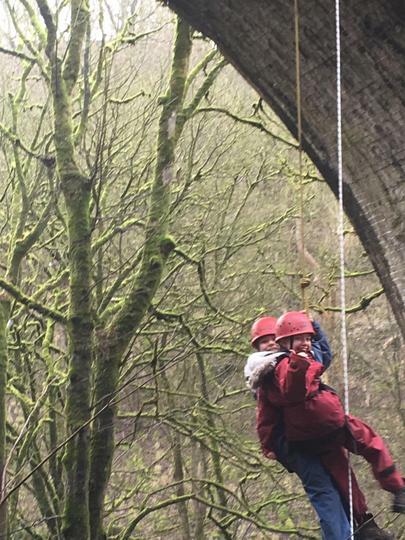 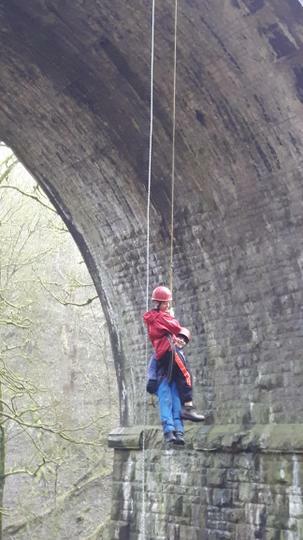 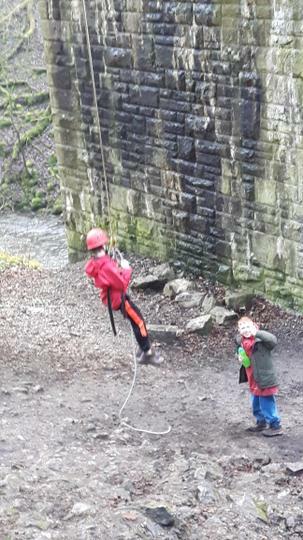 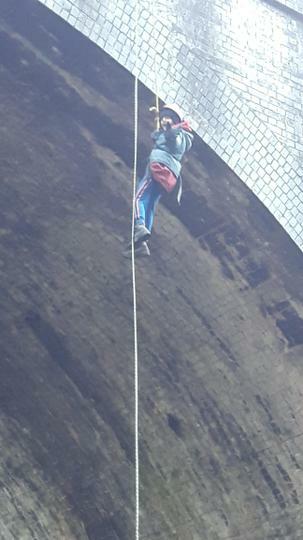 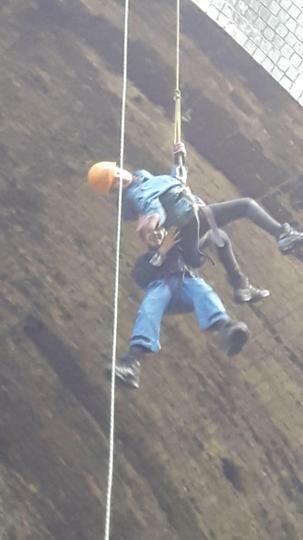 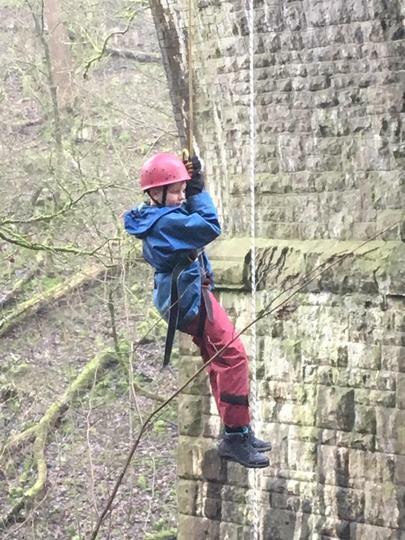 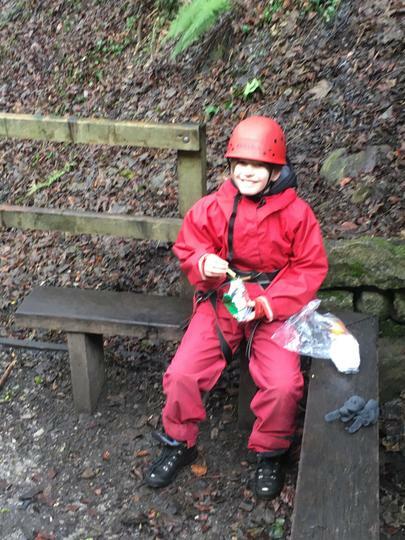 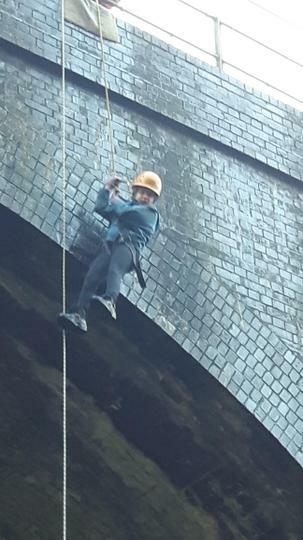 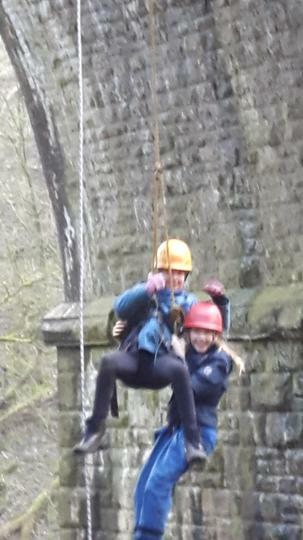 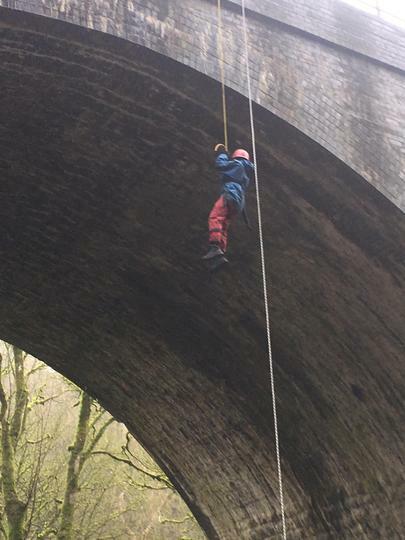 We’ve had a fun-filled day on the zip wire, doing the leap of faith and caving this afternoon. 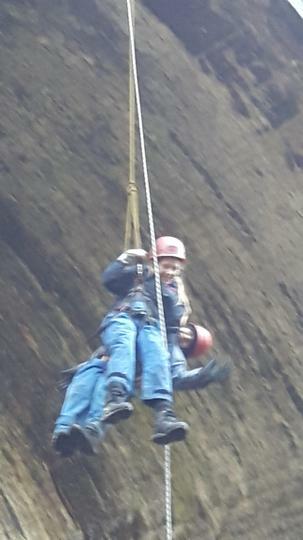 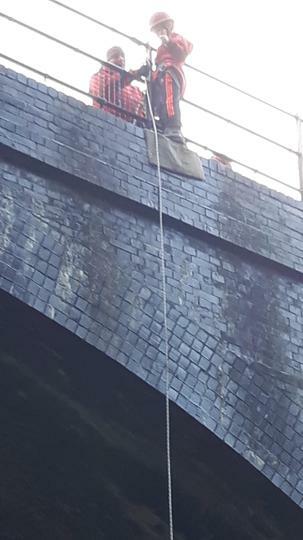 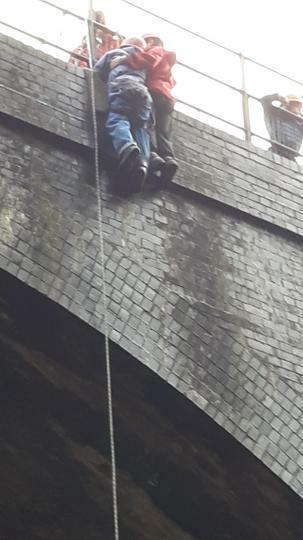 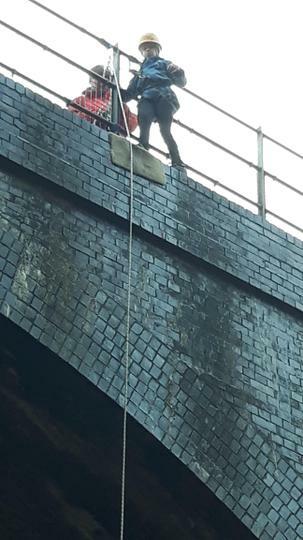 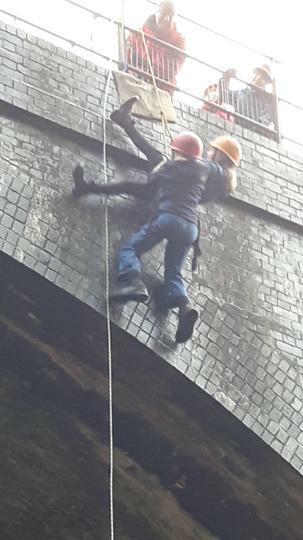 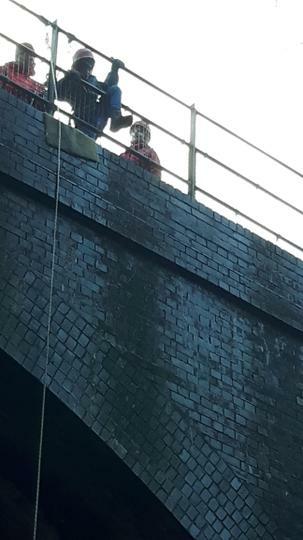 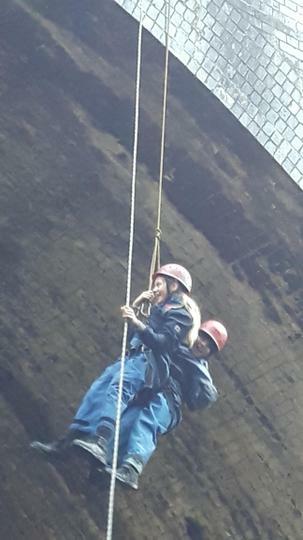 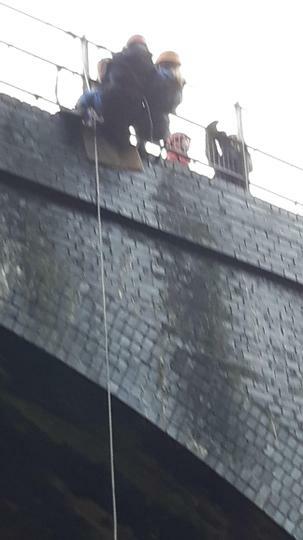 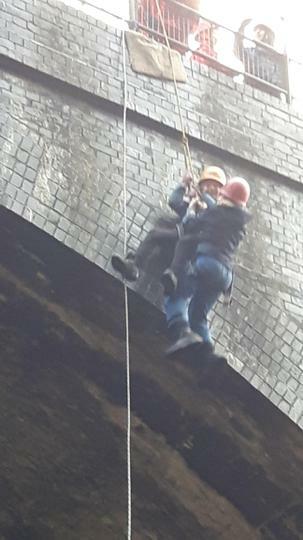 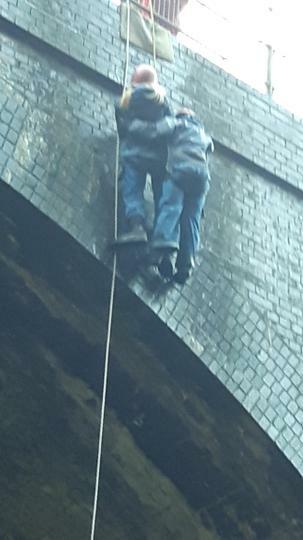 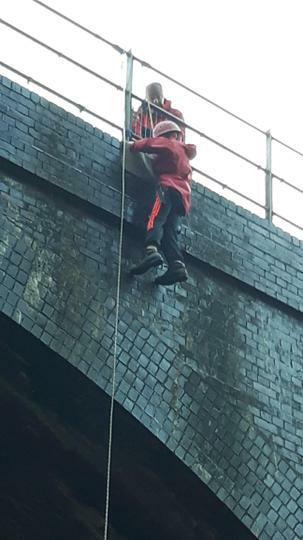 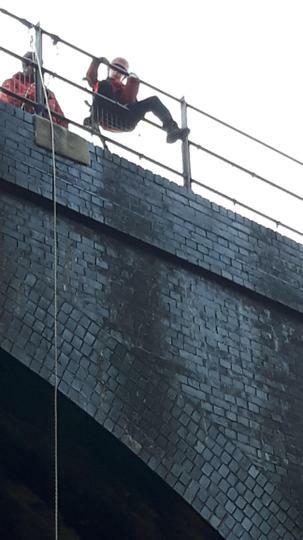 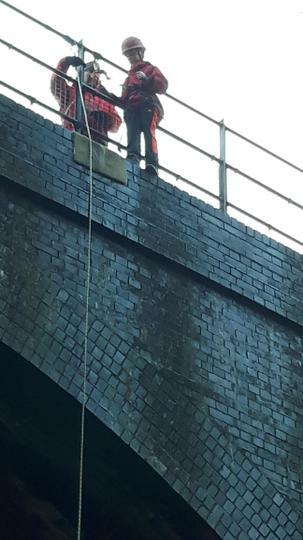 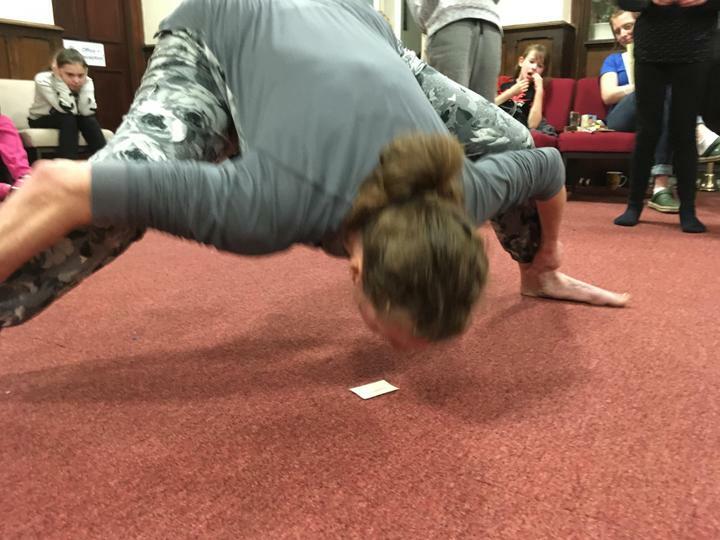 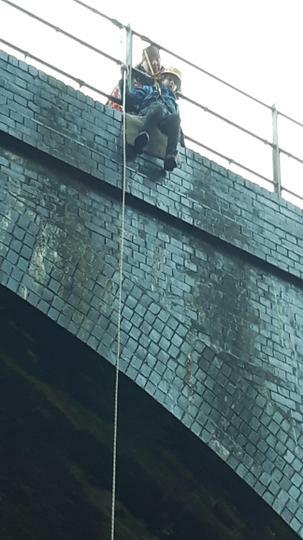 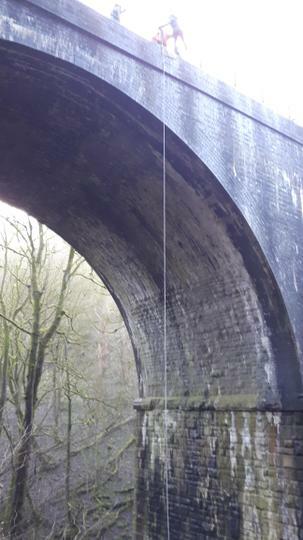 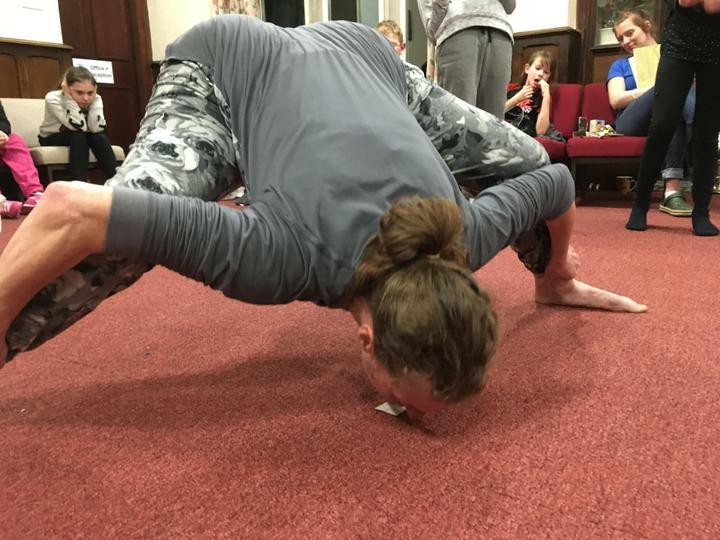 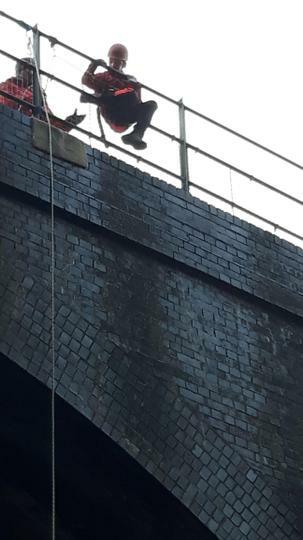 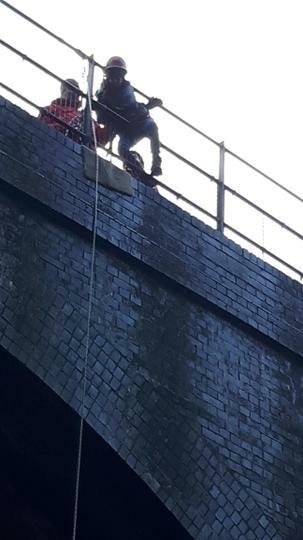 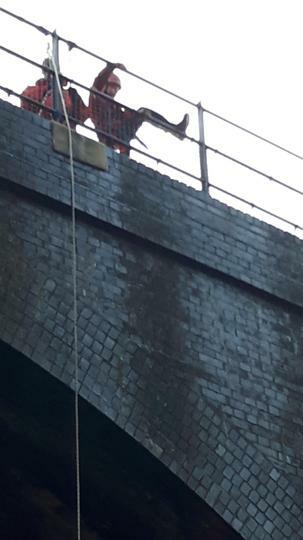 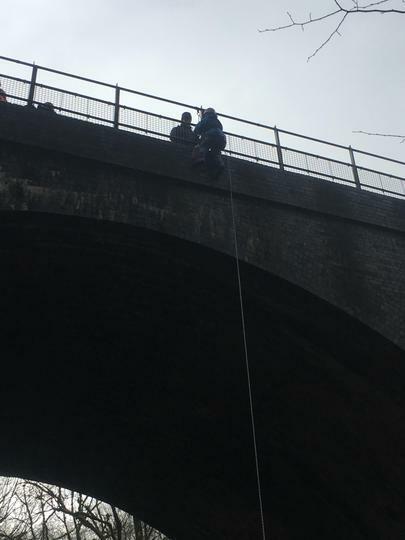 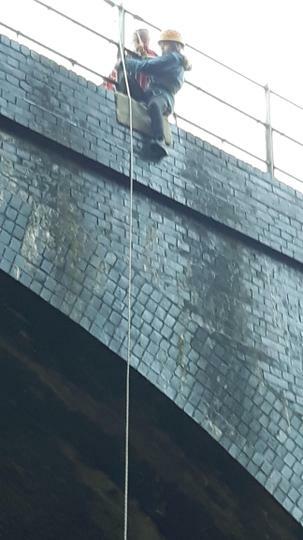 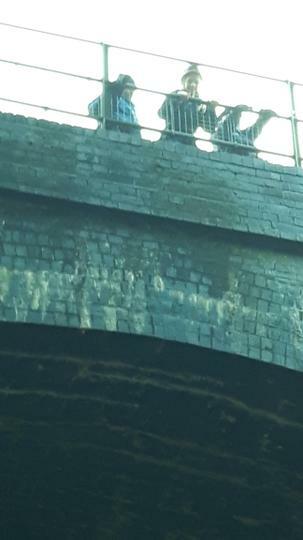 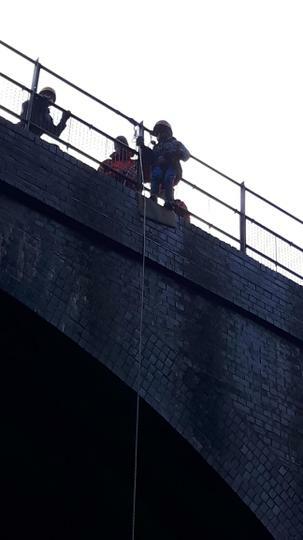 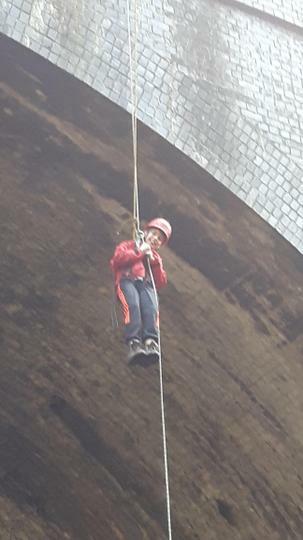 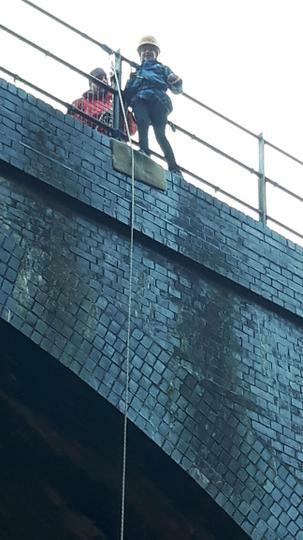 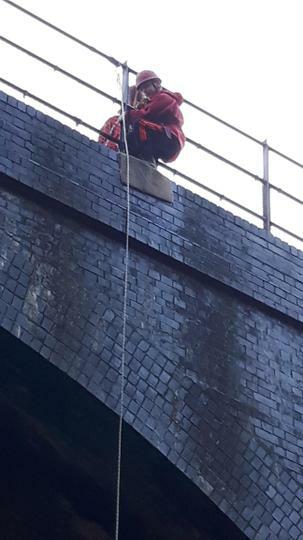 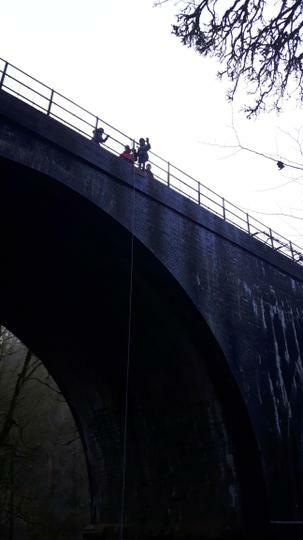 A few of us were a little nervous but we all gave it a good go! 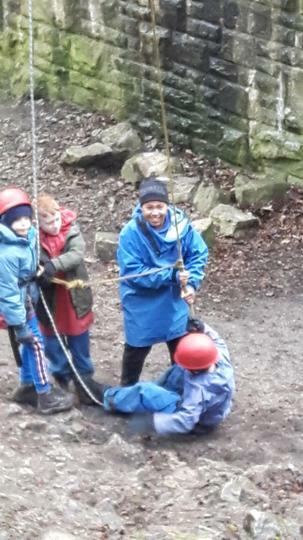 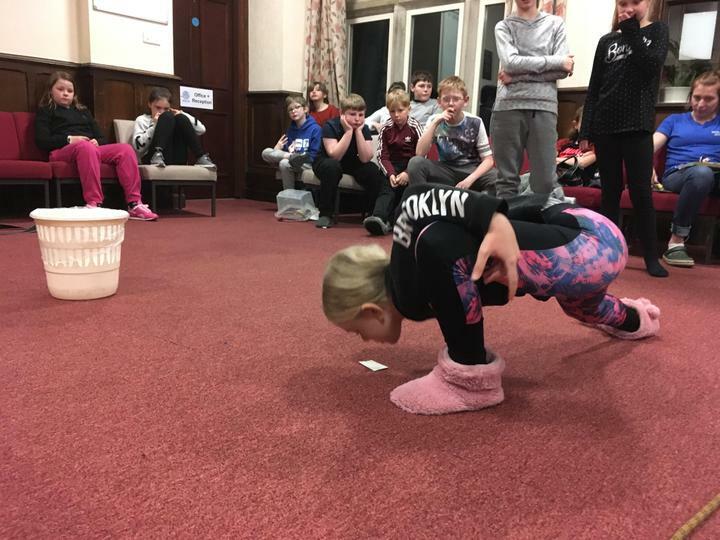 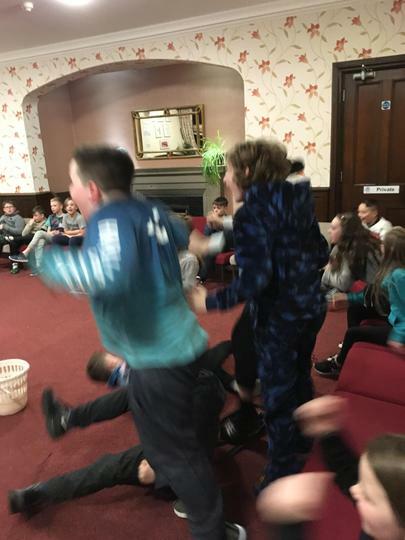 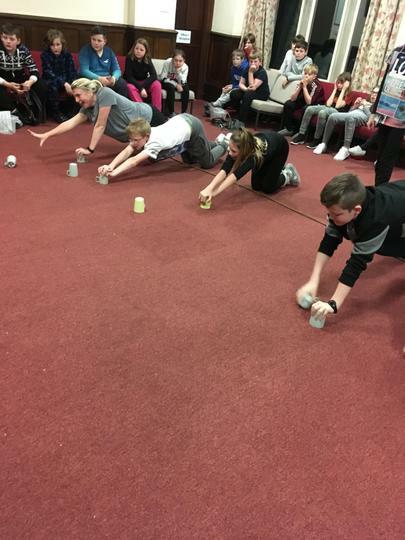 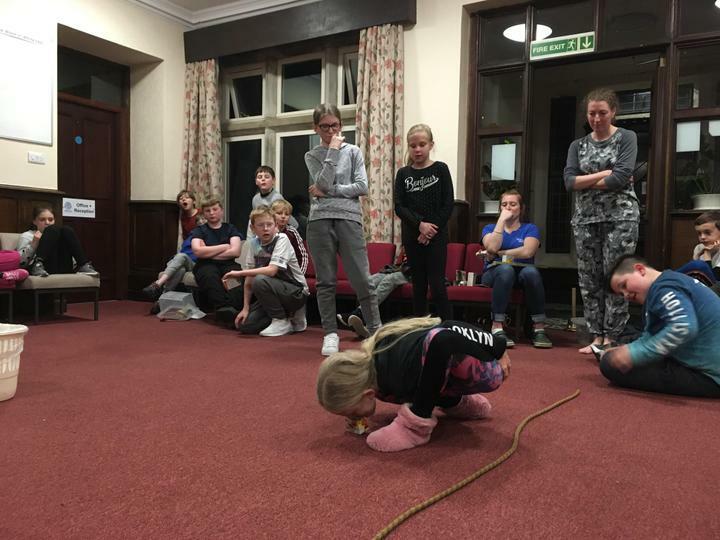 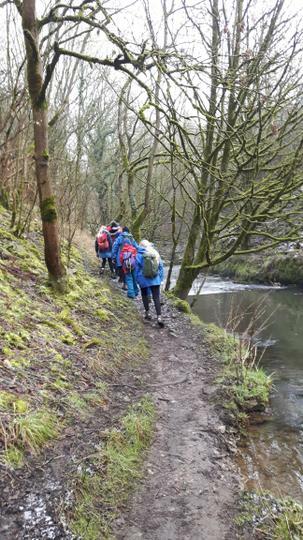 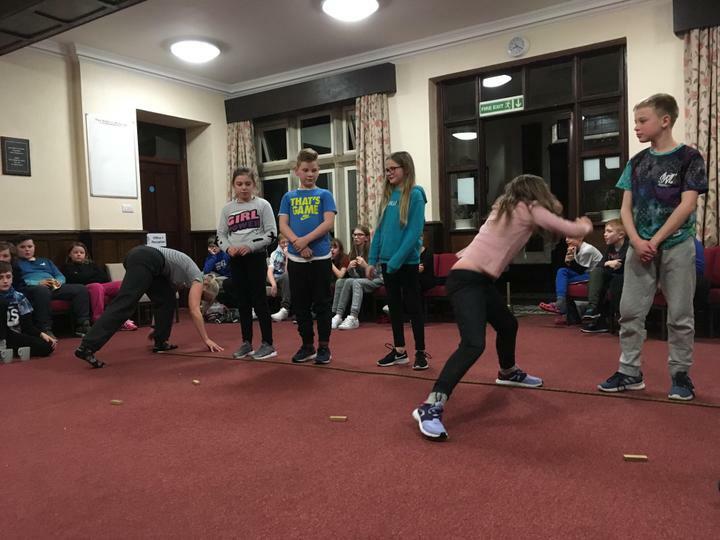 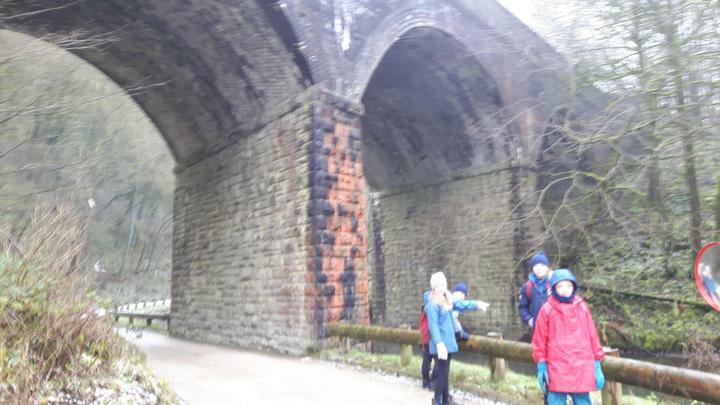 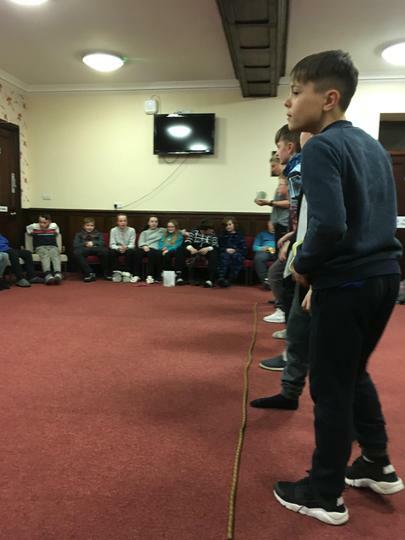 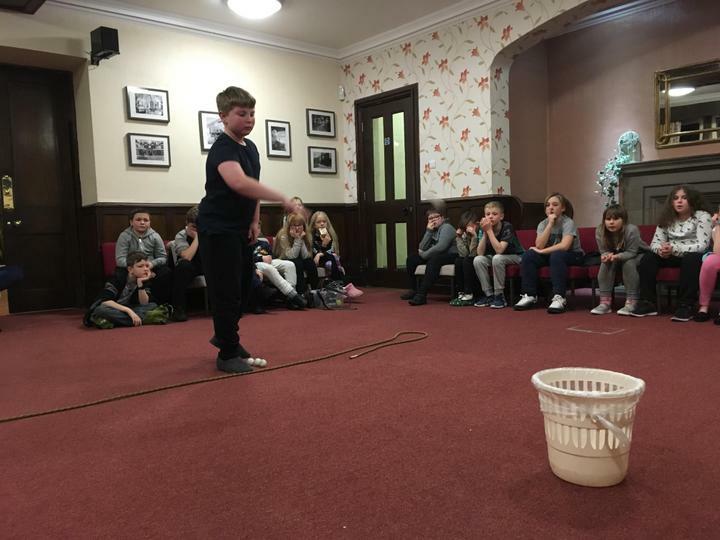 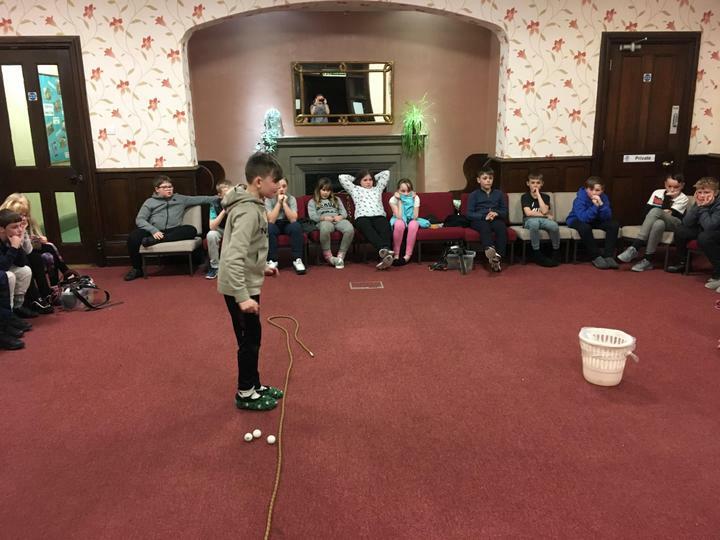 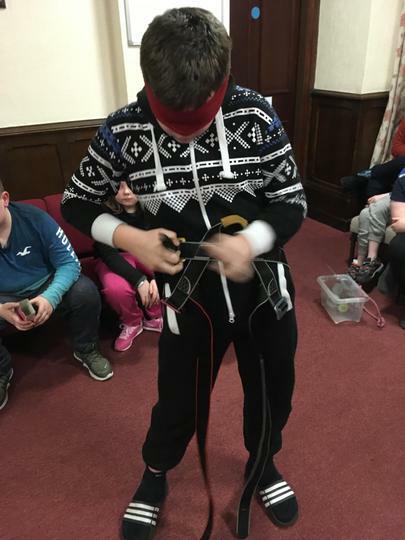 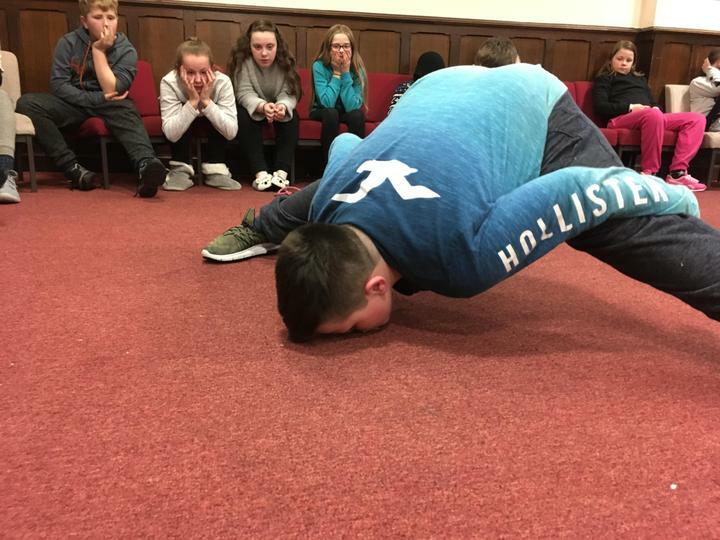 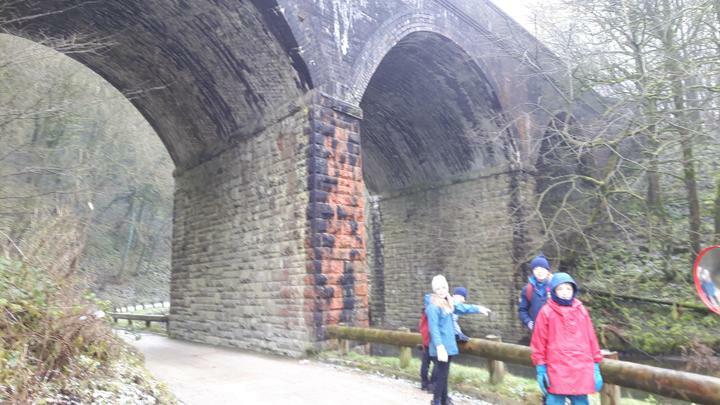 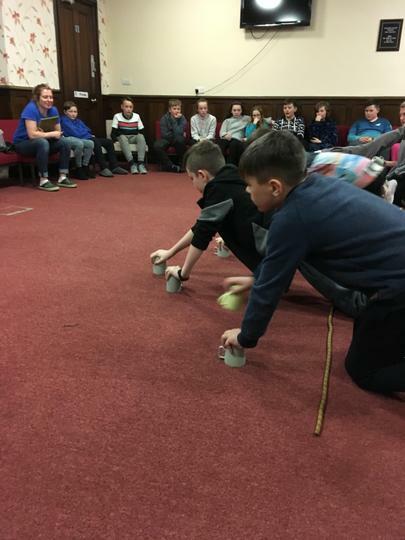 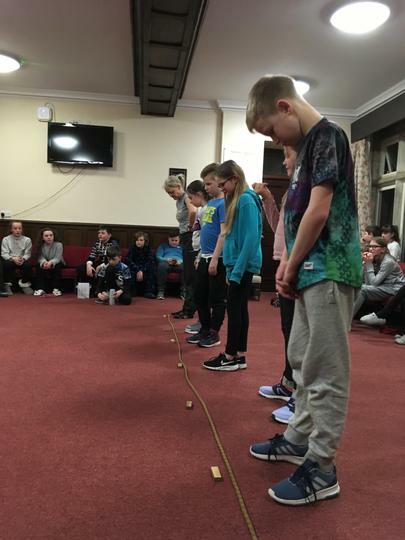 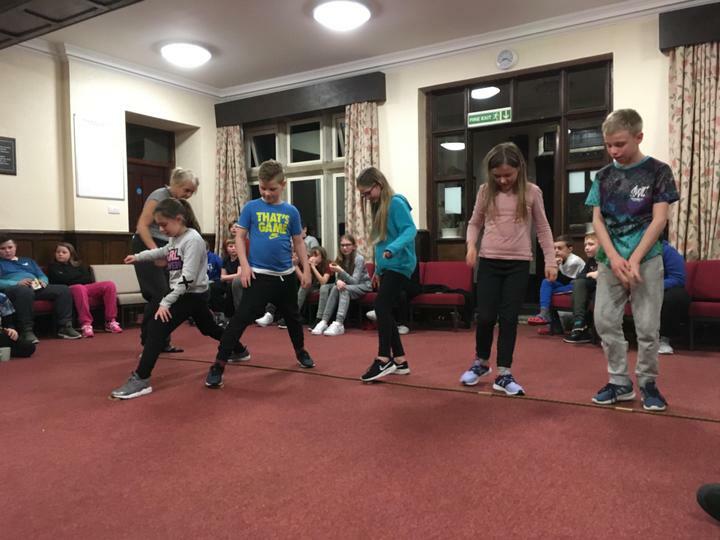 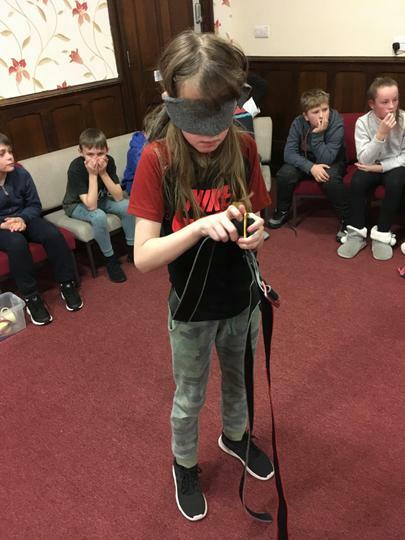 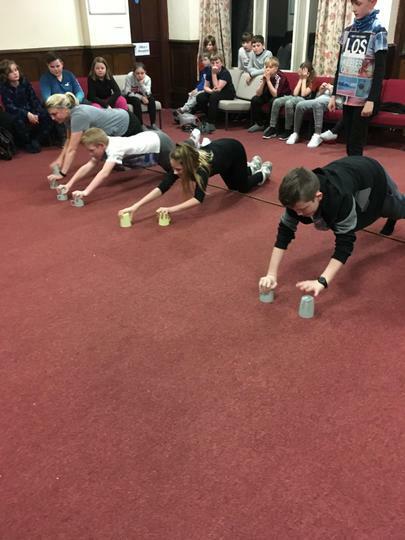 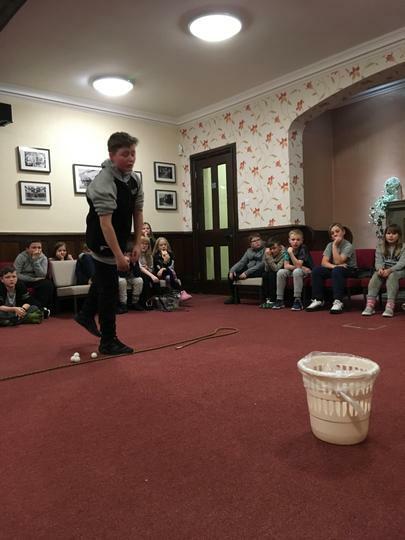 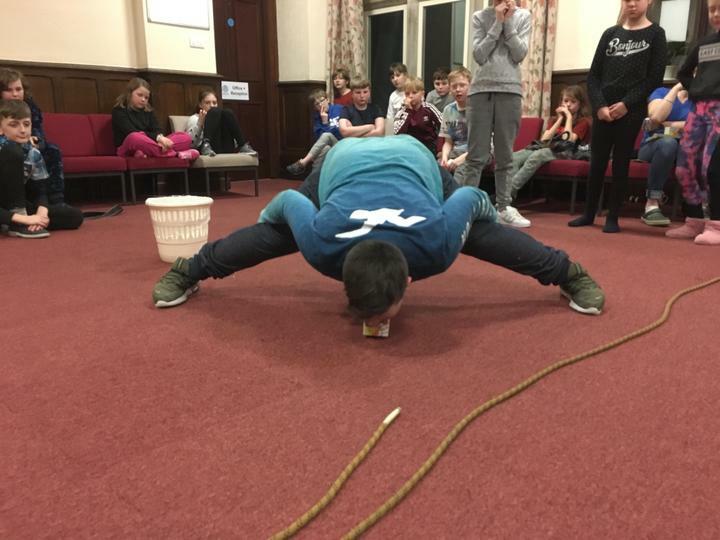 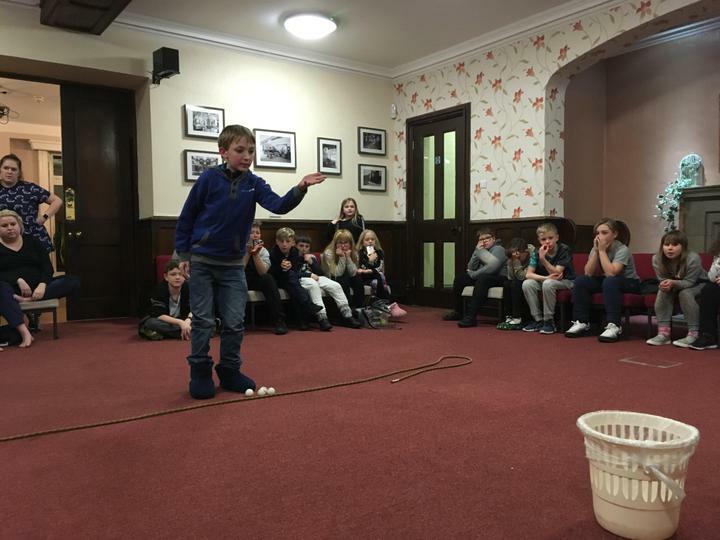 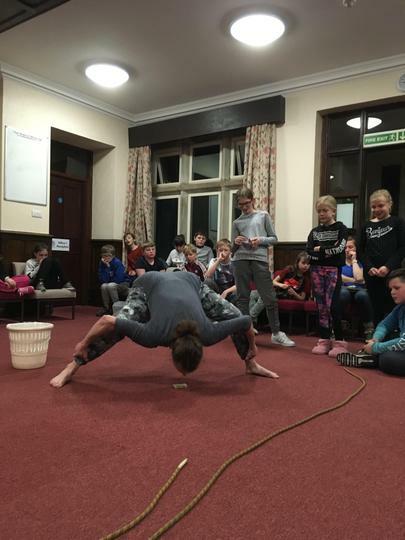 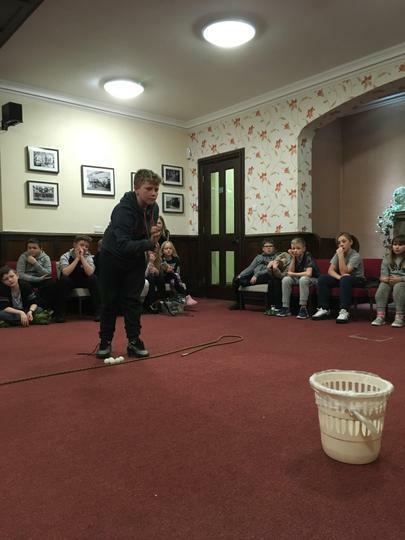 Everyone in our group has been enthusiastic and have shown great teamwork throughout the week. 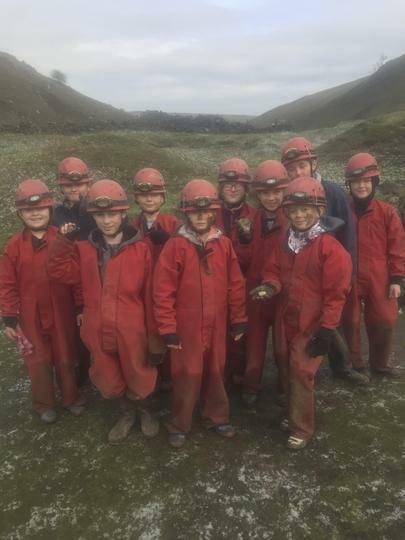 We’re very proud of all of them.